Katherine: Oooh stripes! And blue! And a hint of sparkle. And pointy ends! 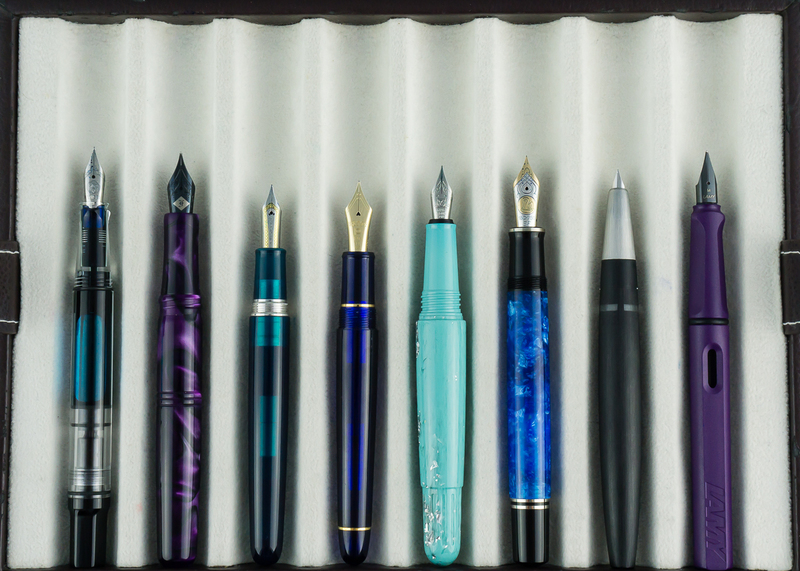 All the things I love in a pen. 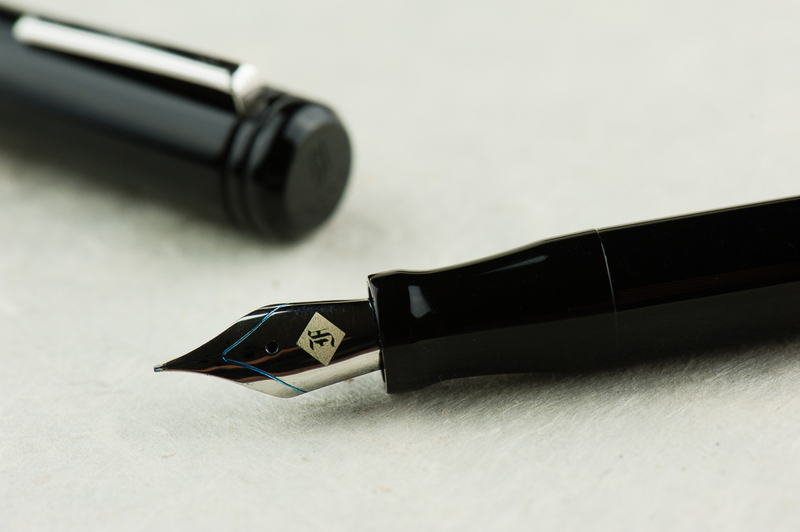 The shape is heavily reminiscent of the Nakaya Piccolo, and as with that pen, I love the clean lines and the small touches on this pen, like the gentle taper and conical ends. Franz’s example is particularly close to my heart because it’s both blue and striped, but I’m sure it comes in a variety of materials depending on one’s taste. 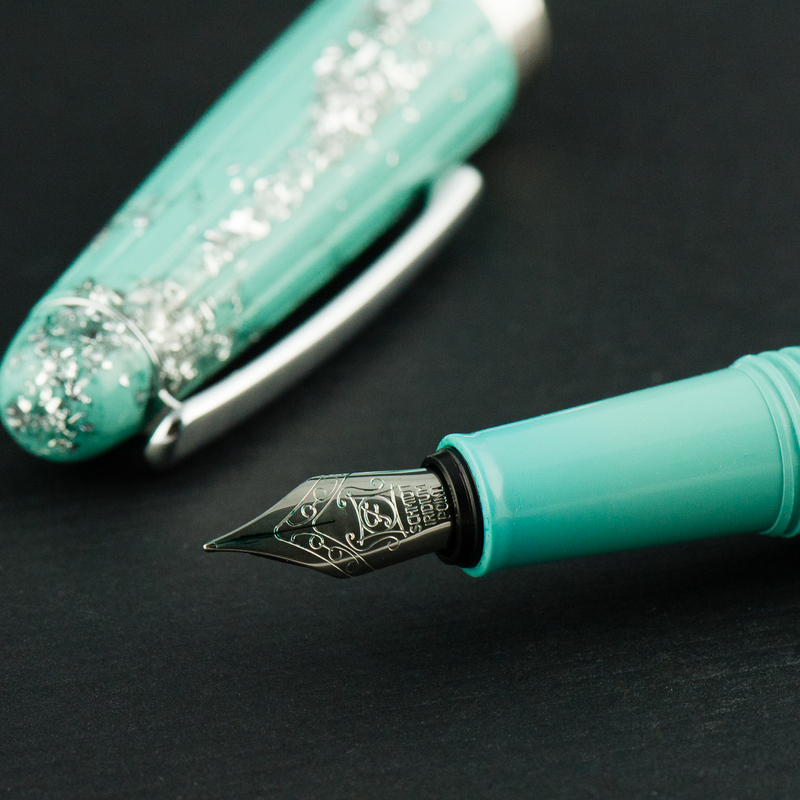 Pam: The Edison Pearl is a great flagship pen and a great example of their work. 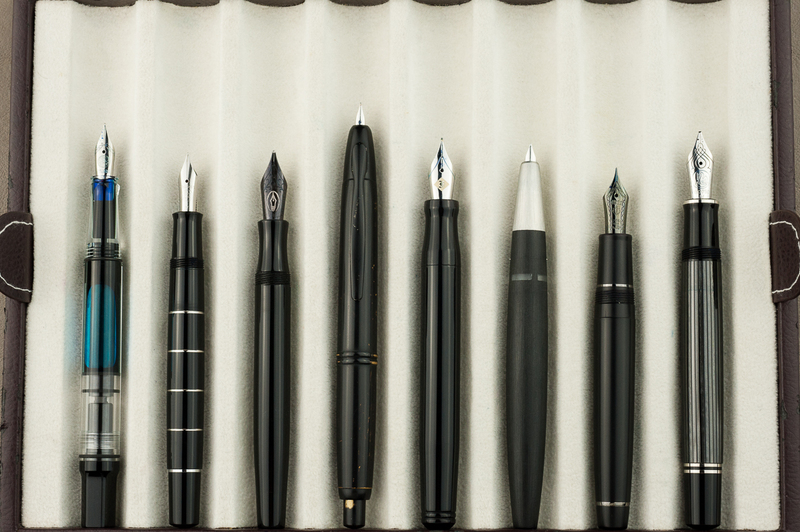 They take pride in their craftsmanship from nib to pen material. 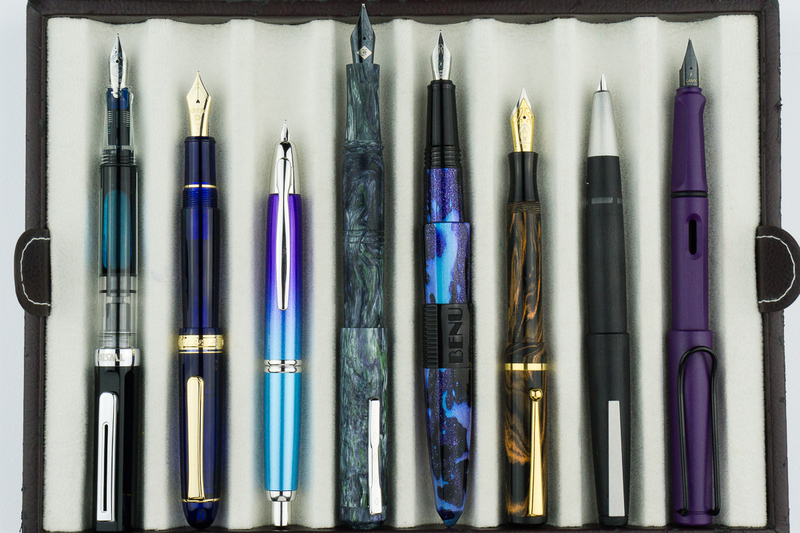 They were one of the first companies that I was made aware of as a newbie fountain pen addict that broke the mold using beautiful and unique acrylics. This particular material that Franz selected is absolutely stunning. The blue and gray stripes is a great compliment to this simple shape. 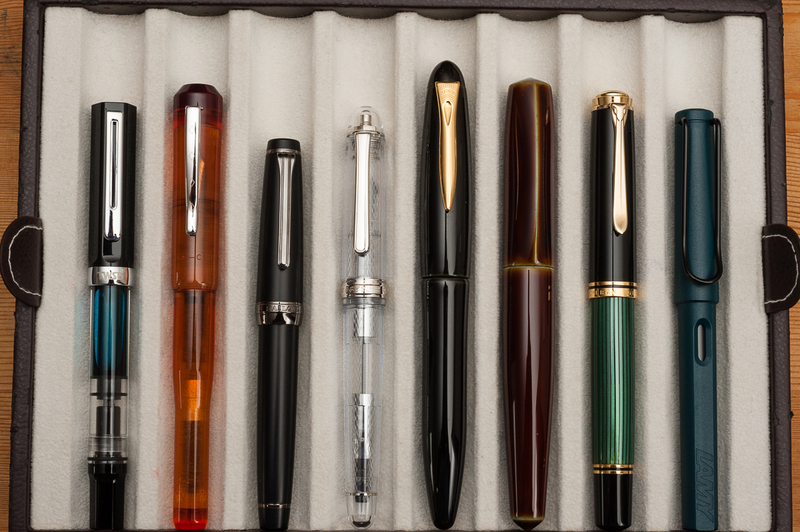 Franz: Fountain Pen Day 2013. Yep. 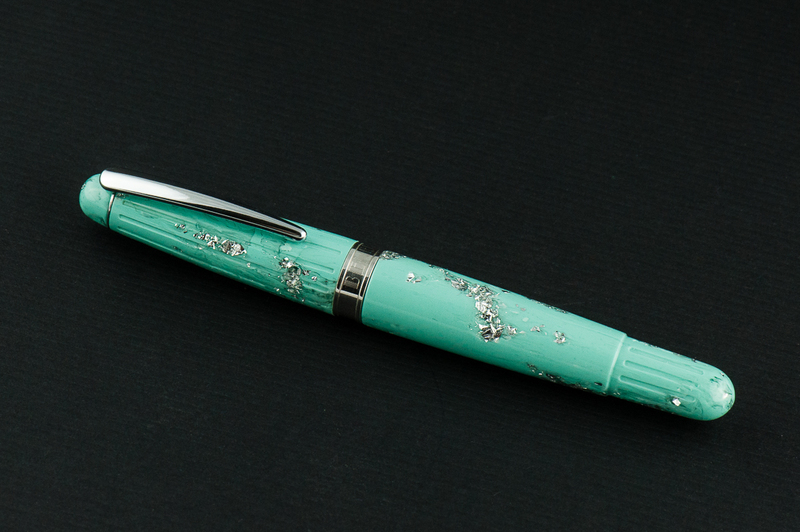 That’s what I call this pen because I got this from Edison Pen Co.‘s current inventory offering on FPD. I never held an Edison Pearl before but c’mon! 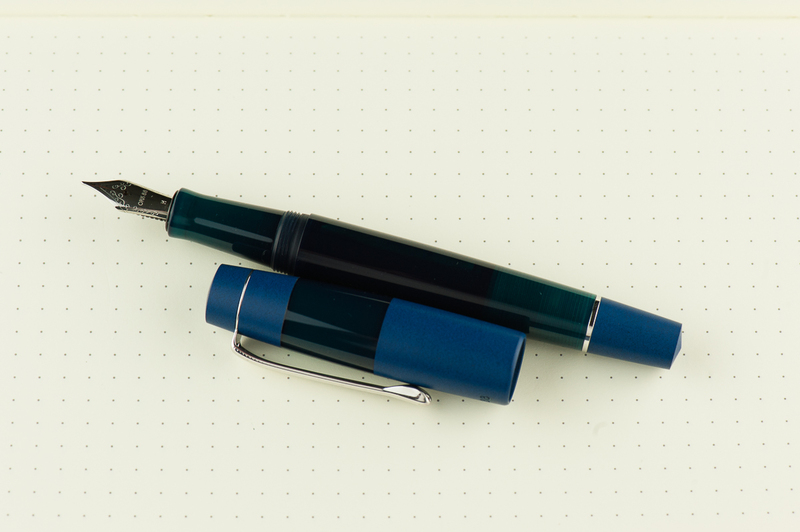 With the shape and the blue… I mean, the material, how can one go wrong? 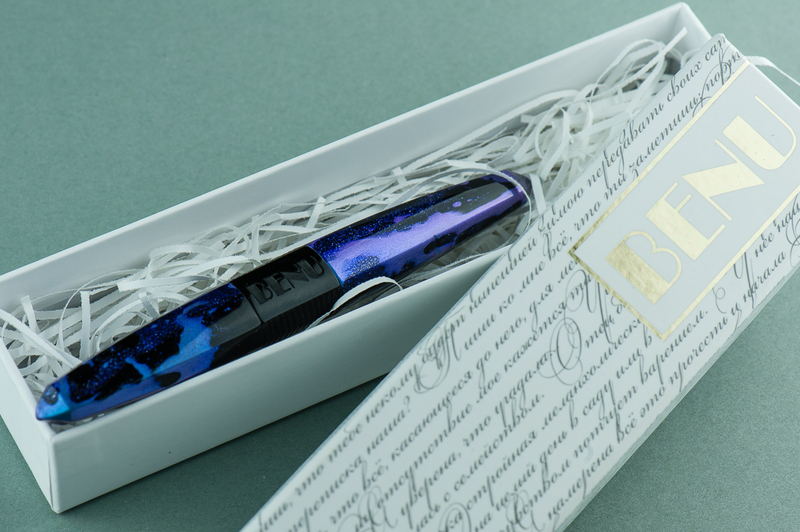 =) The Edison Pearl is part of Brian and Andrea Gray’s Signature Line of pens and you purchase one either by checking out their Current Inventory, or emailing them and ordering a custom one for yourself. 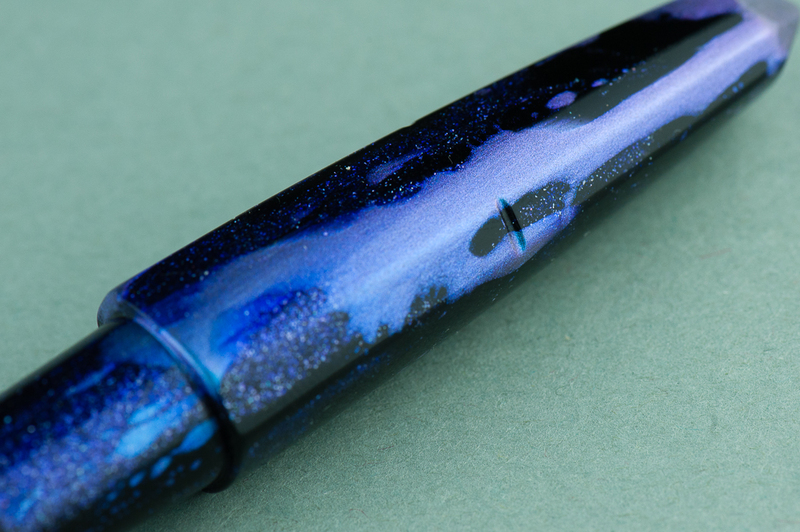 Katherine: It’s a Jowo holder, but Brian Gray tunes the nibs quite nicely. 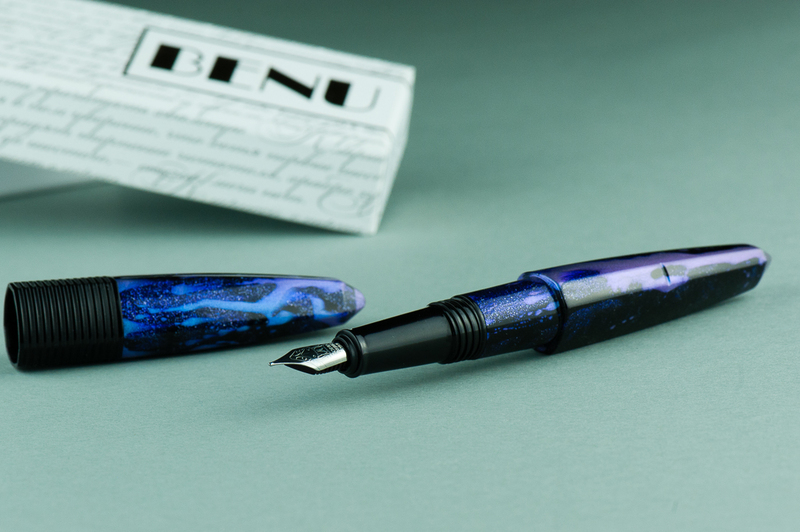 Franz has this one paired with a smooth wet Fine nib, but think of all the other fun nibs it could house! 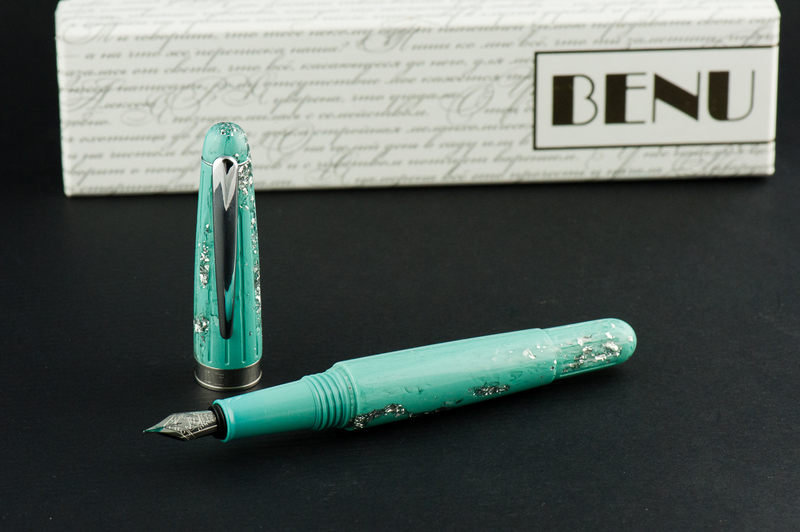 Pam: The fine nib is very smooth for its size and I find it touch glossy. A great compliment to Brian Gray’s tuning work. 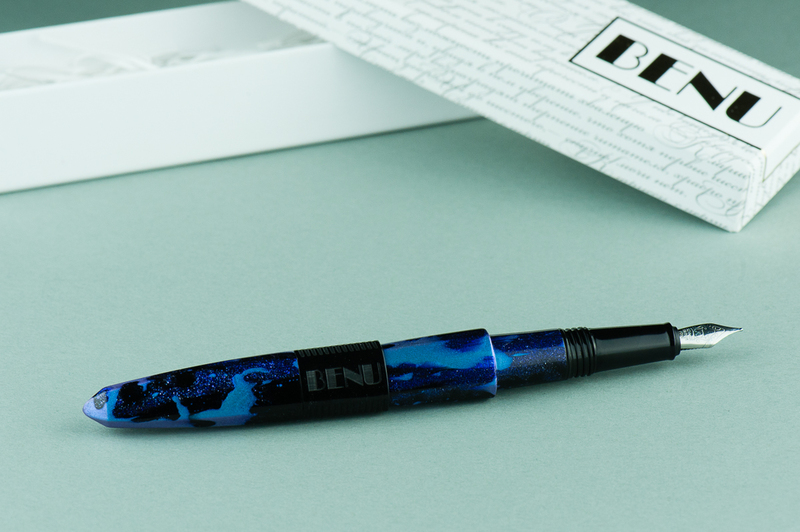 This is a great pen for those who would want to swap nibs. 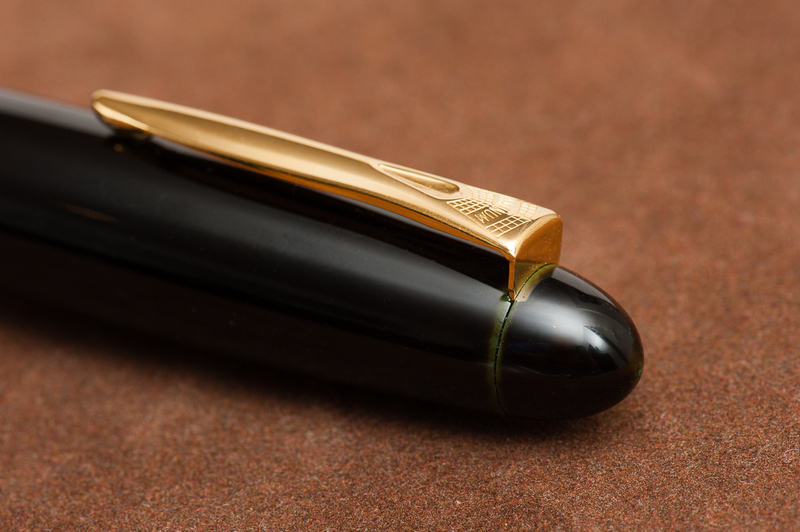 Franz: Originally, this pen came with a medium 0.9mm cursive italic customized by Mr. Brian Gray and I love that nib. 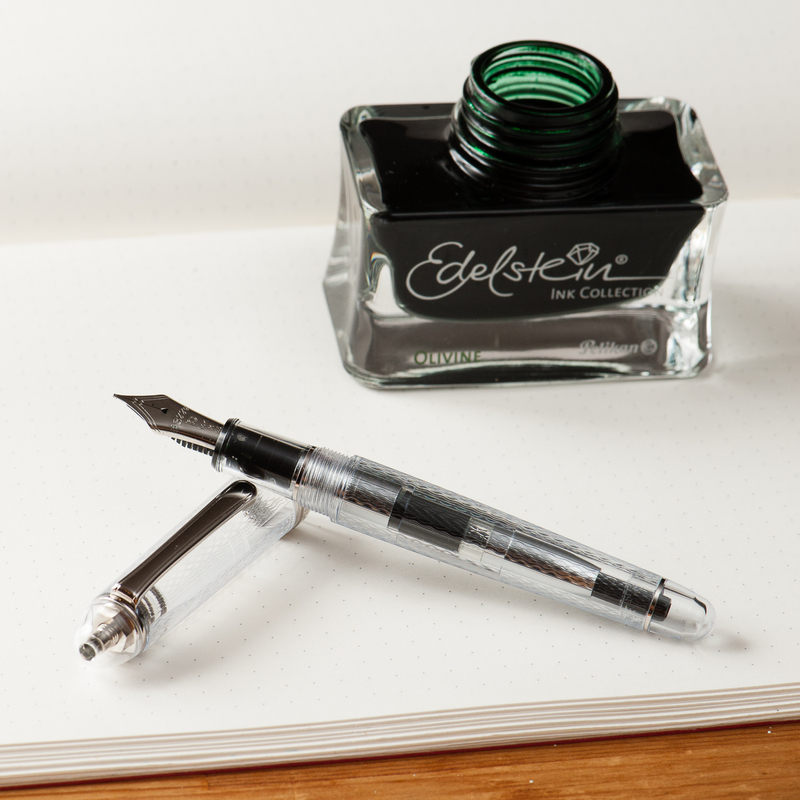 For this review, I just swapped it with a fine nib from another Edison Pen of mine. 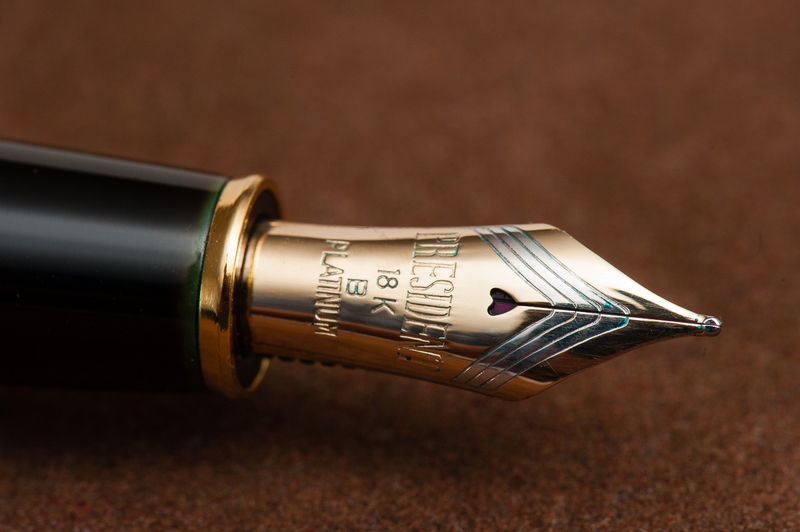 As with any well tuned nib, this fine is quite fine to write with. 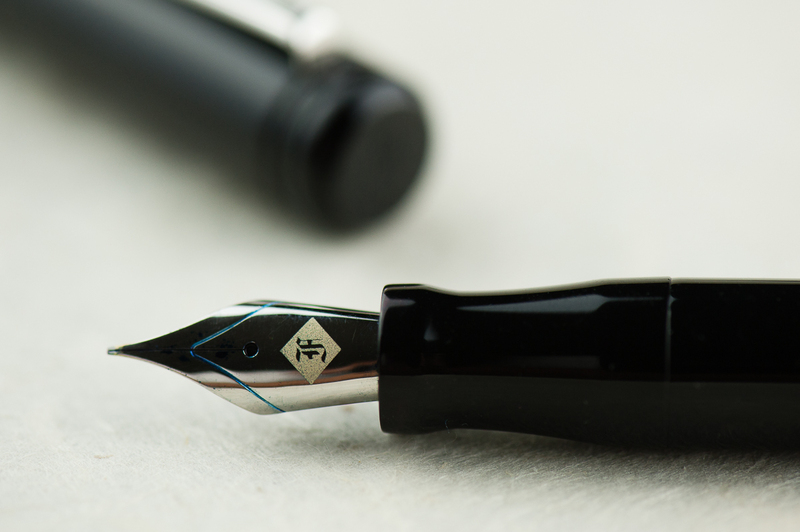 And I love how the nib (logo) within a nib looks! Katherine: The Pearl is comfortable, but the “waist” on the section is a little deeper than I’d prefer. With narrower sections like this, my thumb tends to creep “forward” as I write, and eventually I end up in a Pam-like coma-grip (probably still not a vise-like). Pam: I find the width of the Pearl to be quite comfortable. Alas, the threads fall right at where I would grip. The threads are not too sharp, but I am reminded that they are there if I grip too hard. 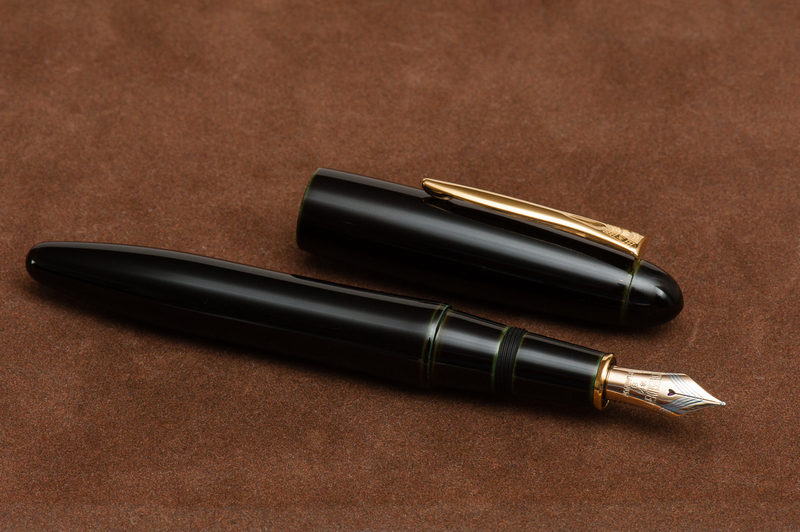 I don’t have too much contact with the waist of the section, and the section does widen to the width similar to the pen body. Franz: Like Katherine, I found the section’s concave design a little too thin so I always gripped it by the threads. The Pearl may have a girthy barrel but the length is a little short when the cap is unposted. 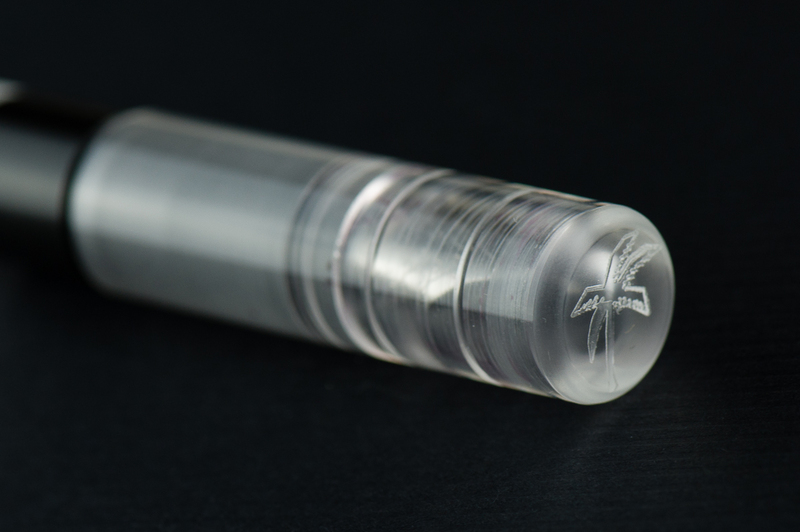 Unfortunately, the cap does not post securely and it makes it a bit too long. You can definitely see that in our hand comparisons above. But nevertheless, using the Pearl unposted, I’ve written a couple of letters and lots of pages in my journal. The shorter length definitely gives me some fatigue but it’s fairly adequate for my bear paw. Katherine: The Pearl takes one and three fourths turns to uncap, and has a solid clip. Overall, no complaints from me on carrying this pen daily. 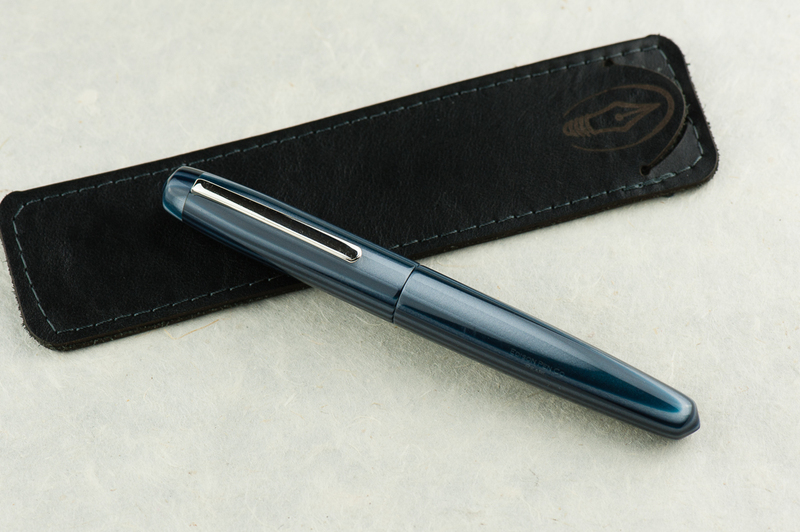 Pam: This pen is a great pen to for regular carry with a small number of rotations to uncap and a professional looking clip. 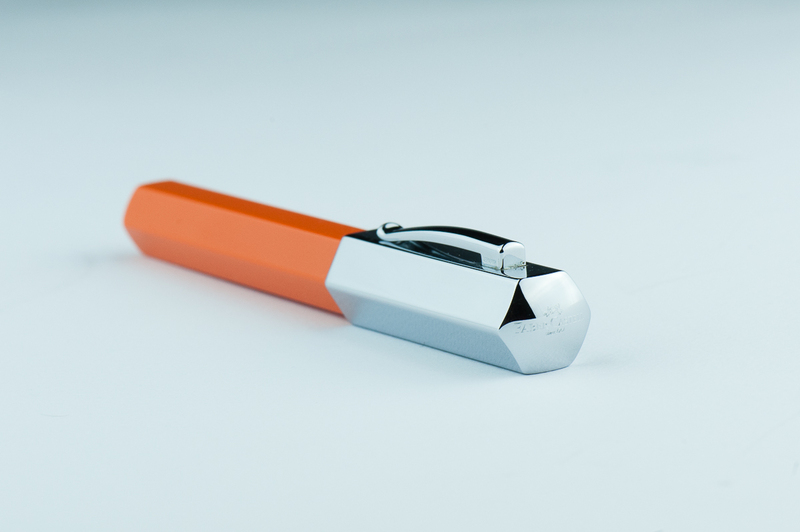 I think this would be a very adventurous pen in the office! 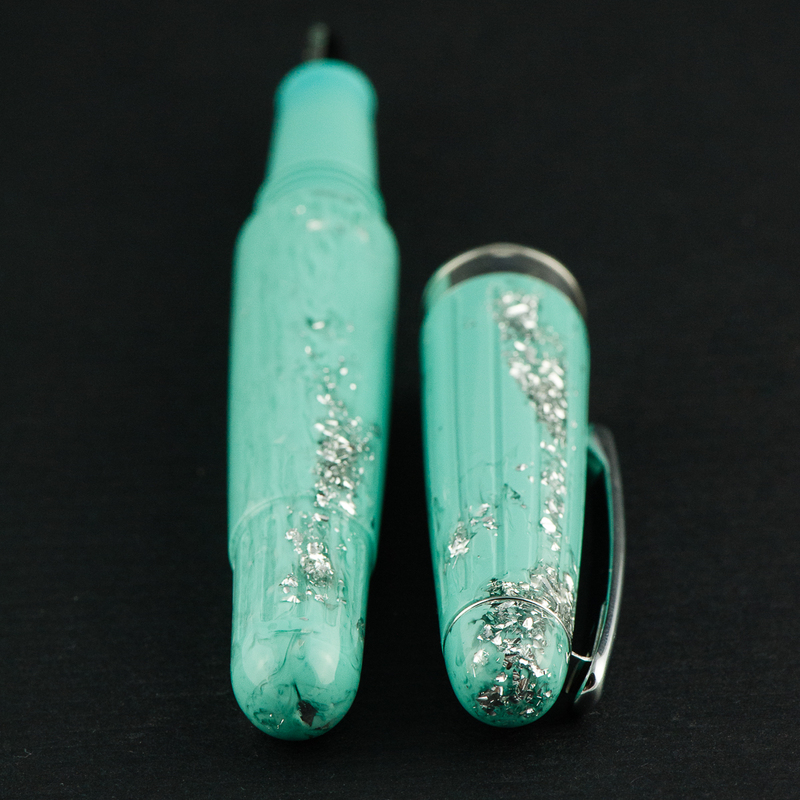 Franz: I’ve used the Pearl for journaling, as well as in the office setting. 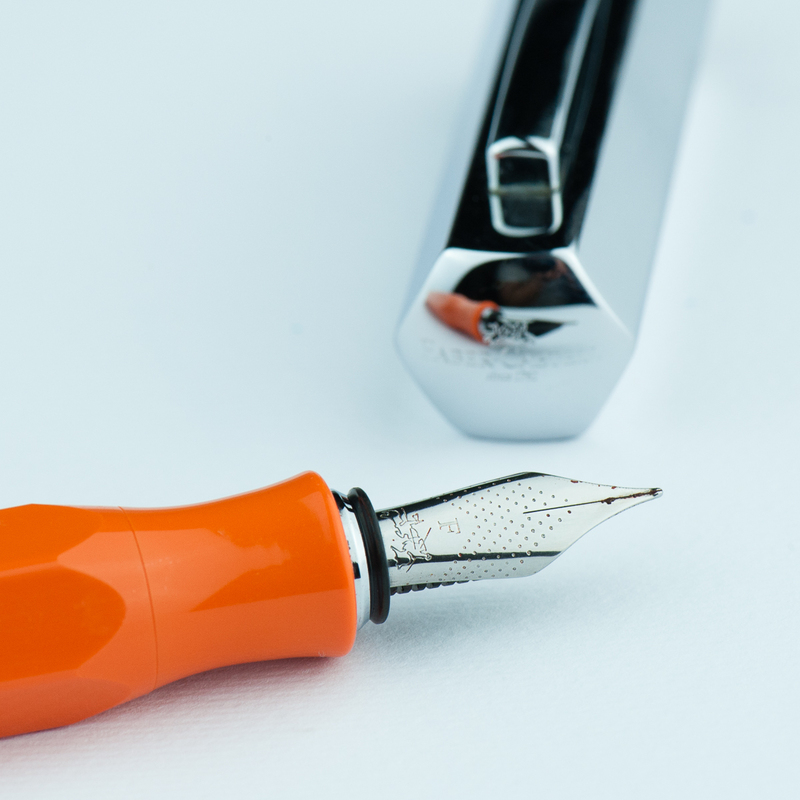 The original 0.9mm cursive italic and the fine nib currently installed writes nicely on cheaper copier paper. 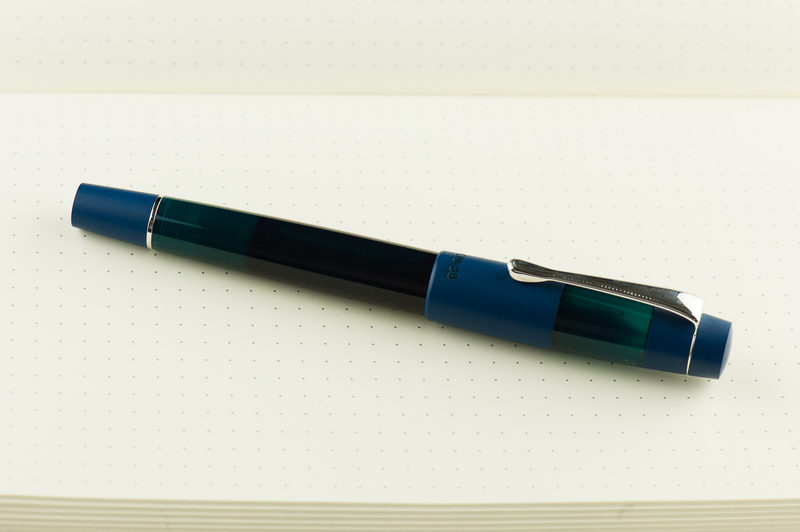 My personal every day paper is Tomoe River and I enjoy the fine line for practicing some tiny writing. 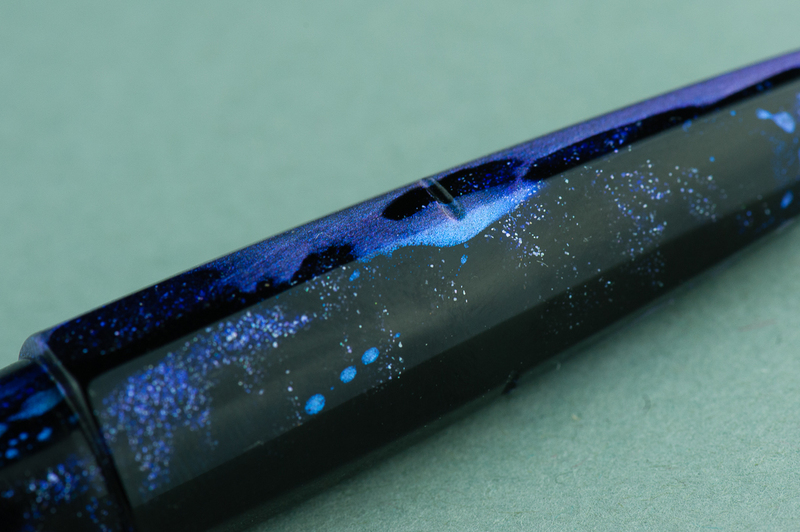 Katherine: Section aside, this pen is reminds me a lot of a Nakaya Piccolo, except in a much wider range of fun materials and lots of nib choices. 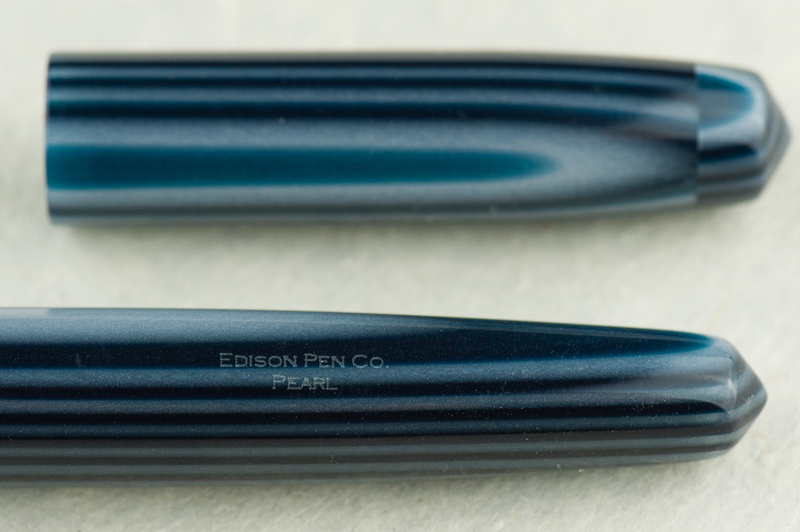 Additionally, since the Pearl is part of Edison’s Signature line, it’s customizable — so you could get one at a Piccolo length, or a longer one if you have oversize hands. 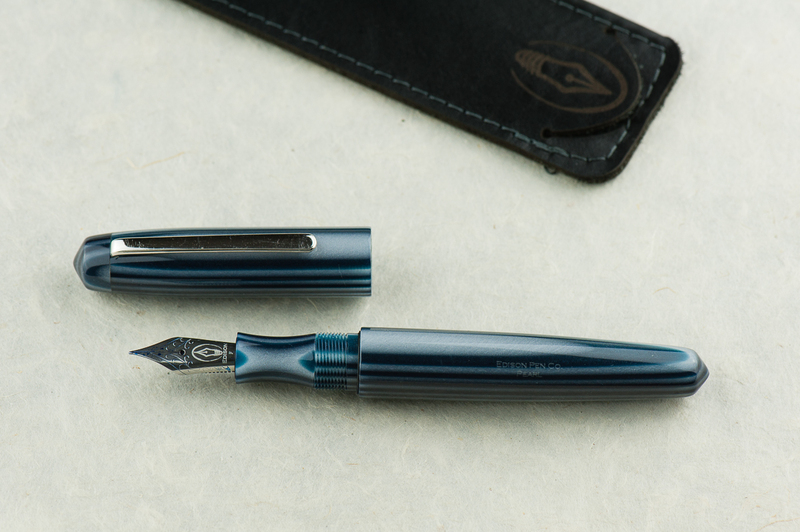 As with any customizable pen, it all comes down to your preferences — but as a base, the Pearl has great (to me!) shape and is very well made and immaculately finished. 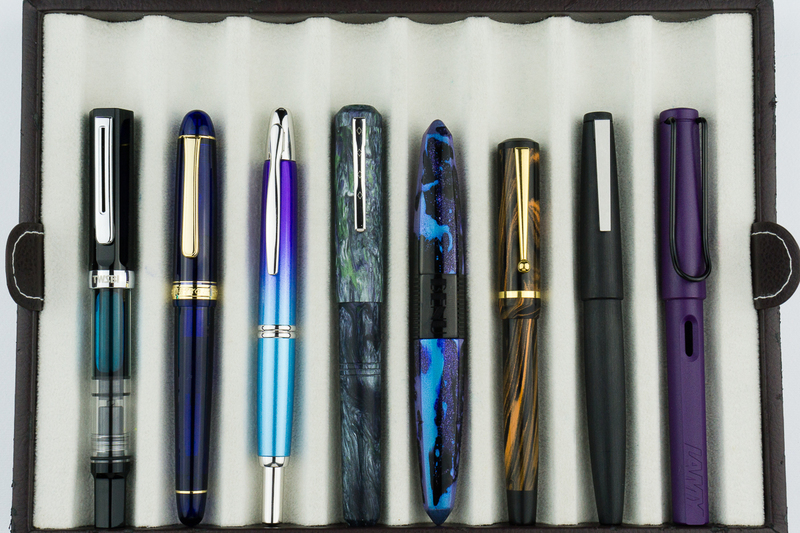 Pam: I love custom pen makers. 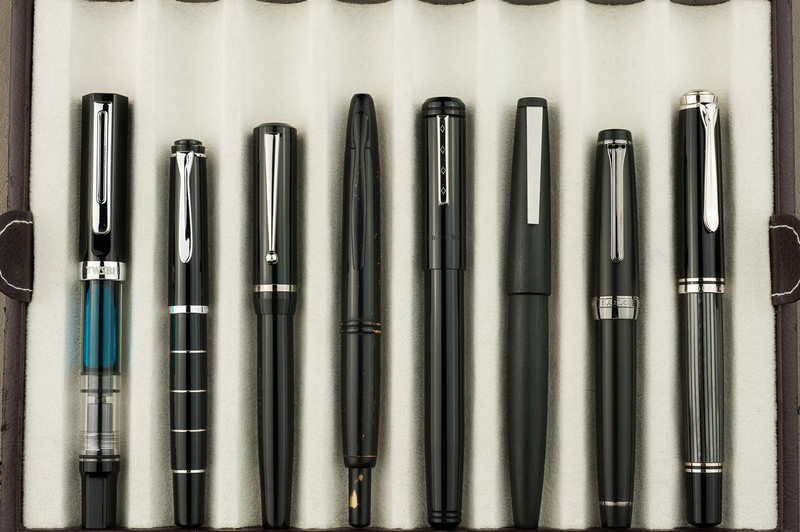 In a world where we obsess over the perfect shade of ink, the feel of nib and line widths; a customizable pen is ideal. 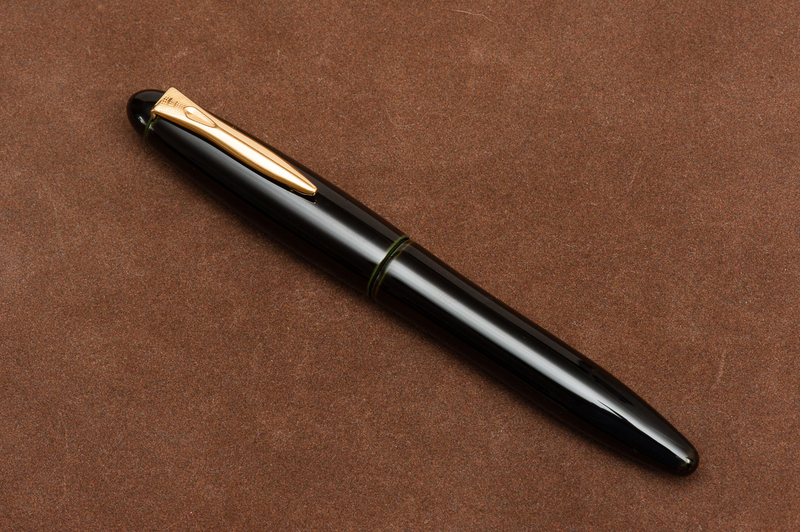 I would recommend this pen for those discerning individuals who enjoy building their own pen from a great maker. 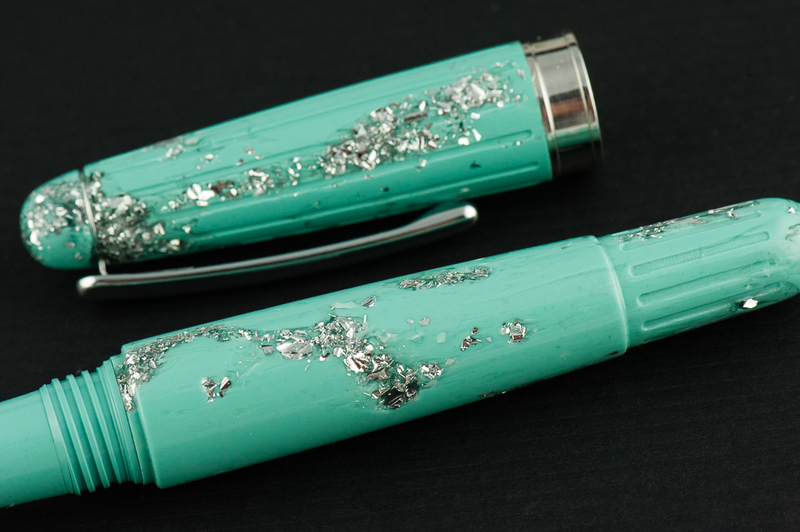 Franz: The Edison Pearl is a fantastic example of Edison Pen’s quality of pen making. 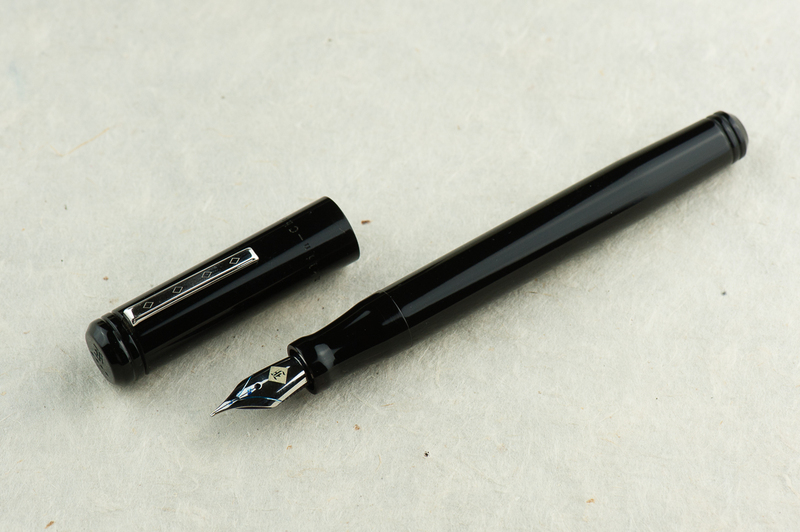 I’ve had this pen for five years now and even though it’s not a pen always inked up, I keep it in mind when rotating pens. 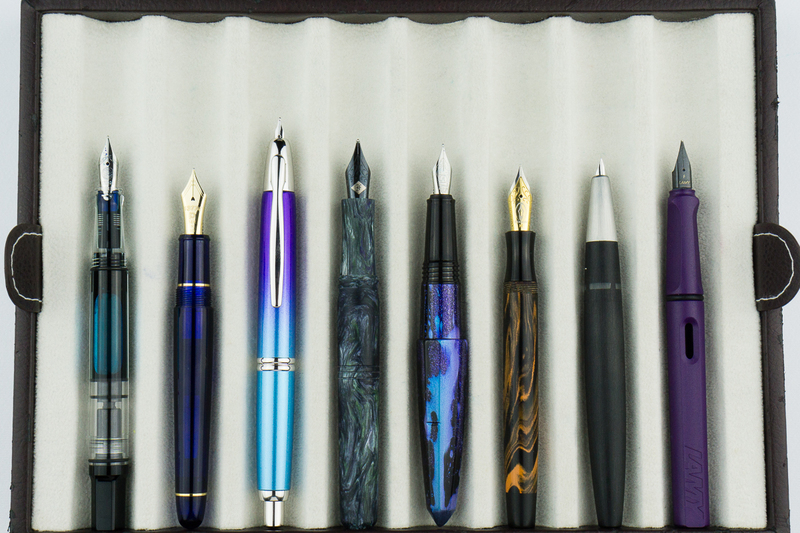 Katherine: I love short and chubby pens — so the Kasama Una is right down my alley. 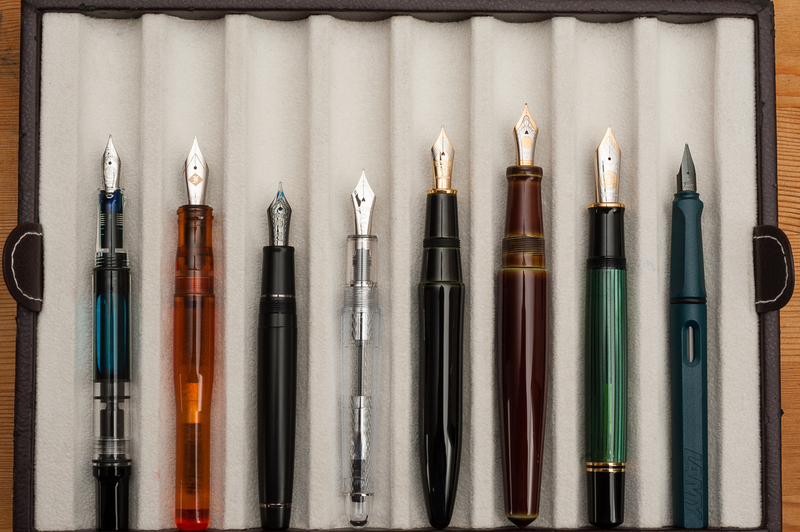 I also love demonstrators, despite not owning too many, so that’s another check mark. When Kasama first started selling the Unas, I was a little disappointed that they had delrin sections, instead of being entirely translucent, but now that I’ve spent some time with it, it’s grown on me a lot! Pam: I am so glad that Franz and Katherine are my gateways to the awesome pen and stationary community in the Phillipines. 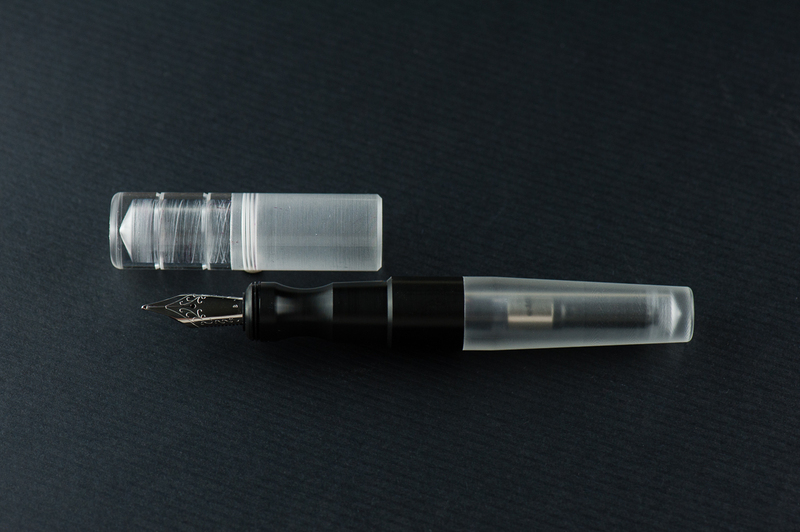 The Kasama Una is a very modern pen with the translucent and black material. 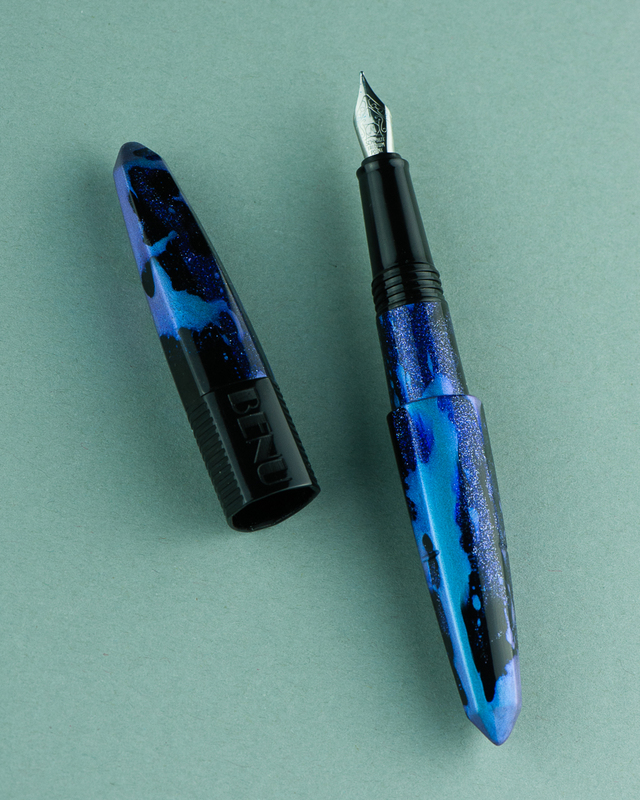 The acrylic feels good to the hand, and the section is Delrin which feels fantastic. It feels warmer than the acrylic in my opinion. 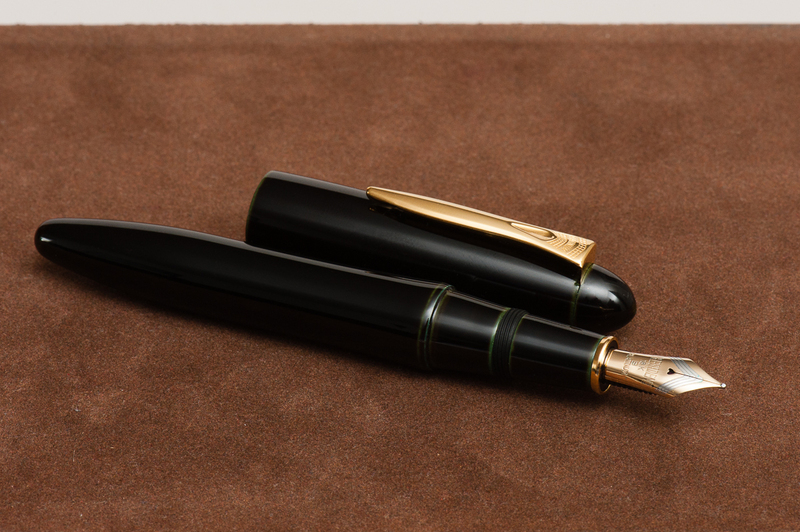 The shape of the pen seems disproportional to me at first glance, however, after picking it up, it makes a lot of sense. 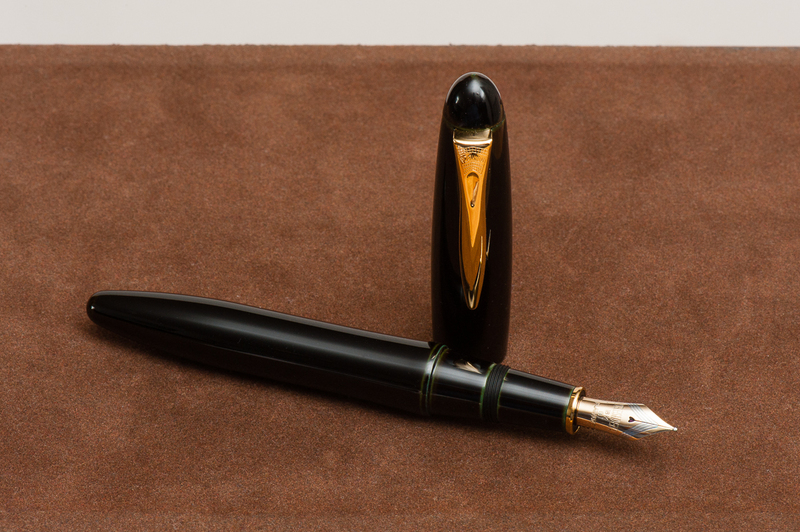 The cap adds to the oversized nature of the pen, however, the pen body itself is proportional in your hand. 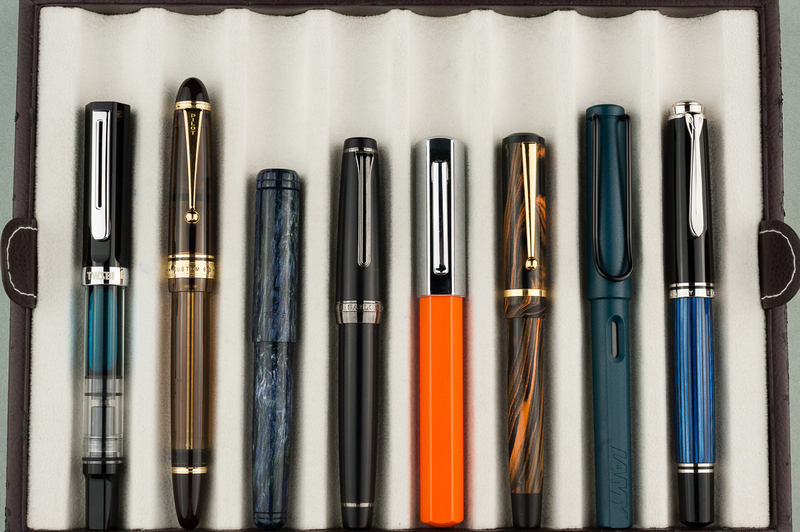 Franz: One of the things I love about this pen hobby is being able to check out cool things either in terms of design or materials. 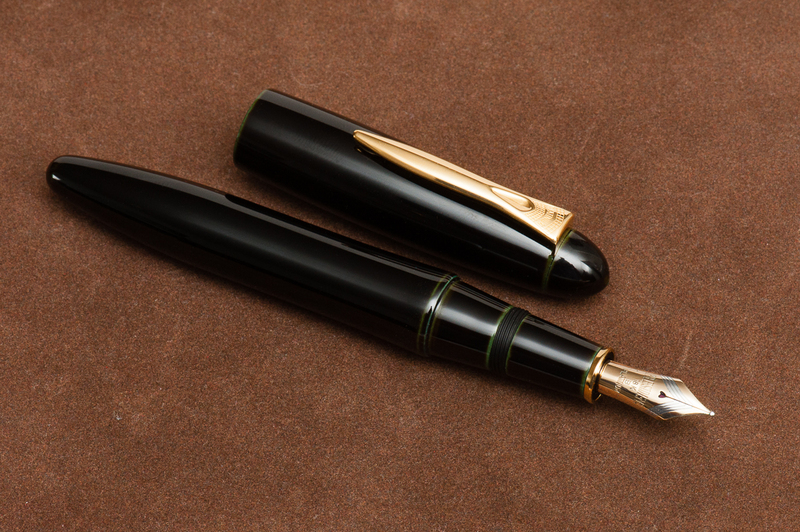 And this Kasama Una fountain pen definitely piques my interest in both of those aspects. Honestly, what drew my attention to this pen is its section. It’s oddly shaped, weirdly ergonomic, and that delrin material is prrretty cool! Actually, it seems that the Kasama folks created the pen around the features of the section (see their post on Instagram). 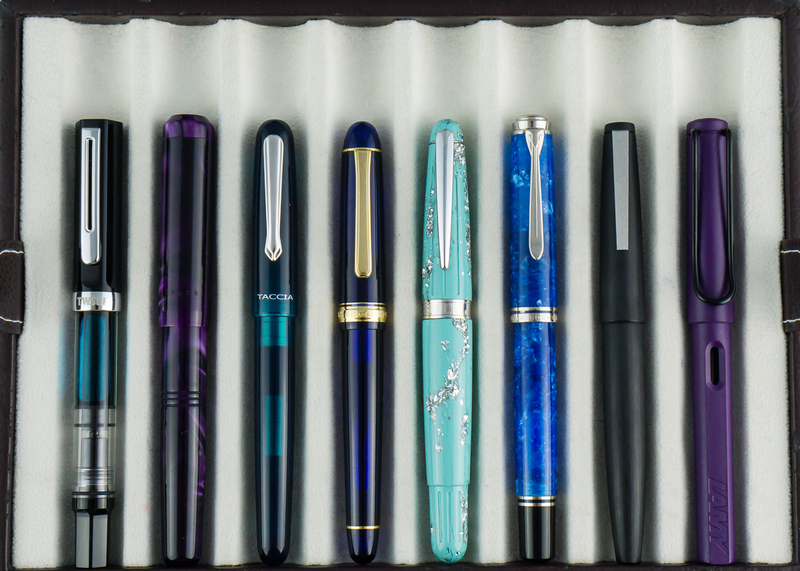 As Pam mentioned, Kasama is a new pen company from the Philippines and they create these Una pens in the Philippines as well. Kasama is a Filipino/Tagalog word that can mean a multitude of things depending on its usage and context. Some of which are: companion, fellow, friend, being included, or being in one’s company, etc. 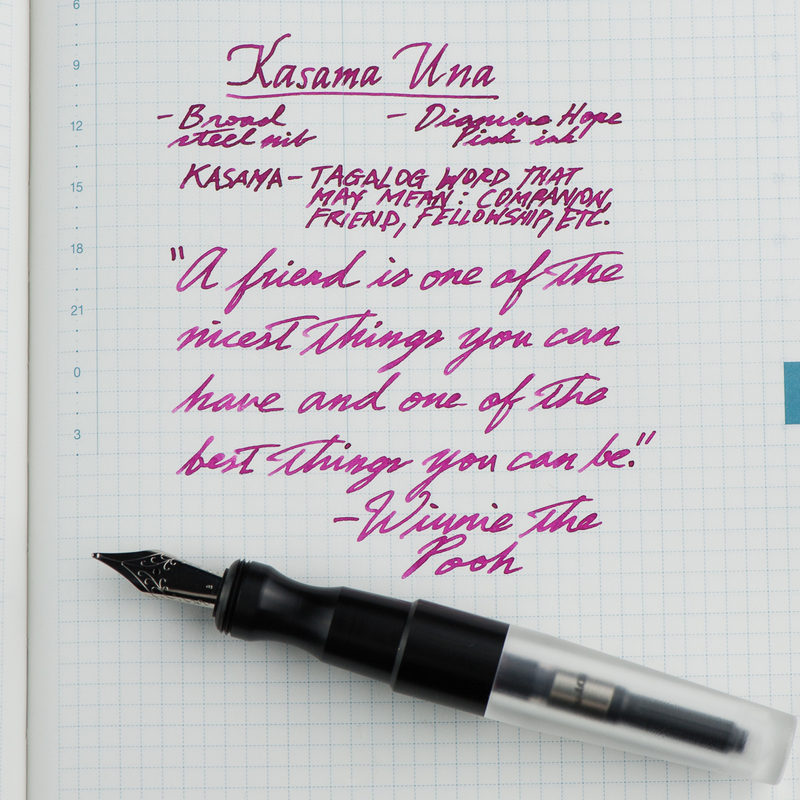 Una in tagalog means first which is befitting since this is Kasama’s first fountain pen. The Delrin section shows very fine lines however they are smooth to hold. 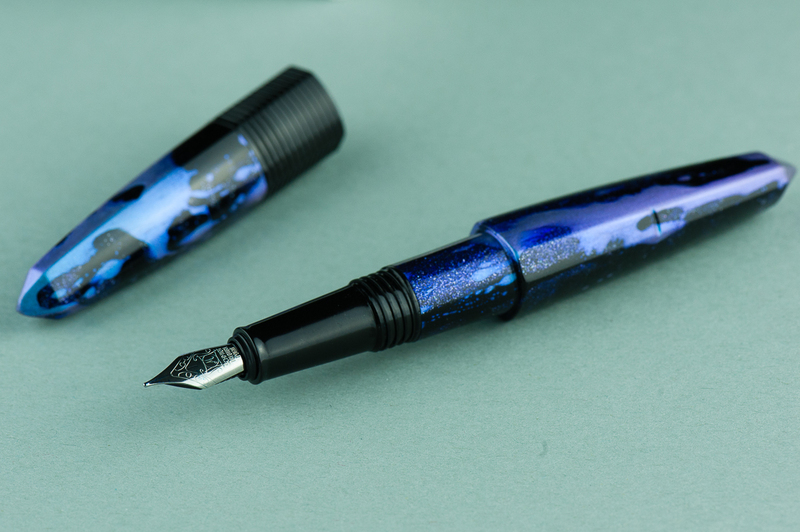 Katherine: It’s a Jowo broad that’s super smooth (I’m not sure if they did any tuning work, but I know they do grinds on some nibs). Not my favorite width, but Jowo threads are standard, so I’m excited to swap it out after this review is done. 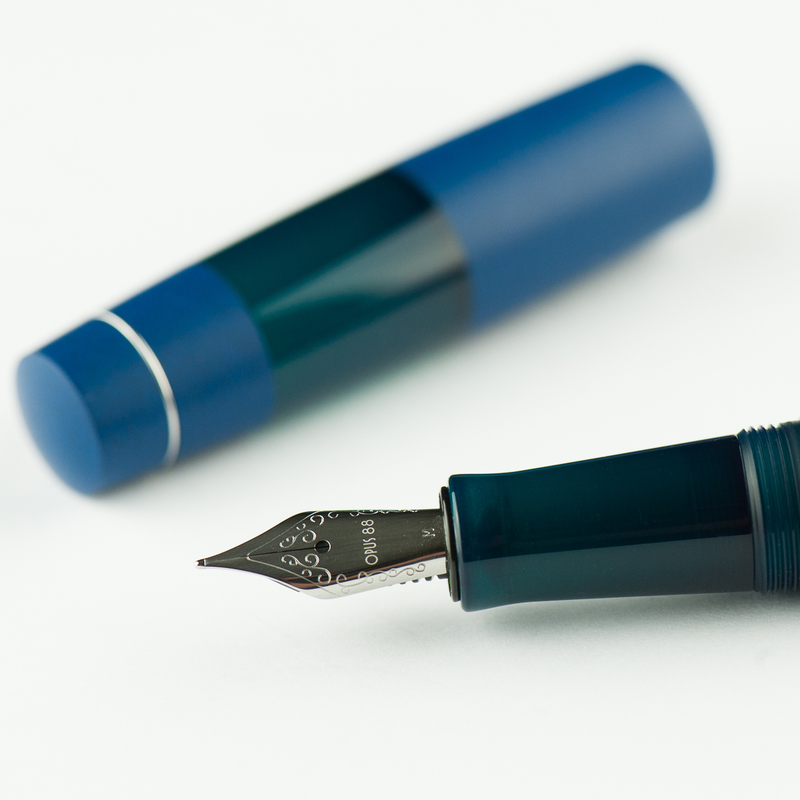 Pam: The nib is a stock Jowo broad nib that is glass smooth. It performed well and provided a well saturated line. Not much variation from the standard quality of the Jowo nibs in terms of stiffness or performance. 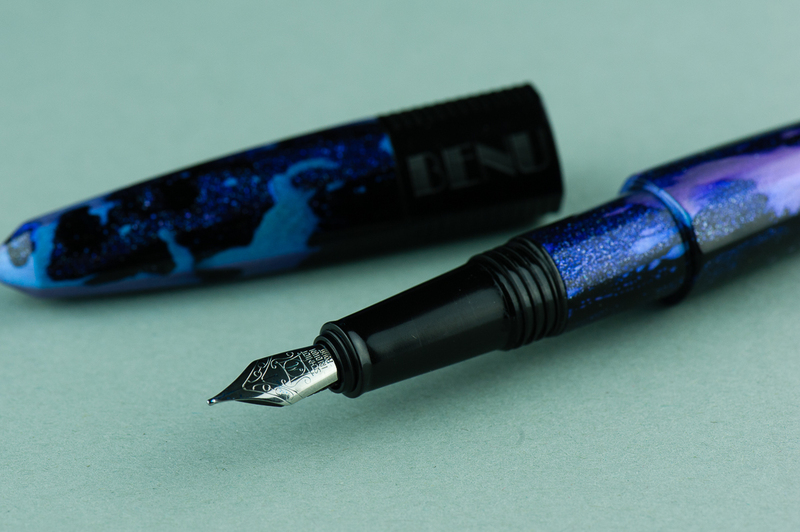 This nib is just smoother than usual so I am not sure if it was tuned or not. 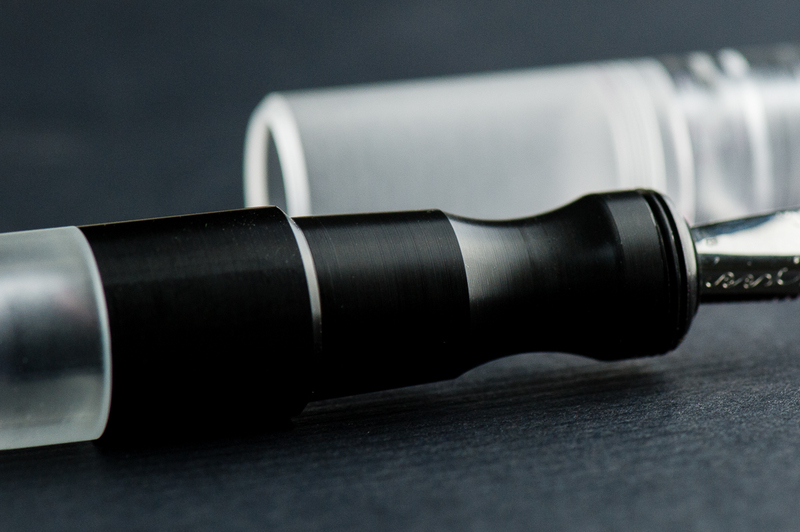 Franz: Perfectly tuned broad and juicy nib. 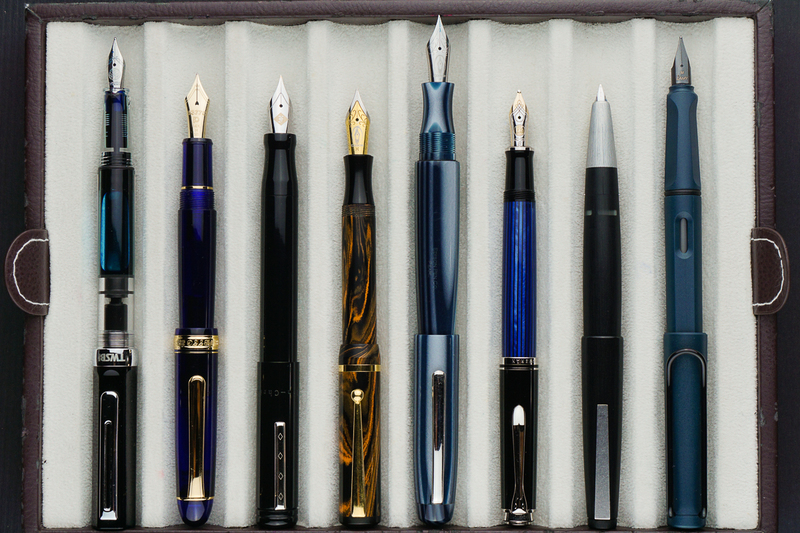 And I love me some broad nibs! 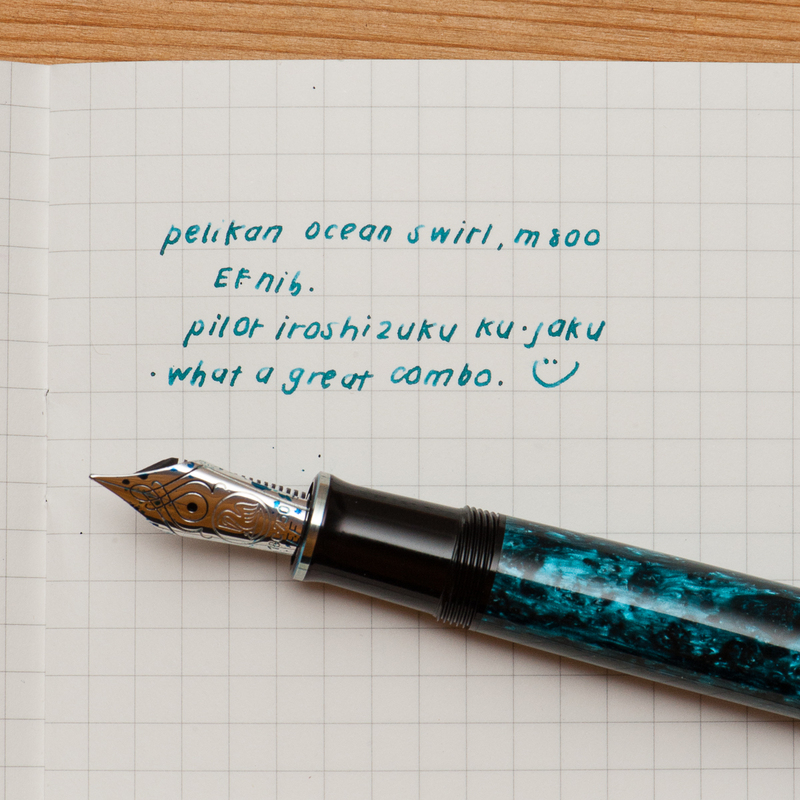 =) And yep, being a Jowo nib you can swap it with other similarly sized ones. Katherine: I suspect the Kasama Una’s shape will be pretty polarizing. It has a very deep waist where you hold the pen, so this either works for you or it doesn’t. Personally, it works great for me and is very comfortable, but I’m not surprised it doesn’t work for Pam. It does force me to hold my pen at a reasonable distance from the nib though, versus my natural tendency to hold pens further forward. Pam: I had a really hard time wrapping my hands around this pen, literally. The Kasama Una has a cap that encapsulates the section as well. 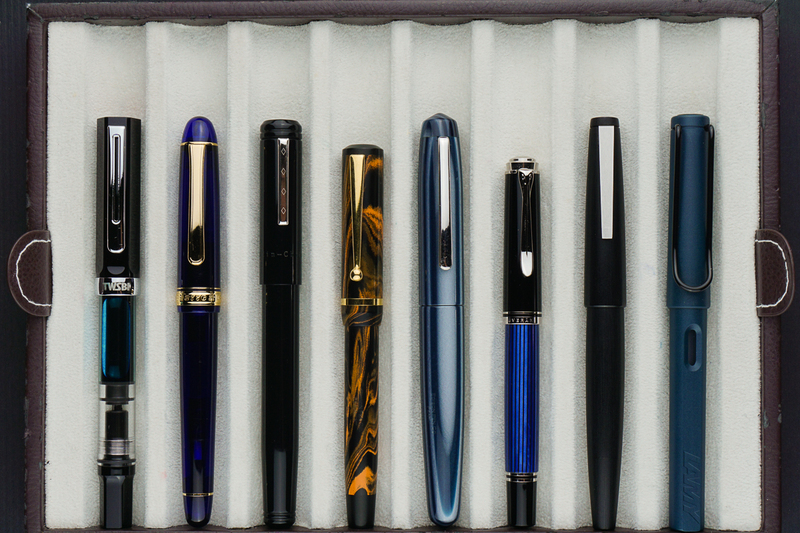 It leads to the step being higher up on a pen than most pens. The step is very smooth so it doesn’t bite into the flesh between thumb and pointer finger, but it is noticeable and can be annoying. The section has a pretty deep groove that is super comfortable for the tripod grip but gets wonky for me in my tiger fist grip. Adding to the comfort of the tripod grip is the extra width to the pen. 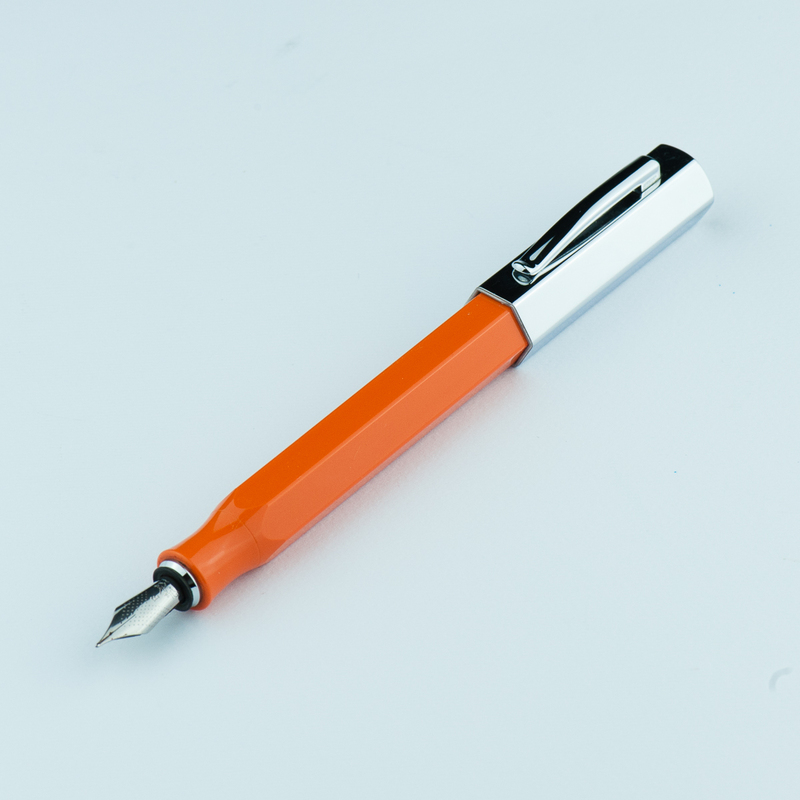 Franz: Writing with the Una is quite enjoyable since it is on the larger side of the pen scale. 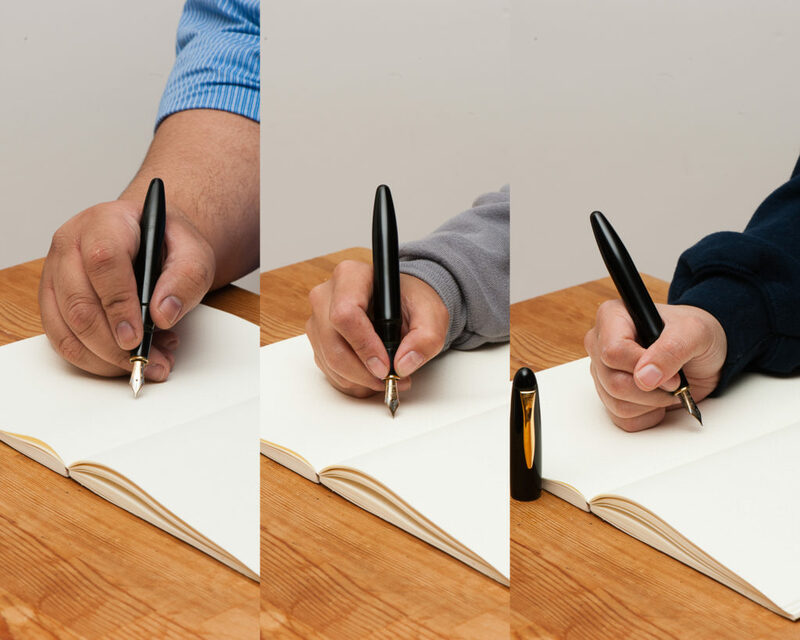 What won me over is how comfortable the pen’s section is even if my grip lands on the pinched area. Either when the cap was posted or not, I wrote effortlessly for a long period of time. A thing to note, the cap posts deeply however sometimes if it’s not secure it becomes lopsided or may even come off while writing. This could be user error in my part because I also didn’t want to use force since it wasn’t my pen. 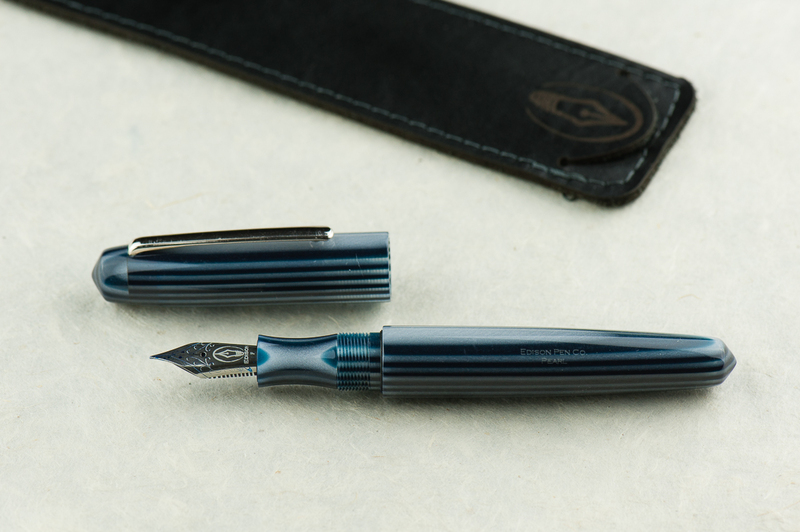 Katherine: Totally EDC-able, though I don’t remember offhand how many rotations it takes to get the cap off — I think two? Ish? 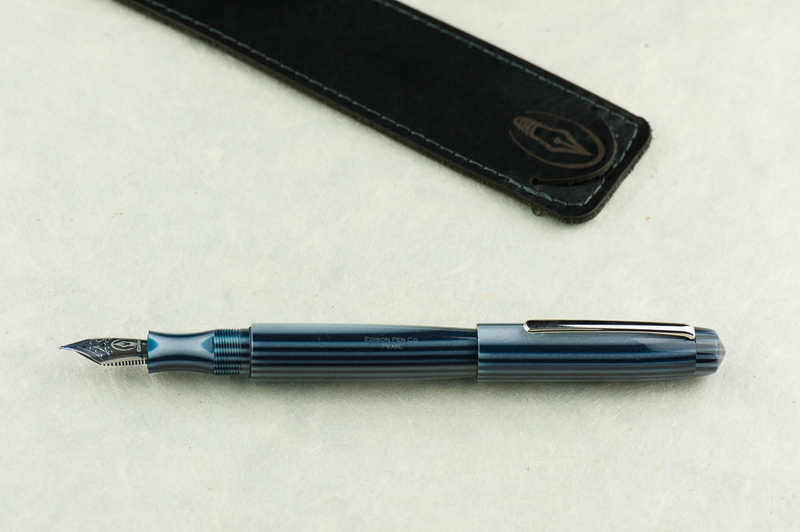 Either way, it’s an easy to carry pen that has a rugged aesthetic that suggests durability. 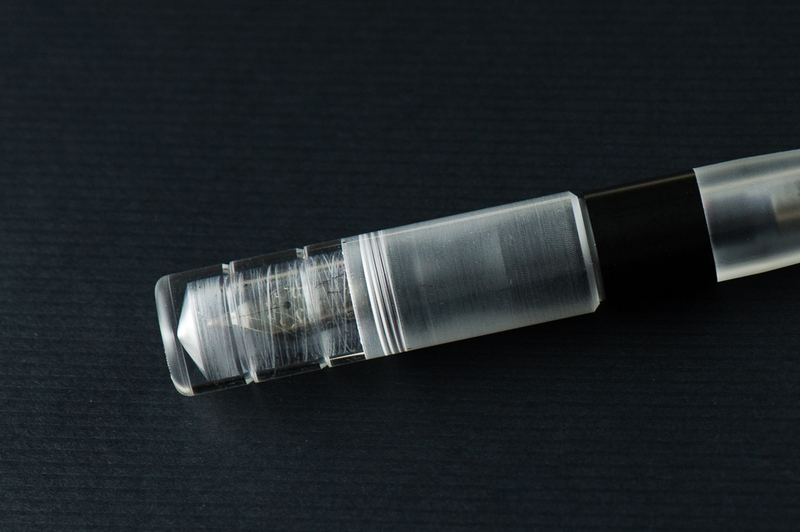 One of the later editions of this pen was made from ultem, a super durable plastic — I have one on the way, drop test here we come! Pam: This pen won’t be lost in your pocket, clip or no clip. There wasn’t a drop test but the acrylic body does appear to be of high quality. 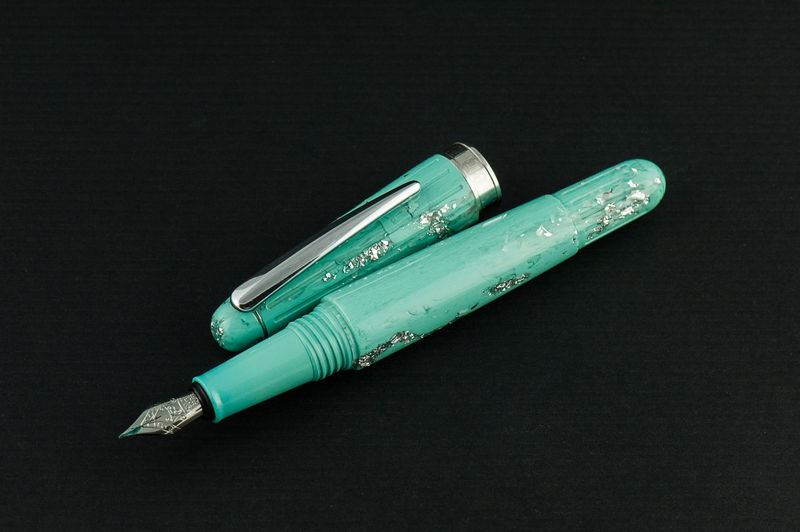 Scratches may be more evident on the material and finish. 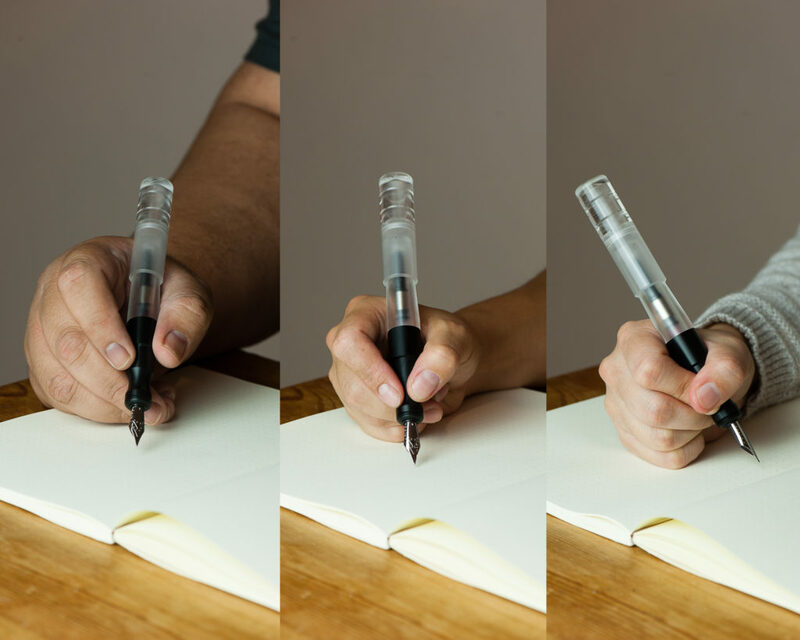 It only takes about 2 turns to uncap the pen so it’s a great pen for pick notes if you can spare two hands. My only gripe is that the body section can also unscrew as you attempt to unscrew the cap depending on the force applied. It’s because the threads for the body and the cap are cut in the same direction. 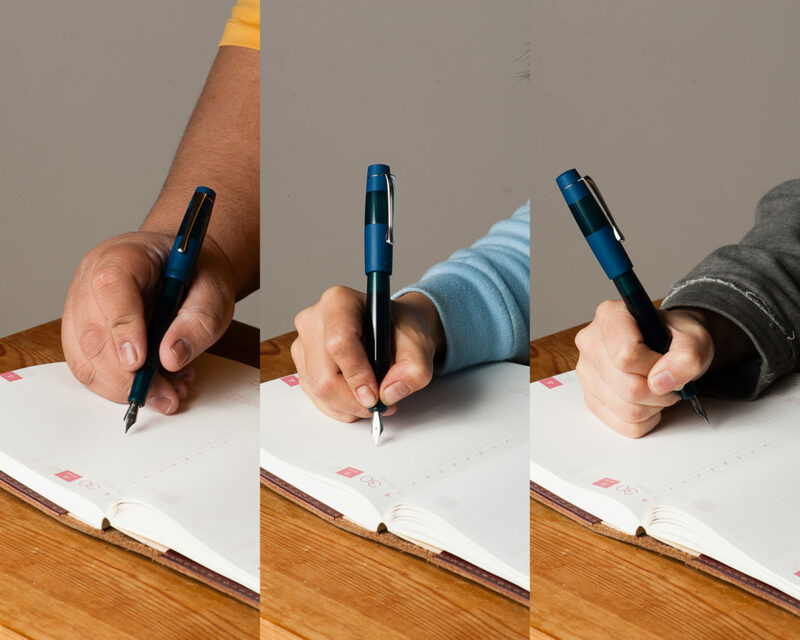 It doesn’t happen often and surely something that can be improved upon in later iterations of this pen. Franz: First (Una ;-P) to answer the number of turns, it took one and 3 quarter turns to cap or uncap the Una. 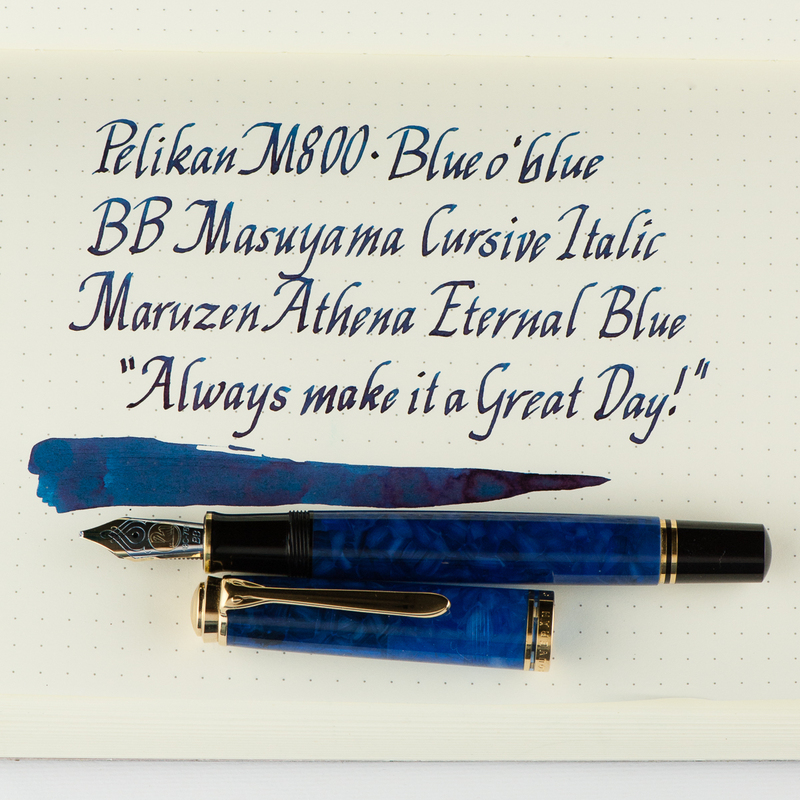 Not bad for a daily use pen! This pen stayed in my shirt pocket fairly secured even without a clip. And because it is a larger pen, I didn’t have to fish it out to use it. Of course with the cheap copier paper and the broad nib, I definitely didn’t use it very often at work. 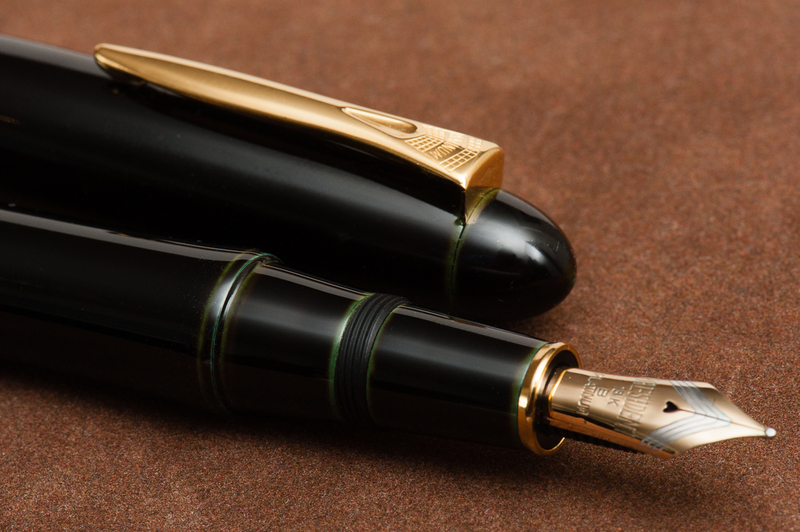 But if fitted with a finer nib, this pen will be great to use. The Una is a cartridge/converter filler and they include a standard international converter with it. 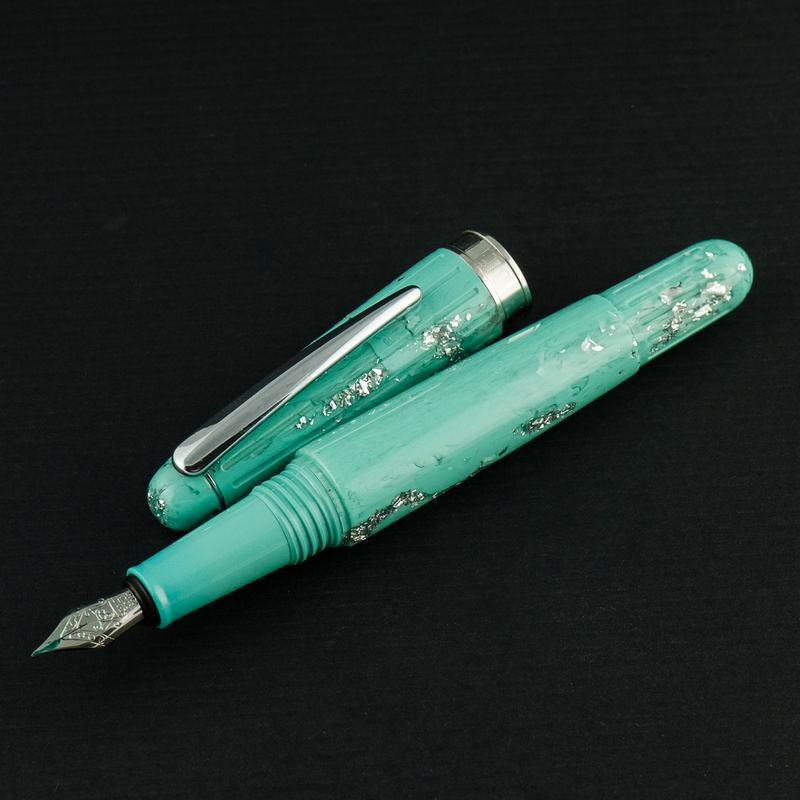 I imagine that you can eyedropper this one as well but since it was Katherine’s pen, I didn’t attempt to do so. 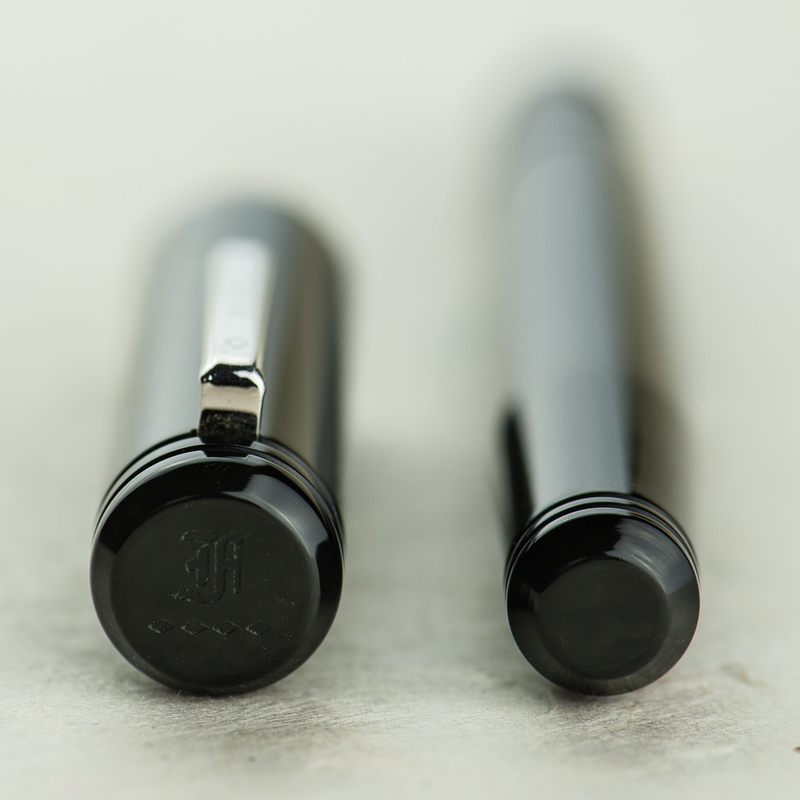 Katherine: I’m excited to see more makers in the pen scene, and especially excited to see that Kasama went for a more unique design, not another standard-ish girth stick or rounded stick CNC pen. 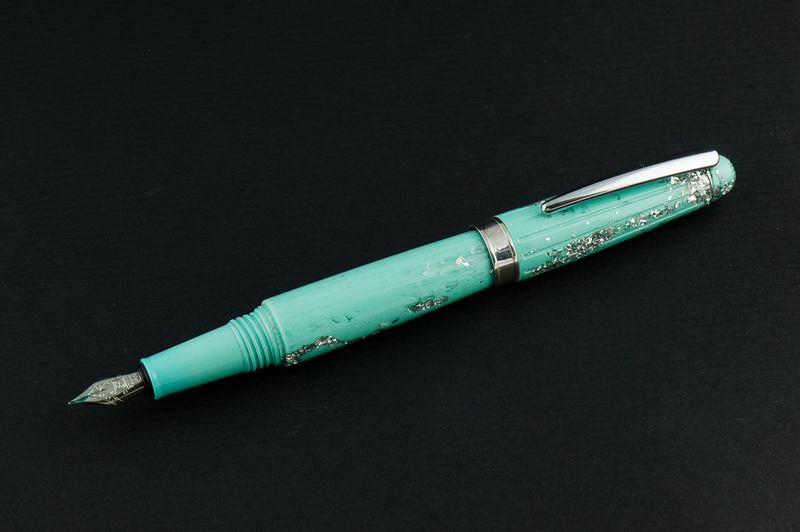 The pen itself is well made (though there was a sharp point on the end of the barrel, I sanded it down, but that would have been easy to do in shop) and solidly made. 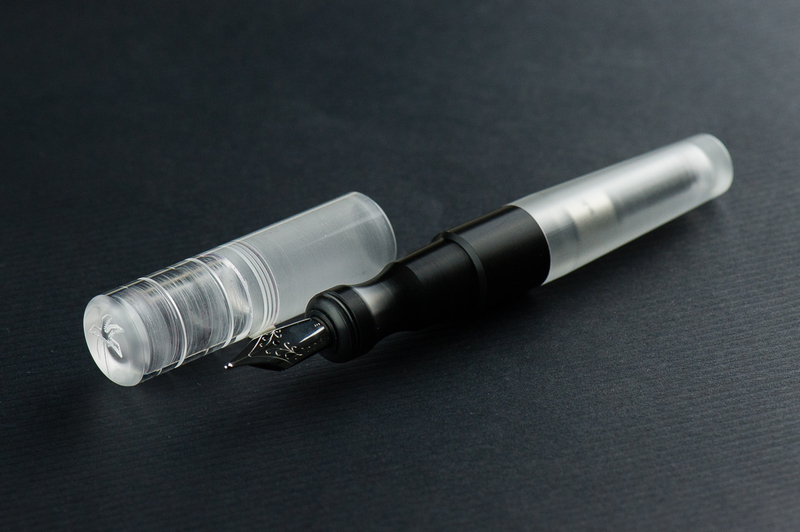 My only real gripe with this pen is that the section<>barrel and section<>cap threads turn in the same direction — so if you don’t tighten the section<>barrel well, unscrewing the cap can unscrew the barrel instead. This hasn’t been an issue for me, but it’s a small design change that could go a long way. 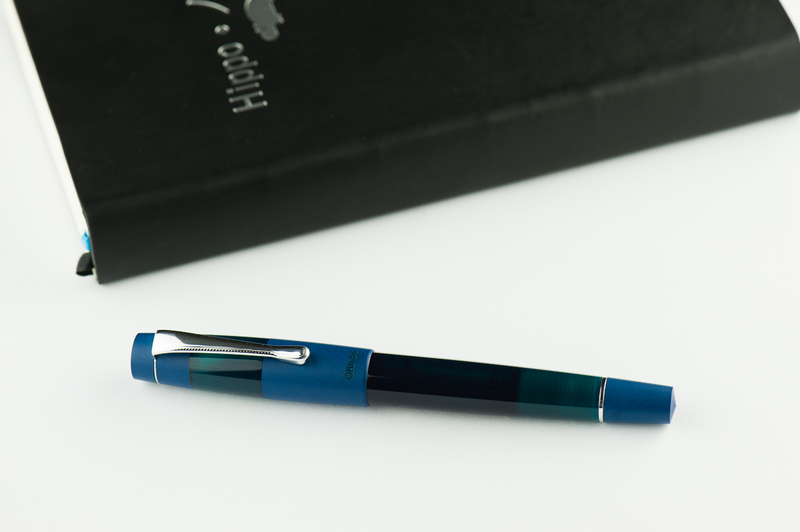 Pam: This is a solid pen and well worth a try, especially for those who prefer a wider pen. 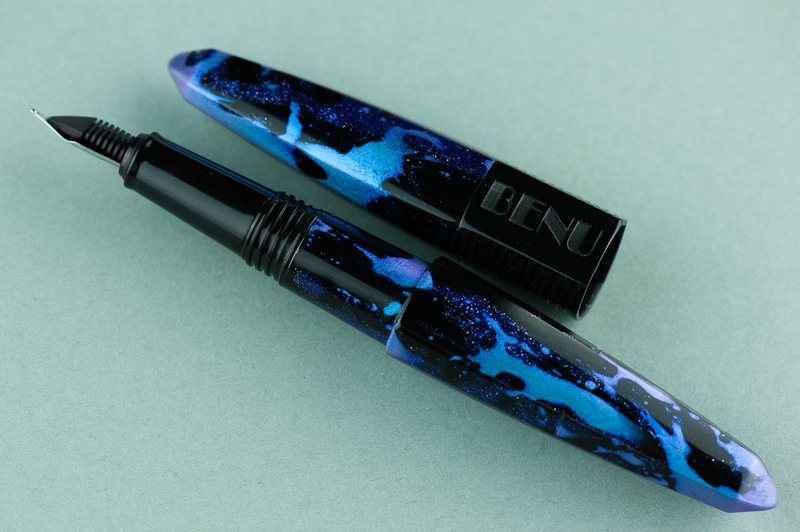 It has the potential to be made with a variety of acrylics and delrin and very comfortable for longer writing session. 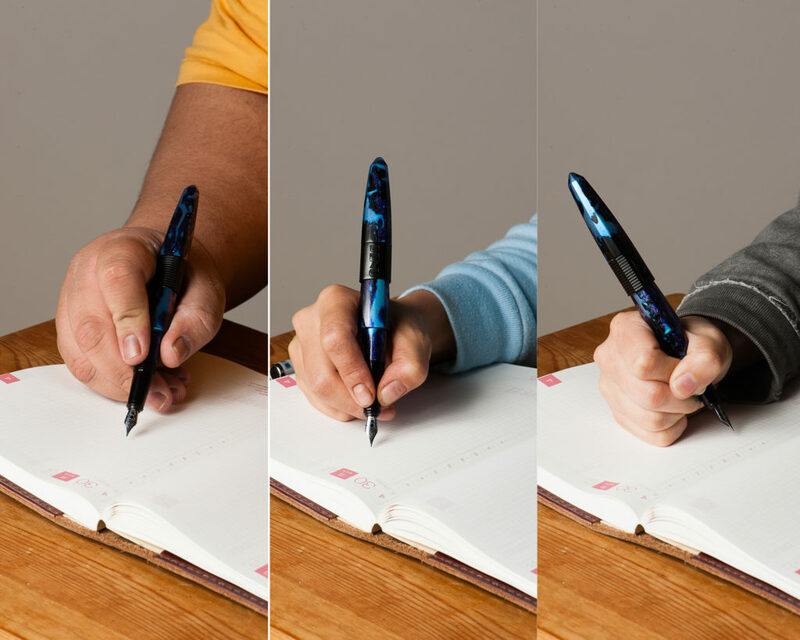 Other than the section, which is a deal breaker for the pixie fist grip that I have, I would recommend this pen. Good thing Katherine has one I can play with occasionally! 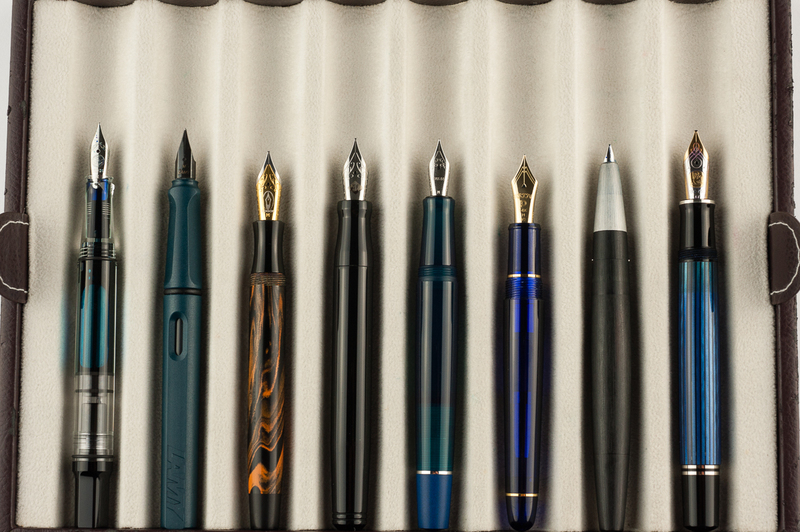 Franz: To sum up, I really love the Una fountain pen. 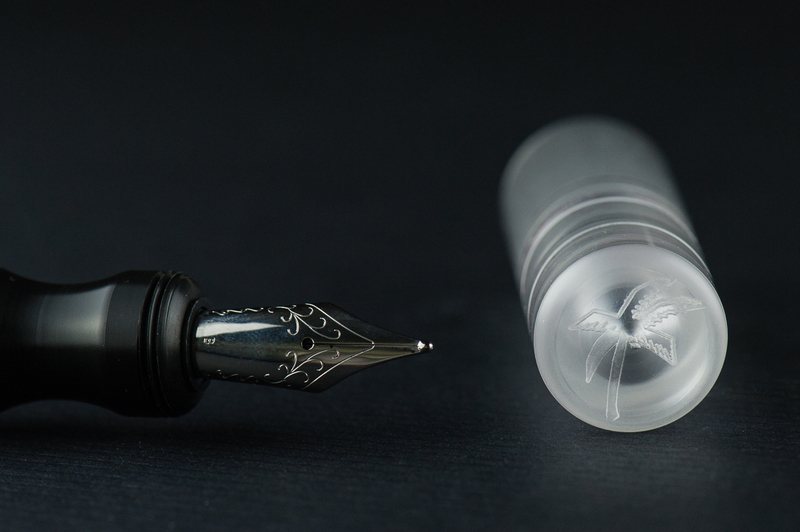 I’d largely attribute that to the design: interestingly shaped Delrin section, machined lines on the cap, translucent cap that shows the nib underneath, and a couple more things. Katherine and Pam pointed out probably the biggest issue with this pen though. The Una’s thread design can be a little frustrating if you’re in a rush to write but then you find that you unscrewed the barrel instead. Annoying? Sure. But I’d be getting one anyway. 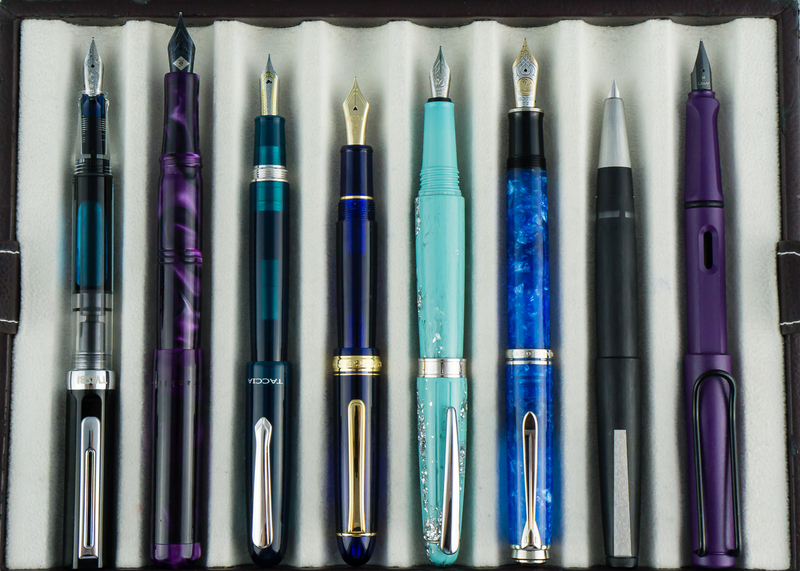 Because… penvy (pen envy). Darn you Katherine for making me spend money! In this review, we are once again joined by our friend, Roz. 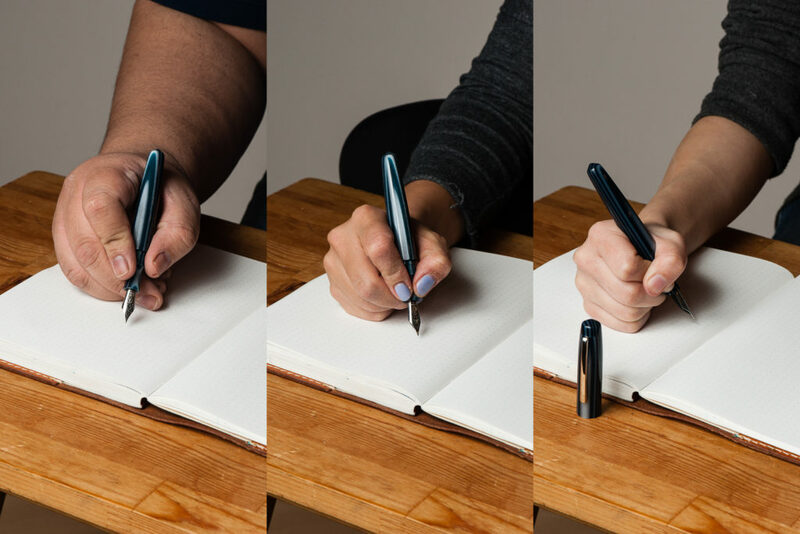 She’s volunteered to be our left-handed reviewer and we love having her back. Especially when she brings us cupcakes. Thanks again Roz! 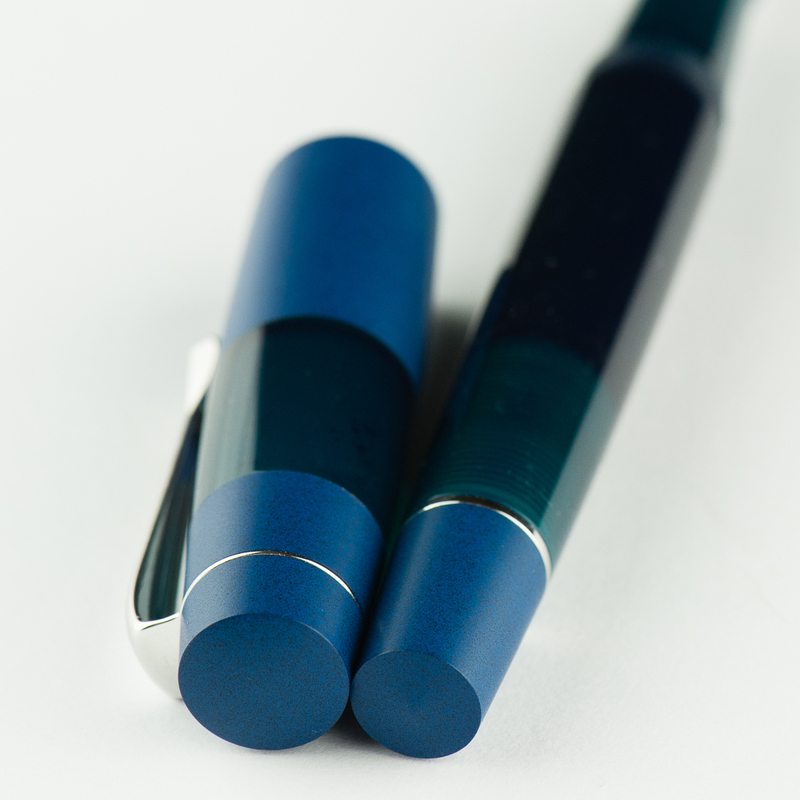 Katherine: I have a thing for faceted pens, and this is no exception. I love the chunky, stubby look of the Ondoro paired with clean faceted lines. 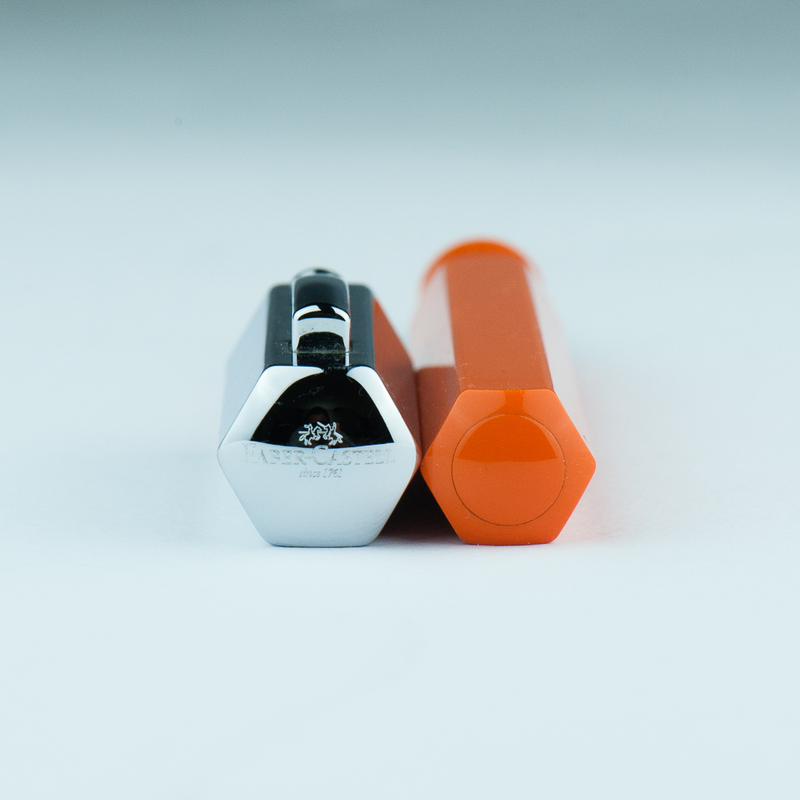 I really want a white Ondoro… but they appear to be discontinued, so for now I have an orange one. 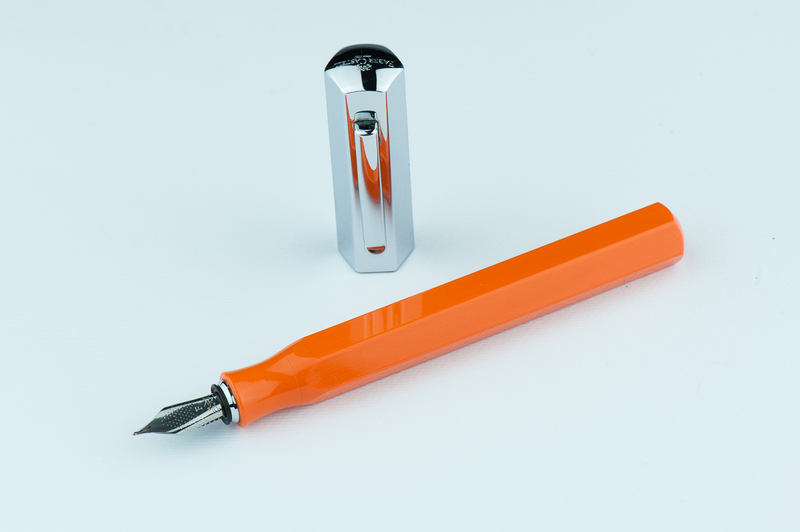 I like the bright playful orange and the contrast with the chrome cap. 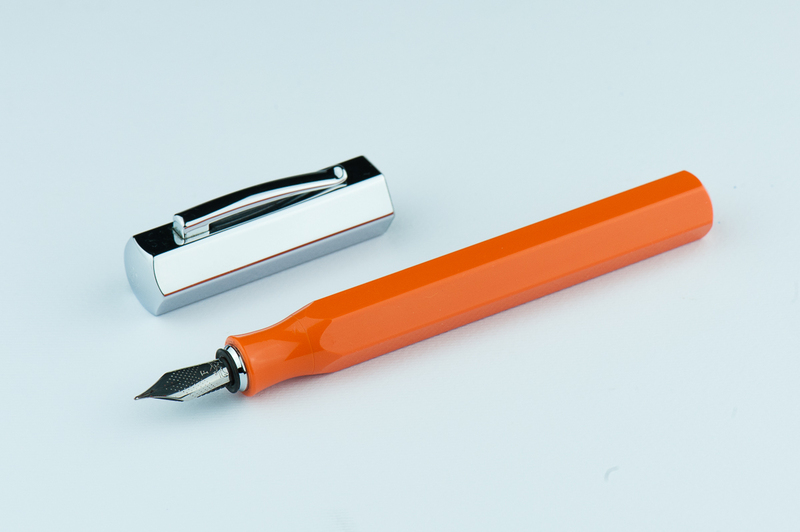 The bright orange paired with the chunky look reminds me of those big grip pencils that little kids get. 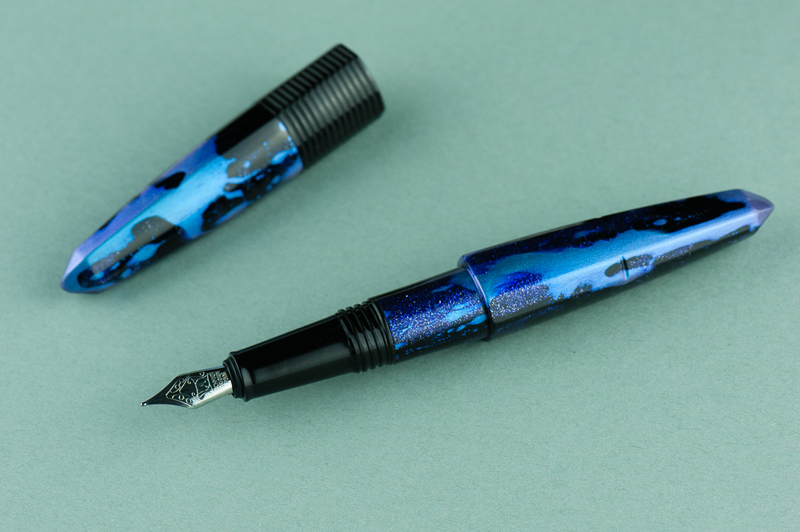 Pam: The Ondoro’s unique design and eye catching color did make me curious to pick one up. I am glad that Katherine ultimately decided to get one. The shape of the barrel reminds me of an oversized pencil. 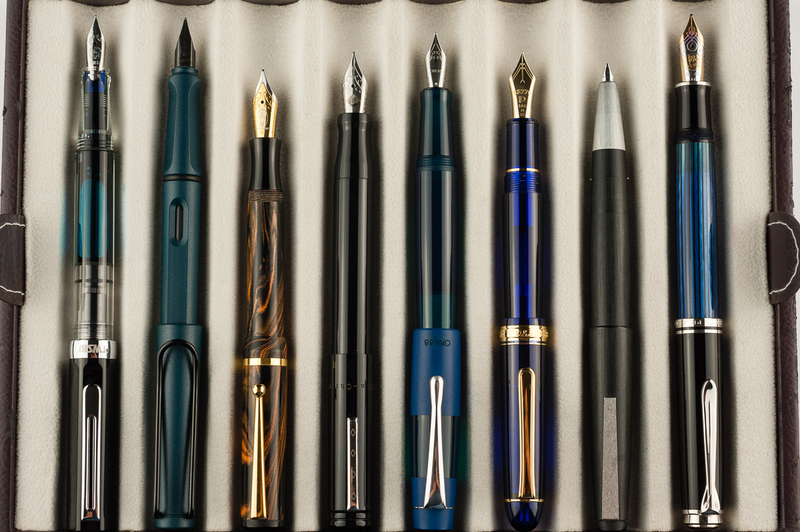 I mean, a fountain pen is an adulting pencil right? The chrome barrel is a great cherry on top to this design in my opinion. Franz: Stout! 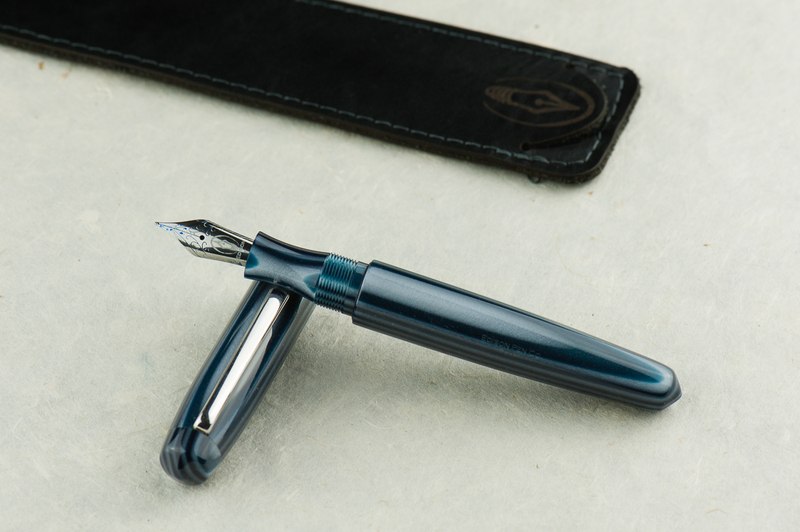 That’s one word I’d describe the Ondoro. Its shortness in length is balanced by the girth of the barrel and cap though. 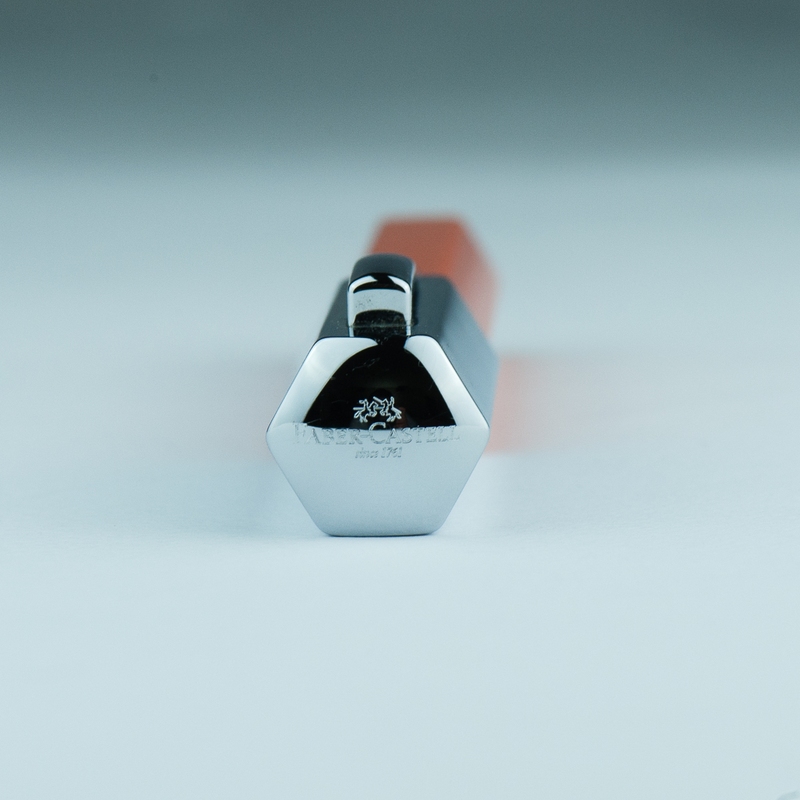 The hexagonal facets make this pen interesting and different from others. The shiny cap is cool looking but is a fingerprint magnet for sure. Roz: Wow, my eyes! The Ondoro is definitely an attention getter. 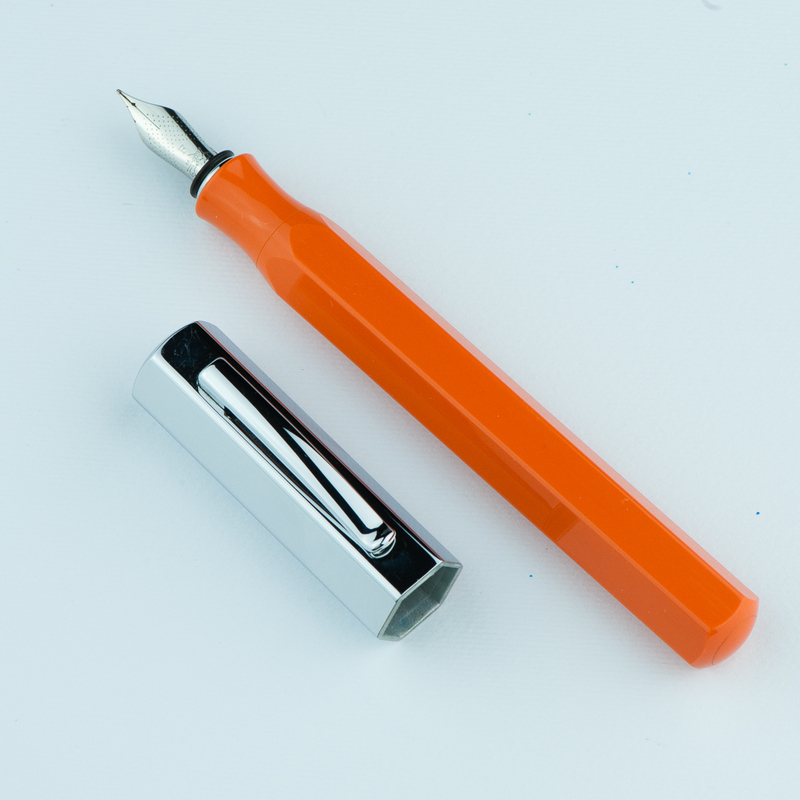 The bright orange with shiny silver cap, I’m awake and excited to experience this pen. 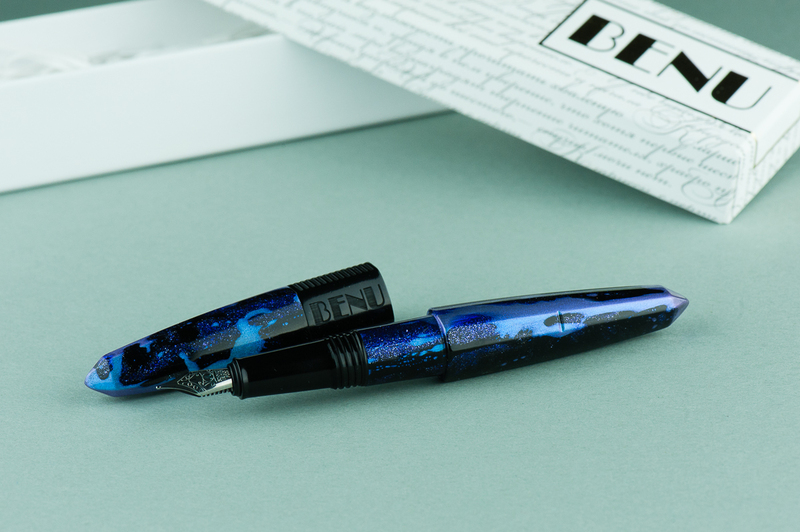 I’m still not sure about my opinions on facets – but I feel like a pen of this size benefits from the facets breaking up the amount of solid colors there would be otherwise. 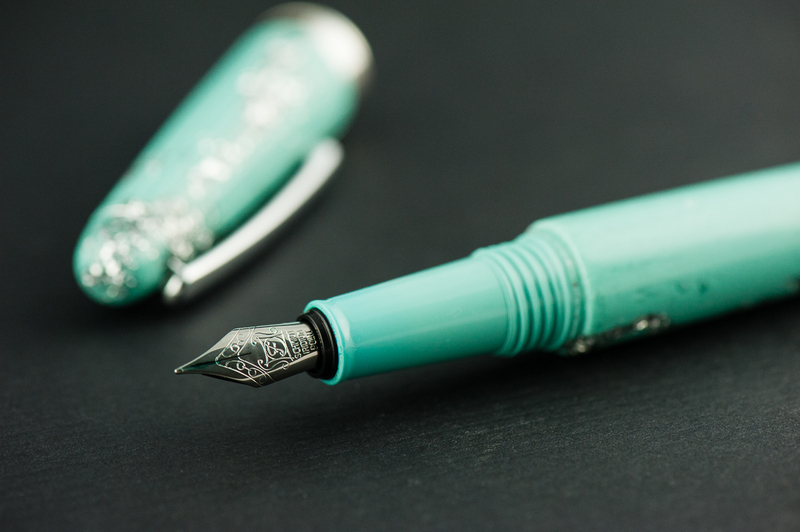 Katherine: This was my first experience with a Faber Castell nib. 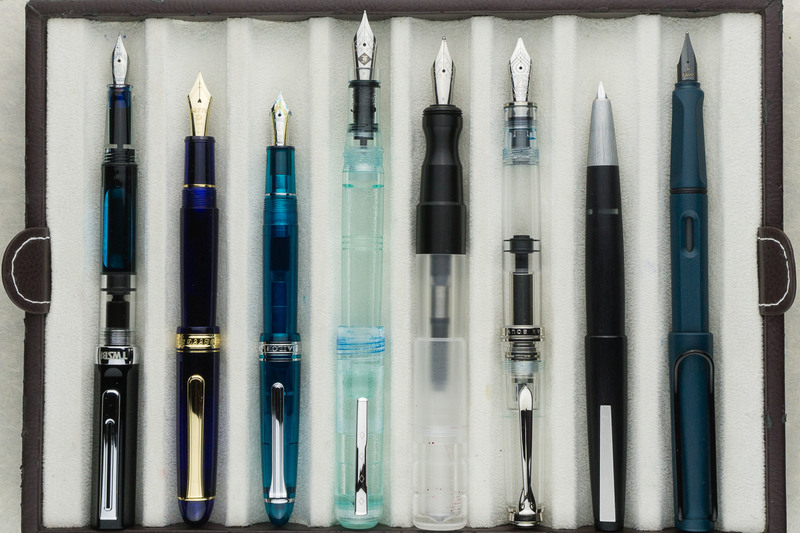 I like the nib and it’s pleasant to write with, but nothing particularly notable. 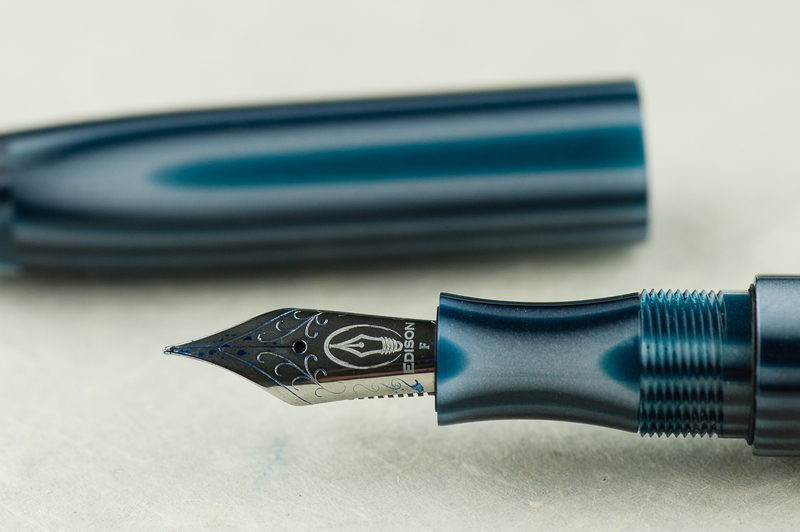 It’s a western fine with a nice balance in wetness — wet enough to be comfortable for writing, but dry enough to see lots of shading with the right inks. 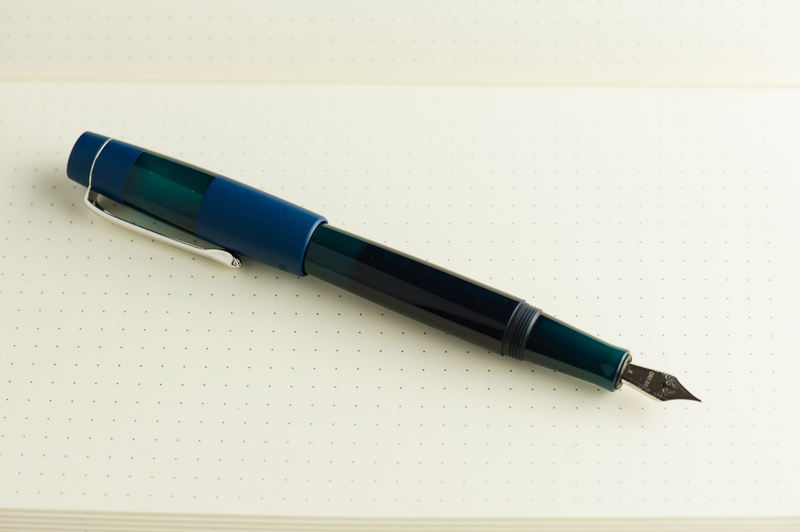 The feedback on the nib is a smidge feedbacky — which I really like. 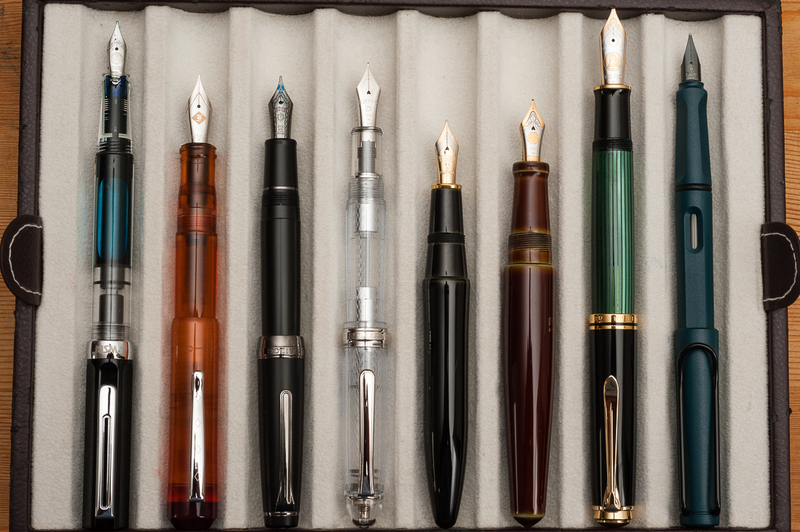 Hurray for nibs that aren’t super smooth and “buttery”. 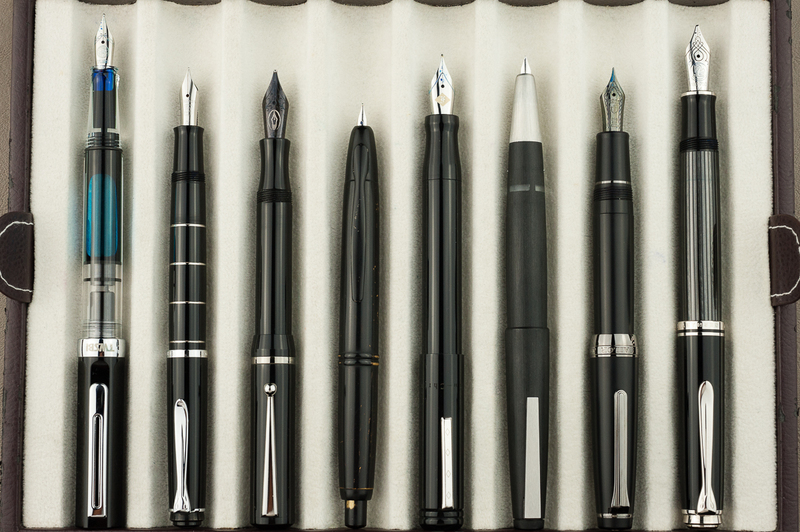 Pam: I do really enjoy the Faber Castell nib. 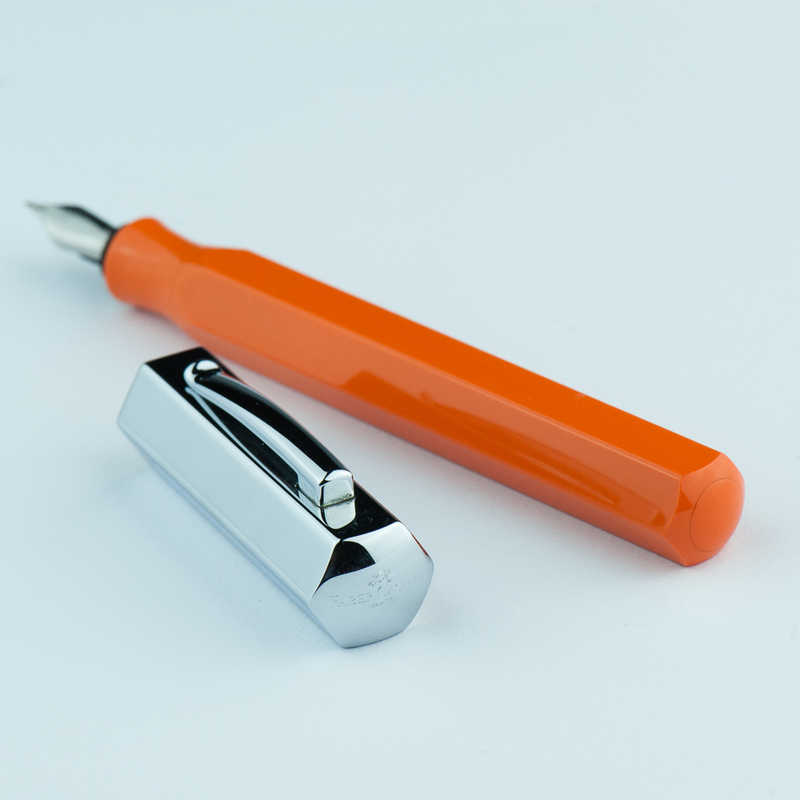 It’s a pleasant nib to write with and does somewhat remind me of a pencil in terms of feedback. It’s not super smooth, but the feedback isn’t distracting either. 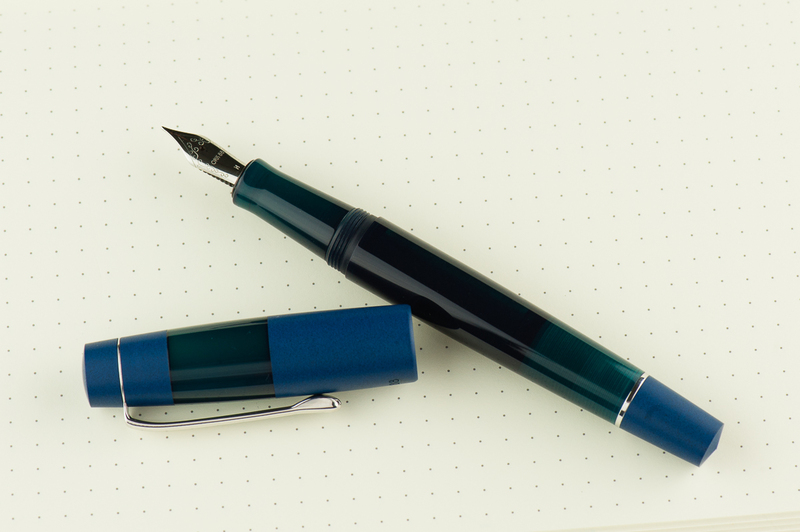 The nib performed well and had more feedback on Midori paper than Tomoe River paper in my opinion. 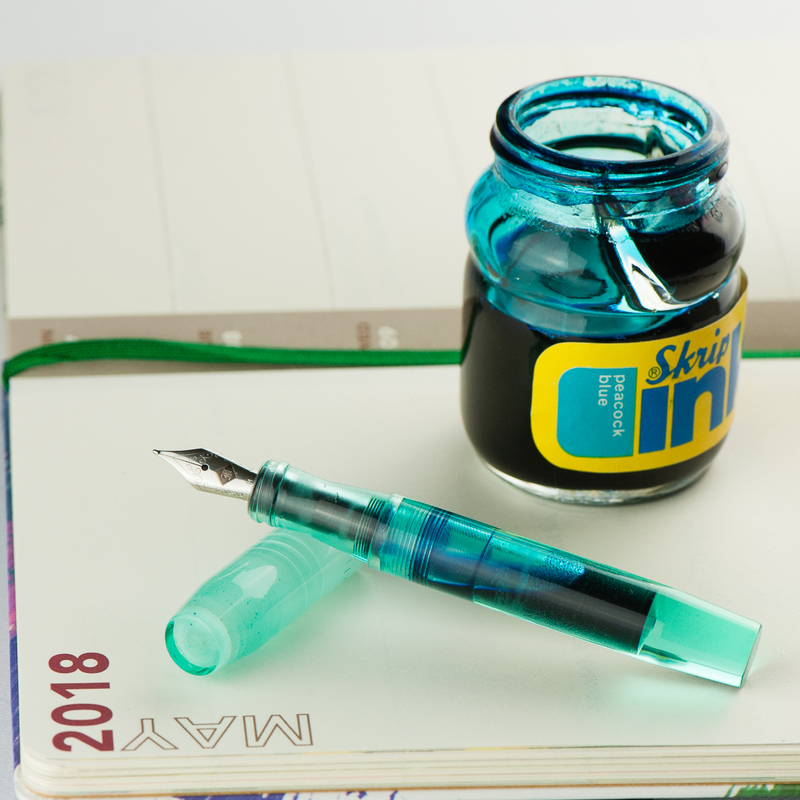 The nib is a good balance between dry and wet. 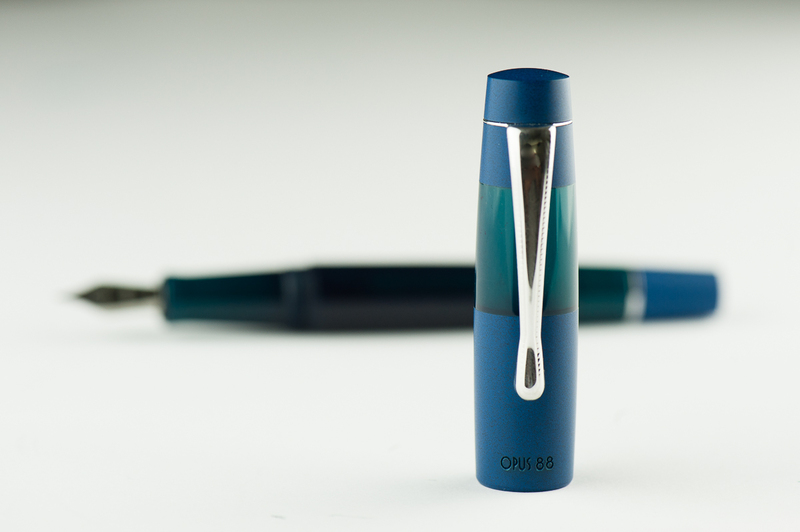 It’s dry enough for a decent consistent line, however, you also get to enjoy the ink color you have put into the Ondoro. I would prefer a more saturated ink in this instance given that I shading inks make my handwriting look messier, especially if it’s beyond a couple of sentences. 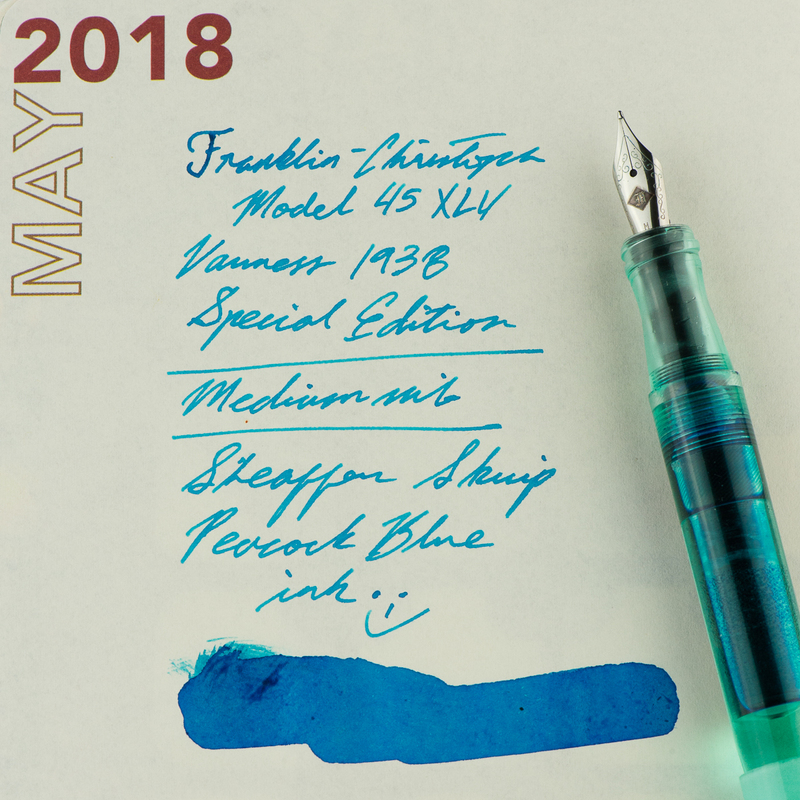 Franz: Aesthetically, the smaller nib size (#5?) looks good on this pen. I also love the design of dots with chevron shape. 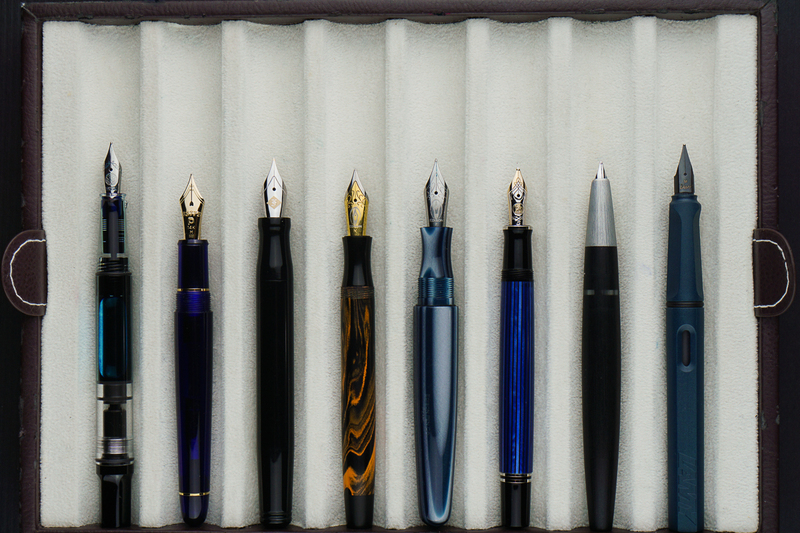 As for nib performance, the fine nib has a bit more feedbacl tha I refer. 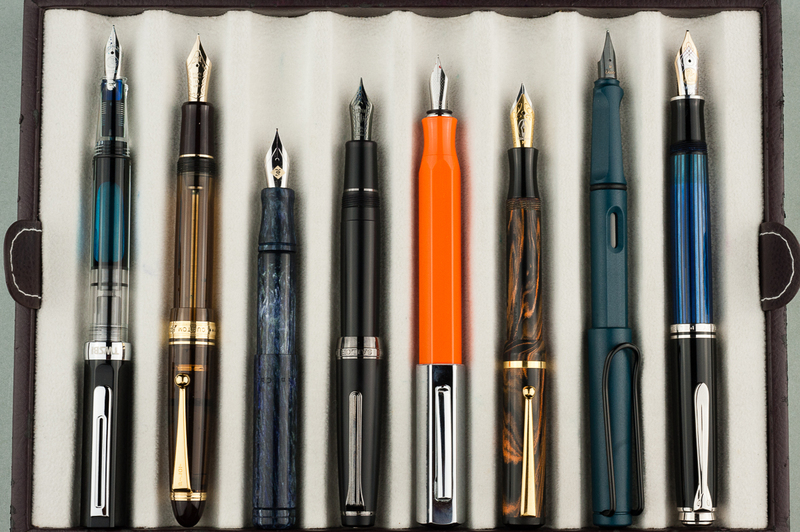 But I am the medium/broad nib kinda guy so not a biggie for me. 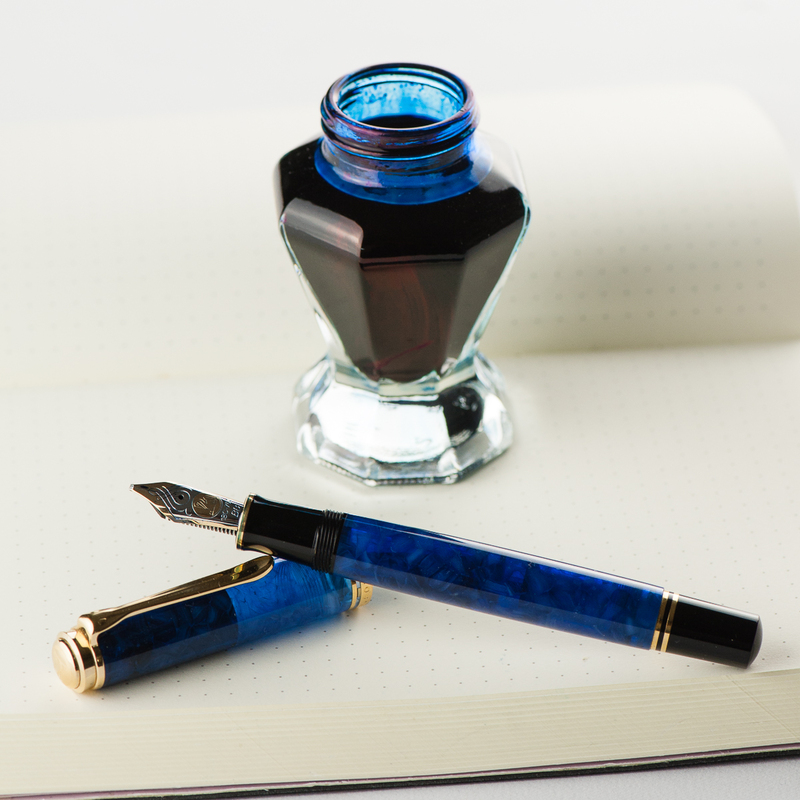 It did write with a consistent ink flow though. 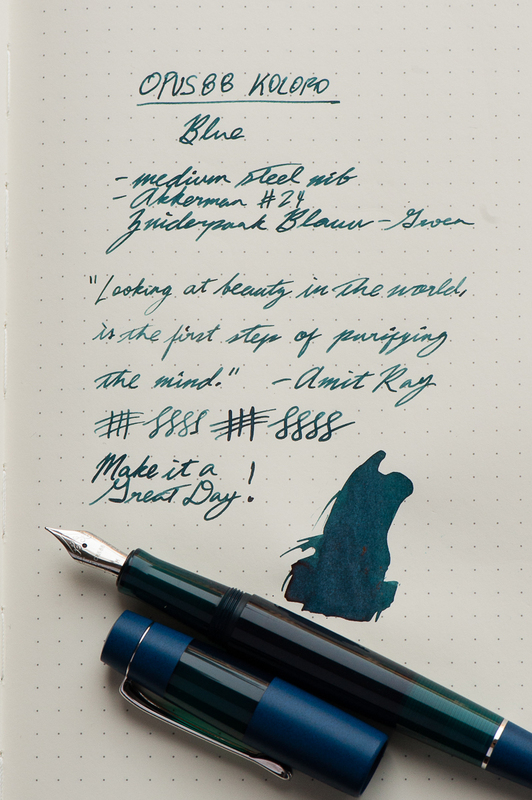 Roz: The nib was a bit scratchy for me at first, it took me a while to find a good angle – but I did find it! 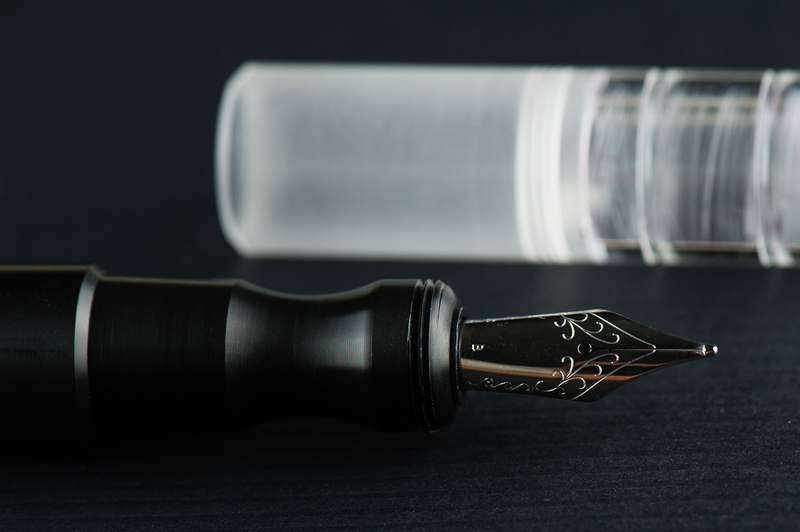 Once I got my angle down, the nib was pretty easy to write with. Additionally, the nib made a sound while writing that I really liked. 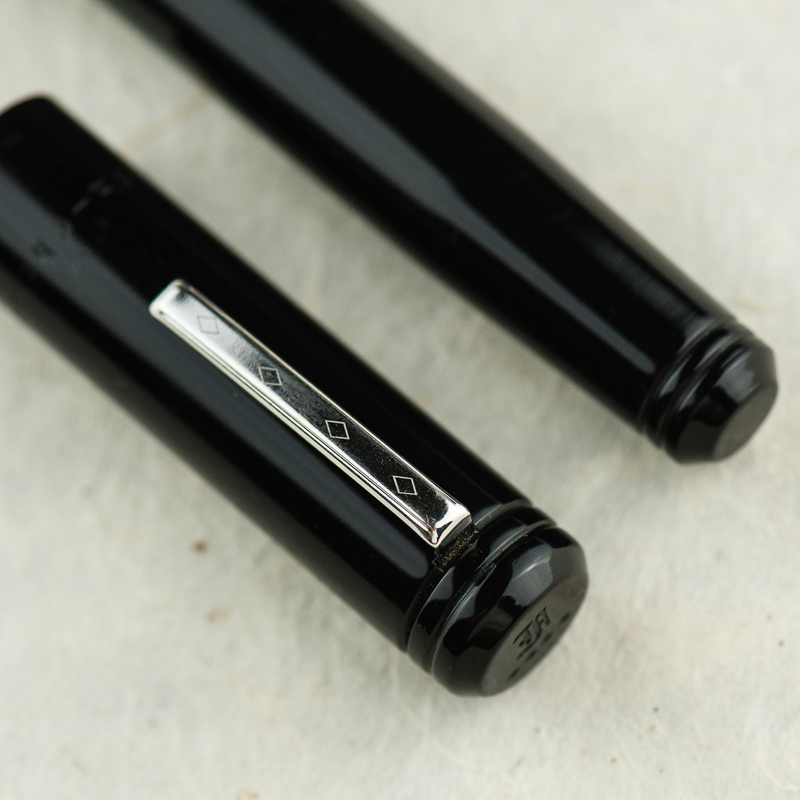 Katherine: I was initially hesitant about this pen (why I never bought a white one) because of the narrowed section. 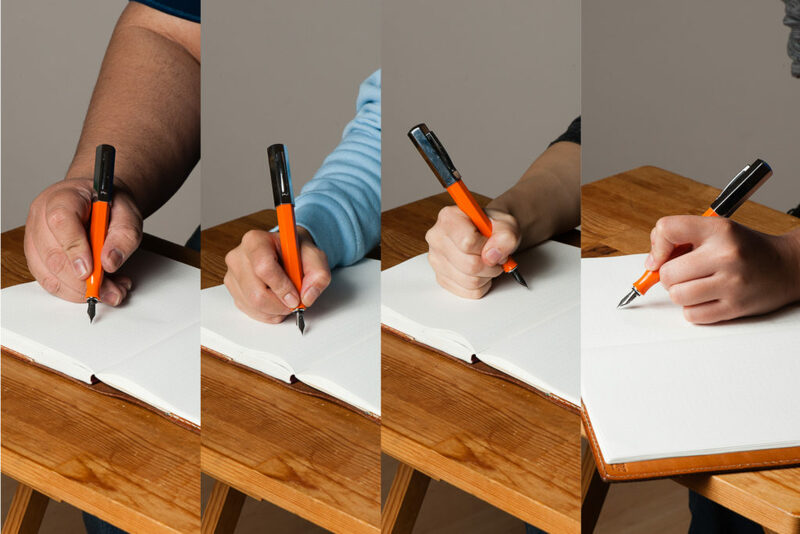 However, it’s surprisingly comfortable, but does force me to hold my pen slightly further back than I usually do (probably more like a normal person). 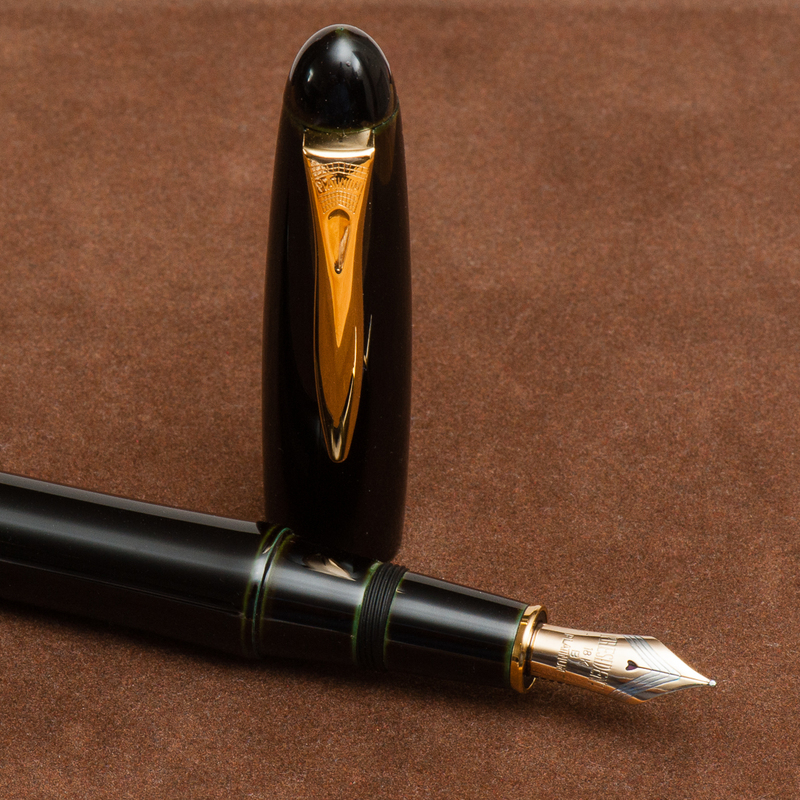 I use the pen unposted and it’s well balanced and pleasant to write with for extended periods. Pam: The short section was a bit of a concern for my dinky iron grip initially, however, I had no reasons to worry. 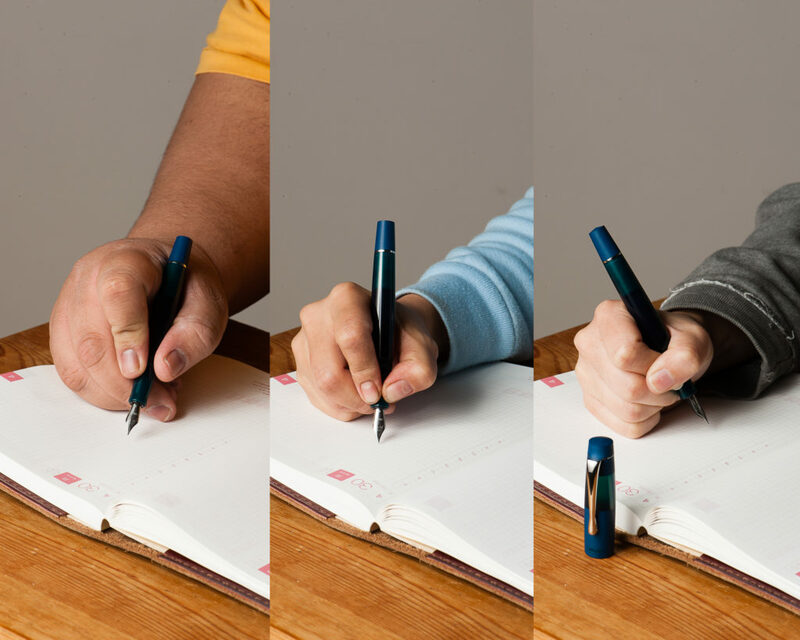 The smooth transition from body to section meant that the entire pen is one big grip for me! 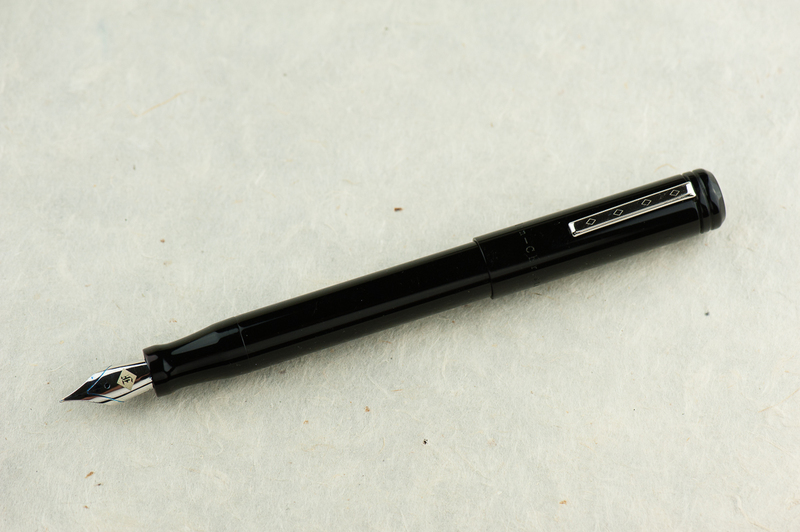 The angles on the pen is soft enough that no corner actually bites into my hand and the section being tapered doesn’t detract from my capacity to grip the pen. I do get sweaty hands so there are times that I have to reposition a bit. Surprisingly, slippage was relatively minimal. That’s more my hand sweat problem and less about that pen. Franz: Okay… writing with the Ondoro for 20 minutes, I’ve come up with some issues. Probably it’s just specific to me but I didn’t find the Ondoro comfortable to write with either posted or unposted. Posted, the cap definitely makes it unbalanced and top heavy. I seemed to have to exert some force to counterweight the cap to put the nib to paper. Unposted, the length is barely enough for my usual higher grip. With the Ondoro’s pinched/concave section, I needed to grip it higher because of the smaller diameter of the section. Now here comes the probably just specific to me part and you as a reader shouldn’t worry too much about. Gripping the Ondoro higher above the section wasn’t comfortable for me either because my usual writing angle causes my fingers to land on the edges and not on the flat side of the facets. 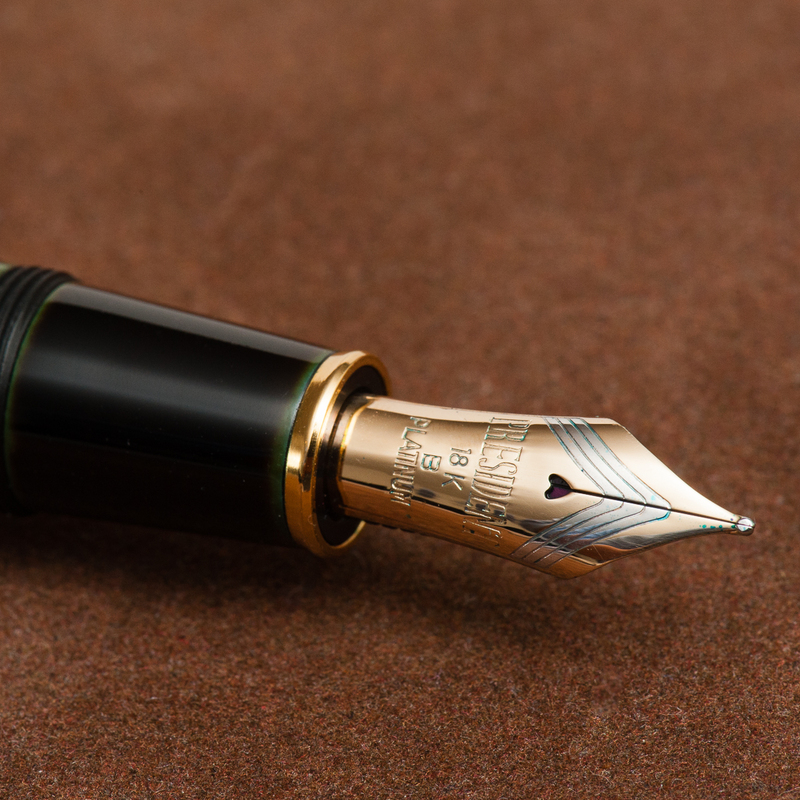 This bothered me a bit and when I adjust my grip to the flat sides of the facet, either the writing angle felt weird to me, or one of the nib’s tines was not hitting the paper optimally and caused me to feel scratchiness or more feedback. Again, this is possibly just me. 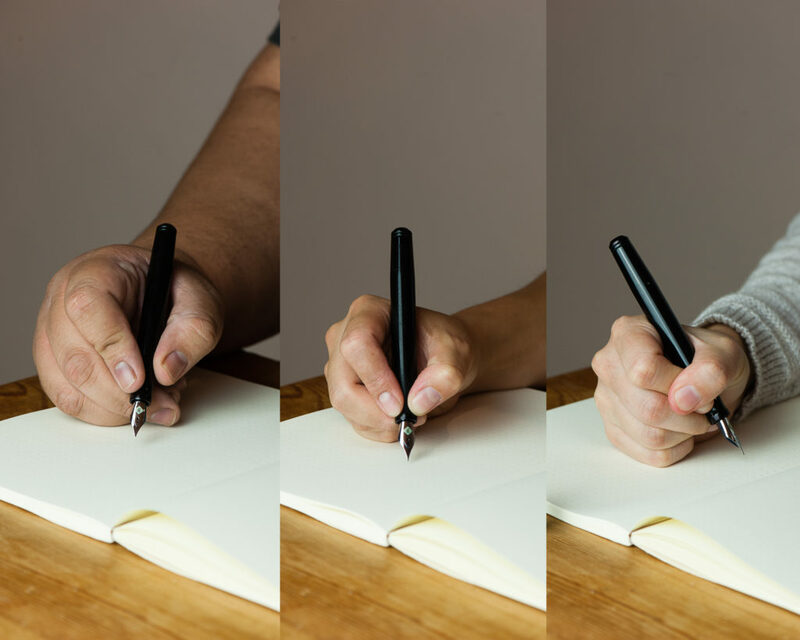 Roz: My grip tends to move around a lot when I write; so having to keep to a narrower range of angles, I really expected my hand to tire quickly. But I didn’t! 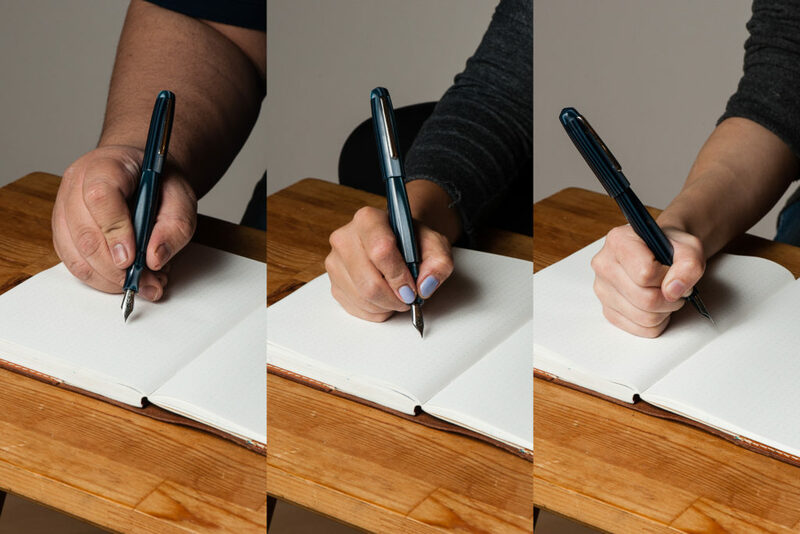 The girth of the pen kept my hand from cramping up and the grip dipped in such a way that it really helped with my writing fatigue. Writing with the Ondoro unposted was a bit unbalanced for me. While I preferred to write posted, the cap does add a good amount of weight to be wielded. Pam: I love a good snap cap! I makes me so happy that it’s so quick and easy to deploy at work. 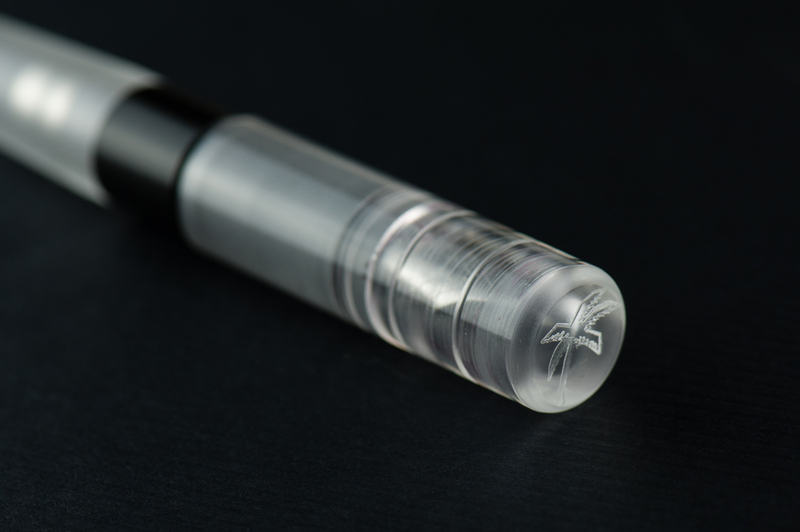 The snap does leave a bit to be desired in terms of “aesthetics”, but on the flip side, it’s a quiet snap cap action so it’s not going to announce to the world that your capping and uncapping your pen. The clip worked pretty well in my white coat pocket, nothing crazy notable in terms of tightness or looseness when it came down to it snagging on the fabric. Franz: Echoing the ladies here, snap cap FTW. 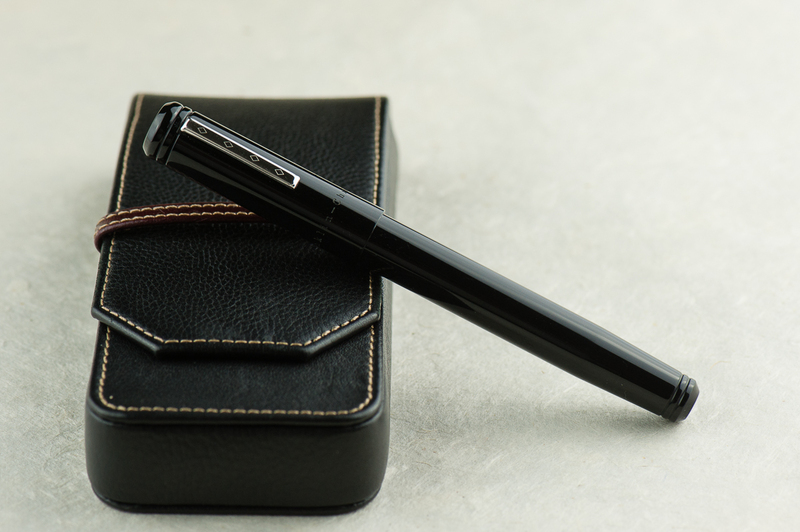 =) It definitely is a good pen for on-the-go, quick notes kind of writing. And the fine nib performed very well with copier paper found in our office. Roz: I kept the Ondoro snugly in my Nock case during transport. I don’t get to write a ton during my work day, so it was really fun to bust this pen out for random thoughts, meeting notes, and quick breakdowns. Katherine: I like this pen! 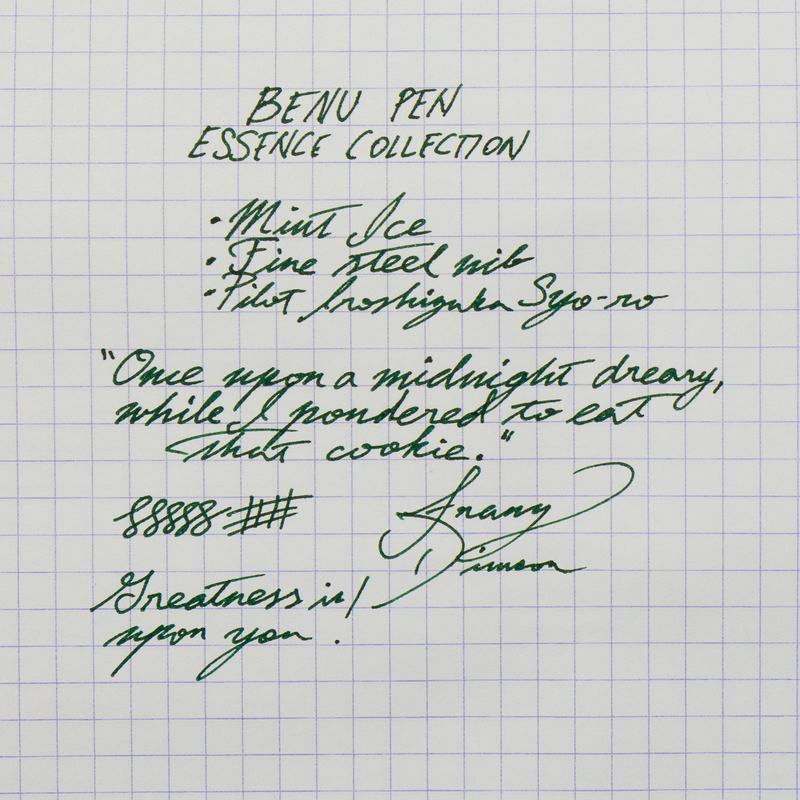 At $150 MSRP, I think it’s a little steep for a steel nib, but it has a unique look and often shows up slightly discounted. 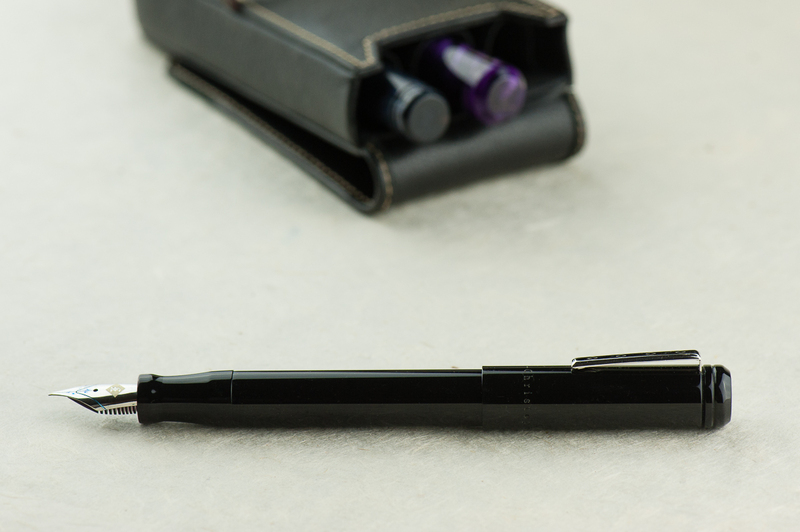 It’s a solid pen with a solid nib that makes a great sturdy EDC. 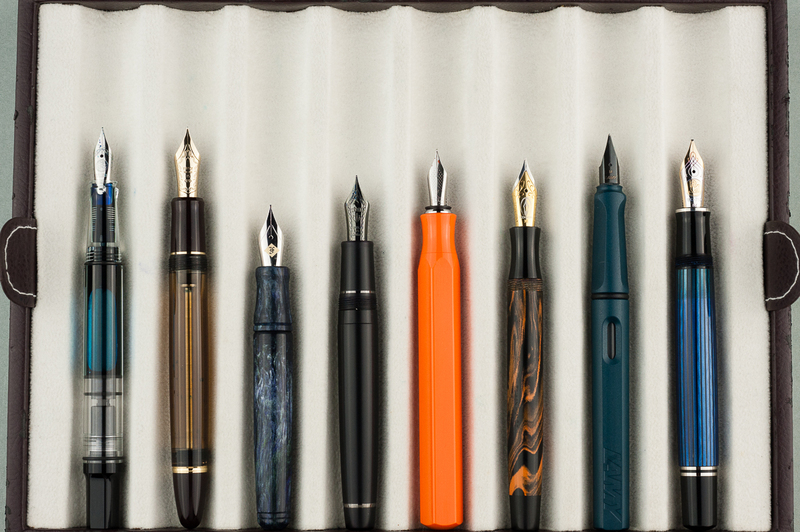 Pam: I honestly really like the Faber Castell Ondoro. 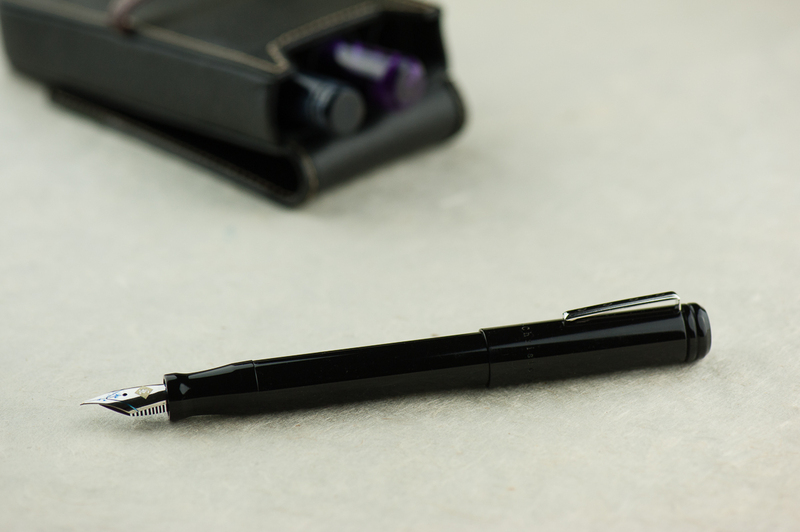 It’s a great pen for those who enjoy faceted pens, an industrial aesthetic, and a snap cap. The nib is a great bonus. 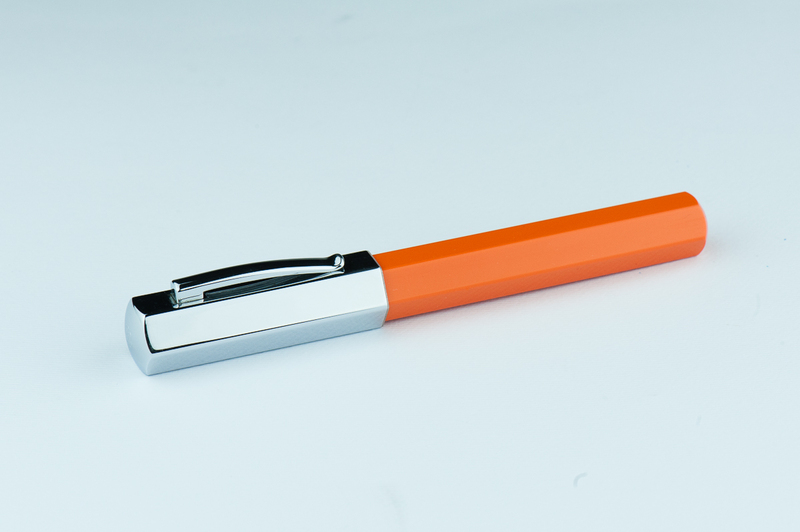 With the different colors available, it’s a great statement pen for those looking for a good pizazz in their pockets. 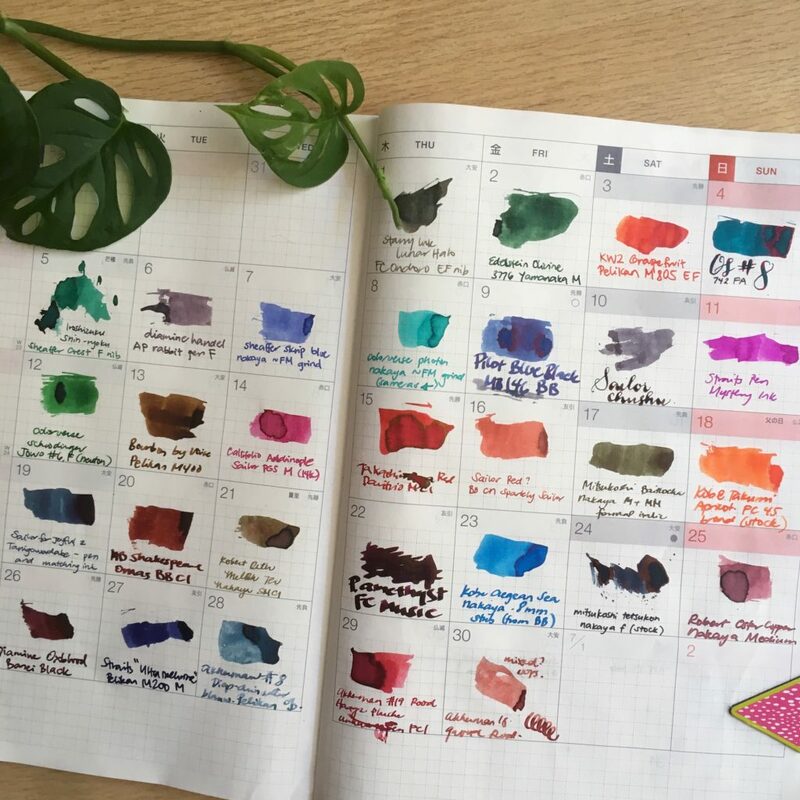 Roz: Overall, the Faber Castell Ondoro was an interesting one for me to try out. 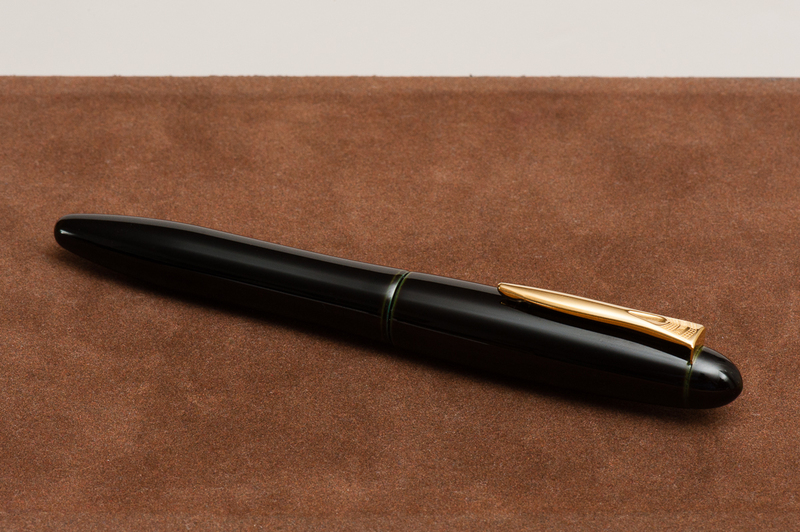 Without a doubt the Ondoro is a pen that makes a statement, but in the end I think it was too much pen for me. And I’m still not sure about my opinion on facets! 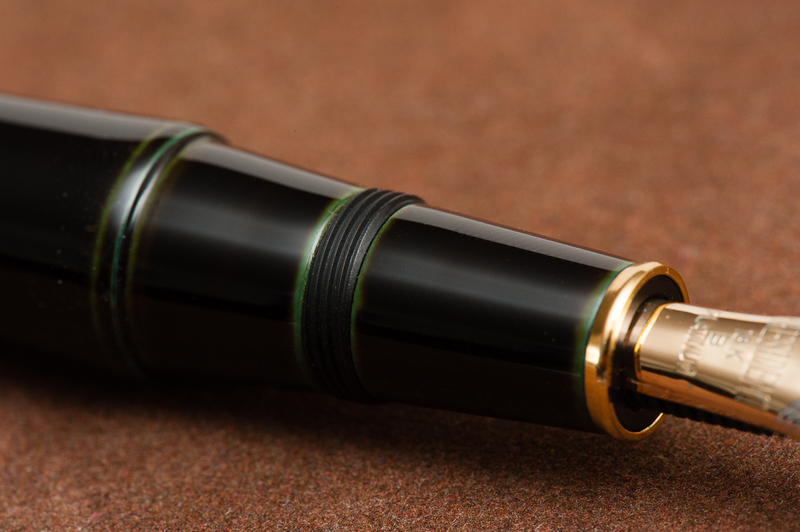 Before anything else, a big shout out of appreciation to Goldspot Pens, and Tom for providing this Opus 88 Koloro fountain pen for review. 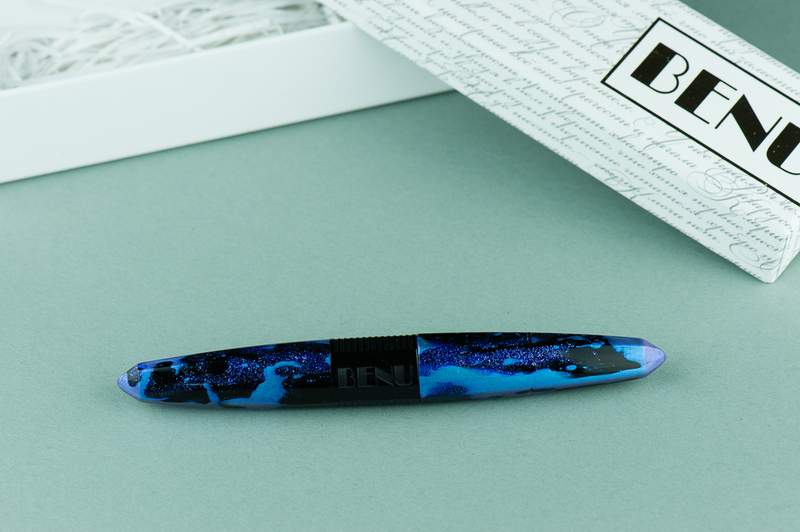 Goldspot Pens is an online shop for pens, and stationery goods and they are an authorized retailer for diverse brands that we love! 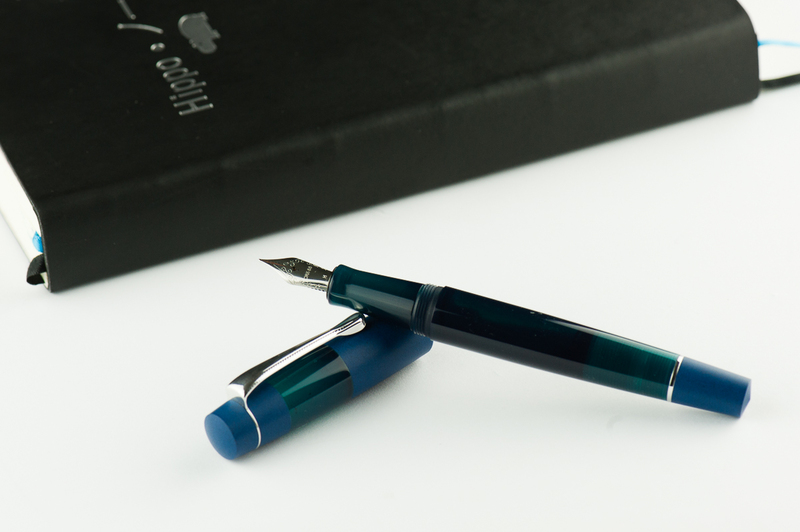 Pam: The demonstrator version is very striking, however, I am relieved to see different colors for the Koloro. All I see on Instagram is the demonstrator version! The slight translucency of the blue makes the material more interesting than a matte plastic. That said, why not just maintain the same material throughout, like the demonstrator? 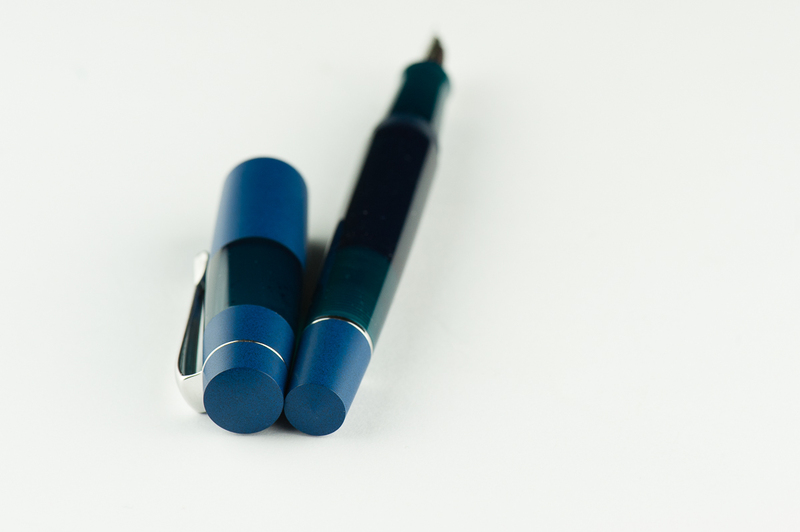 Lastly, the demonstrator version of the pen is pretty modern, and I wish the clip would reflect that. 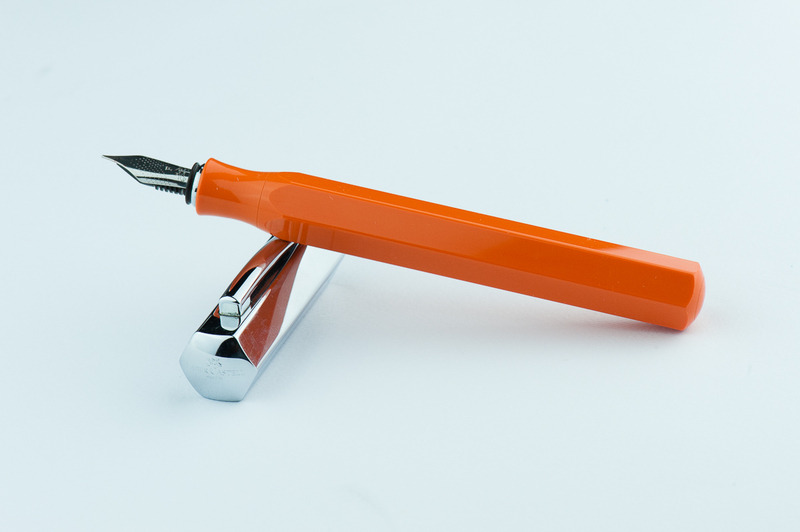 But then again, I am heavily influenced by the Lamy 2000 clip. In the box: The Koloro is shipped in a box with foam cutouts. 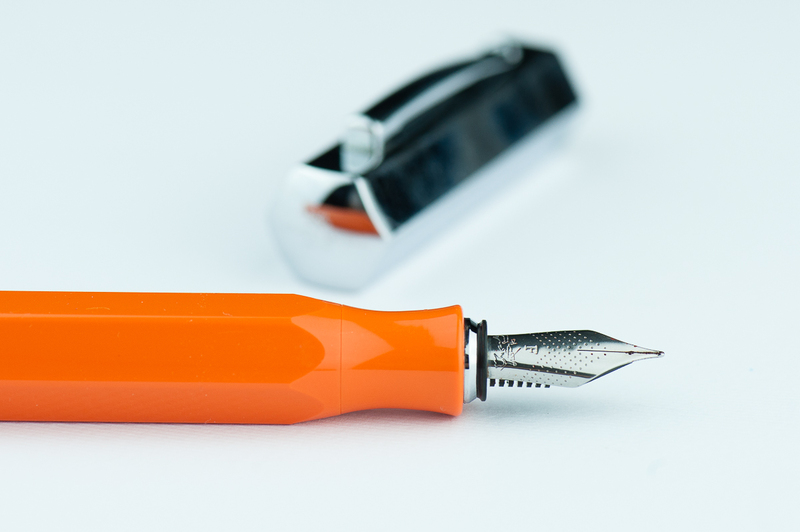 An eyedropper is supplied along with the needed instructions for filling and using the pen. The presentation is very nice. 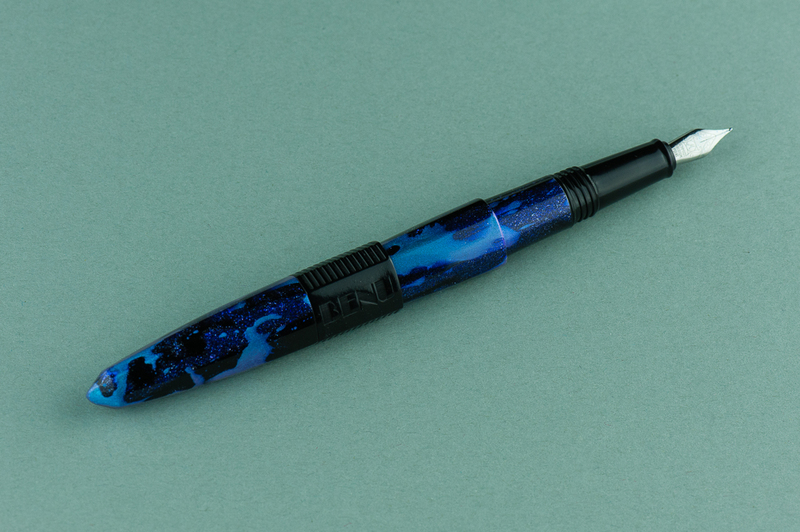 The Koloro is mostly an acrylic pen with blue ebonite accents on the cap. and blind cap on the barrel. 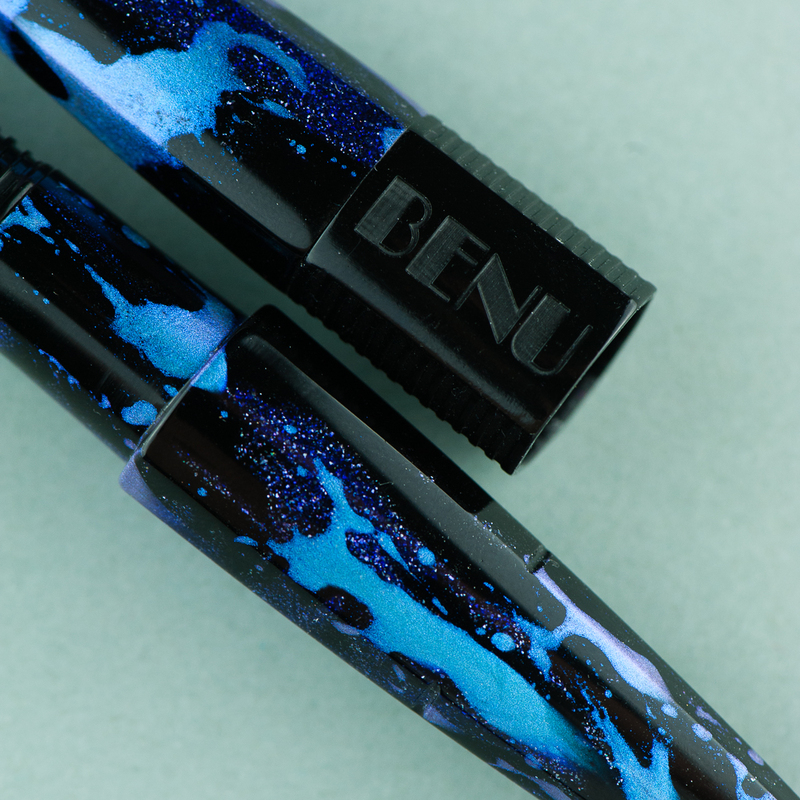 A close up of the blue ebonite on the cap. 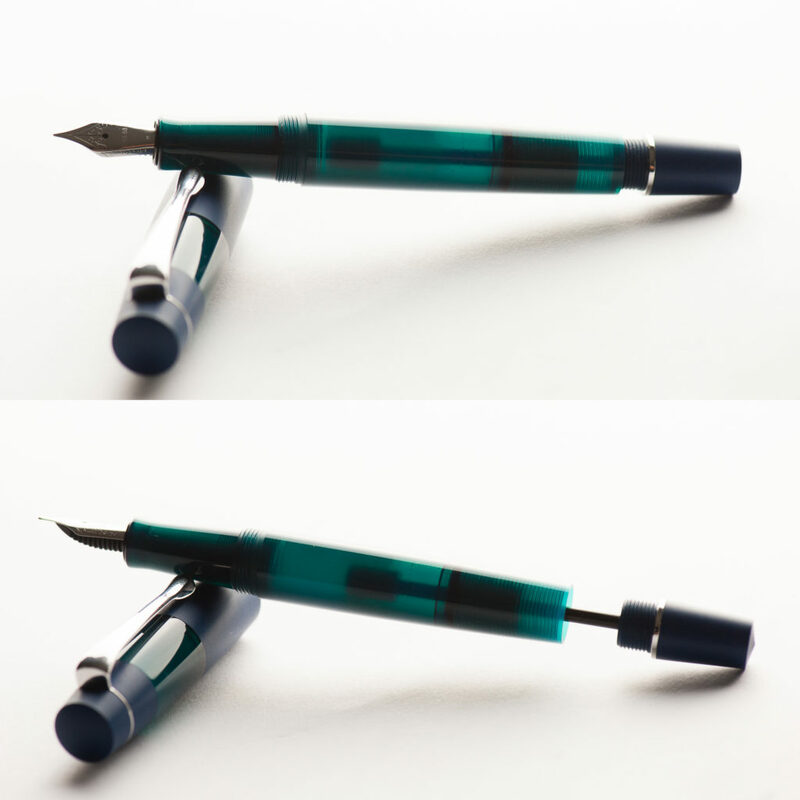 The blue-green acrylic in the middle is translucent. 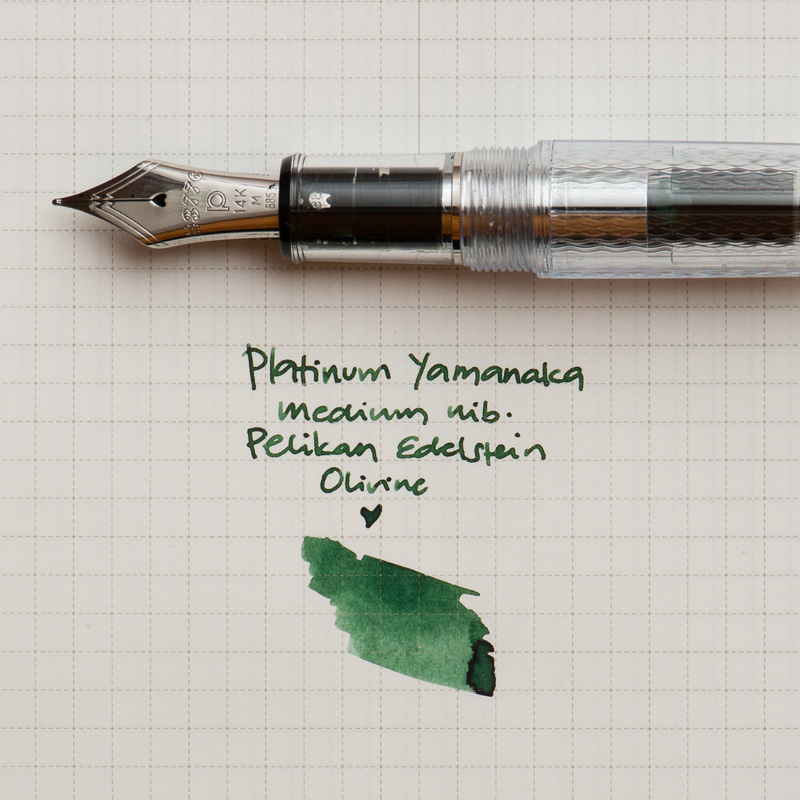 Katherine: The pen takes a #5 Jowo nib, which is nice. The one that came with this pen is smooth and well adjusted out of the box. 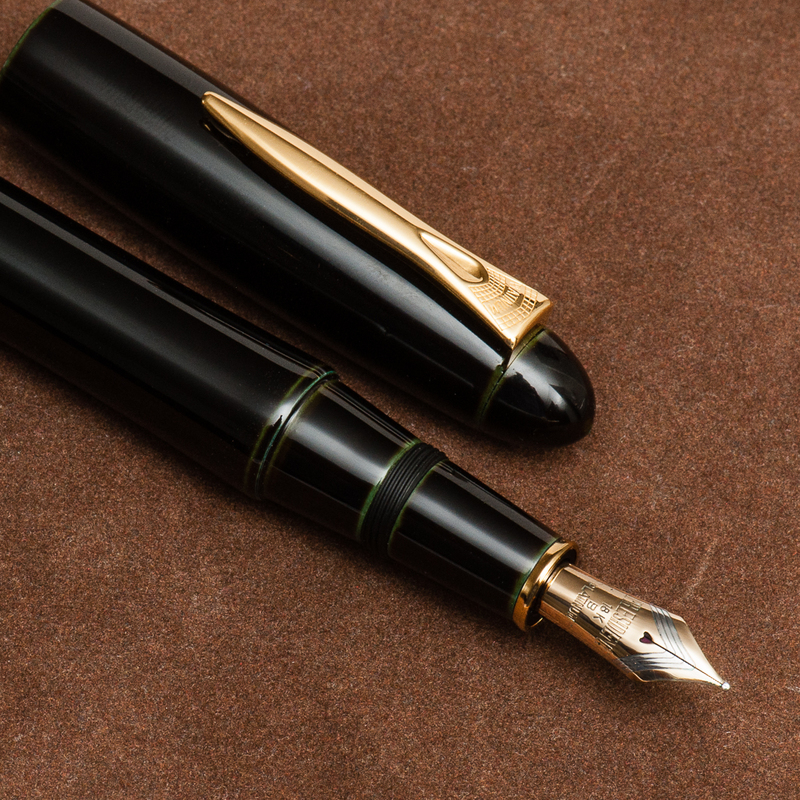 I love that this takes a #5 though, since it seems like it would be a good candidate for frankenpenning with a vintage flex nib and nibs that fit aren’t hard to find. 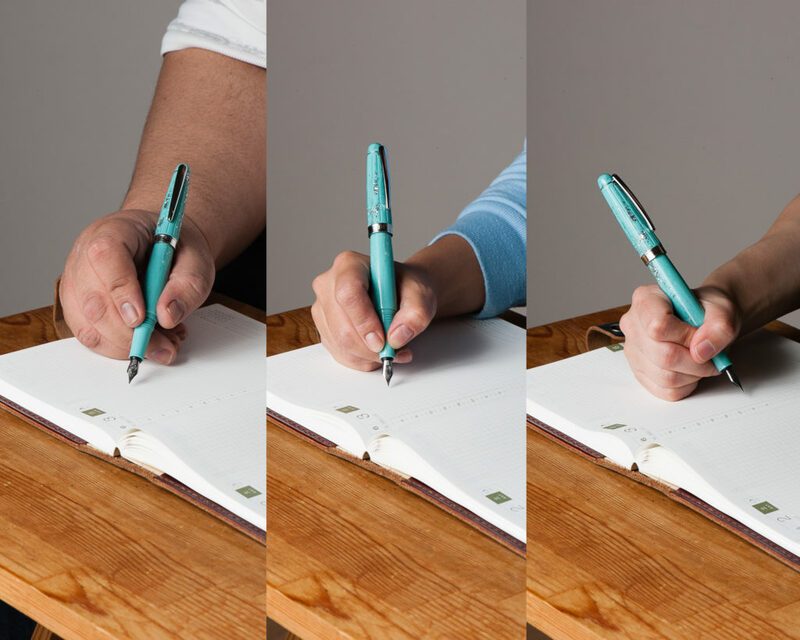 Pam: At first, the nib felt really dry and was unpleasant to write with. 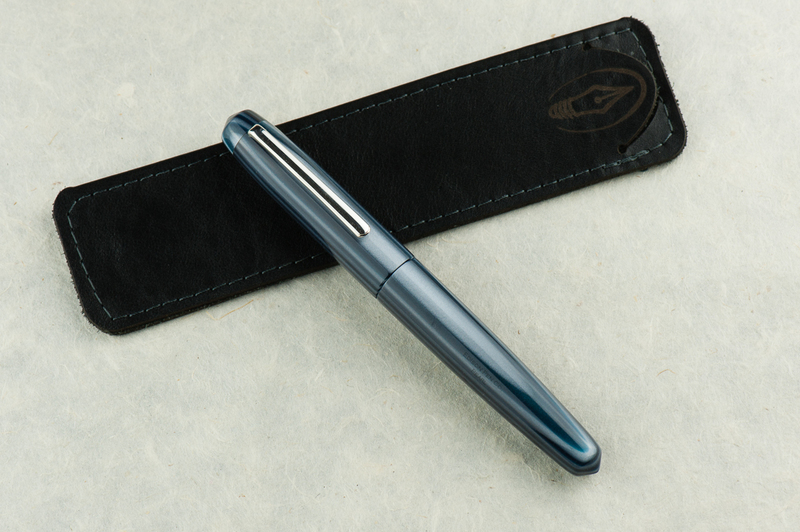 However, a special feature of the pen is the shut off valve. After we opened up the valve and saturated the feed, it was a much more pleasant writer. (Thank you Katherine & Franz!) 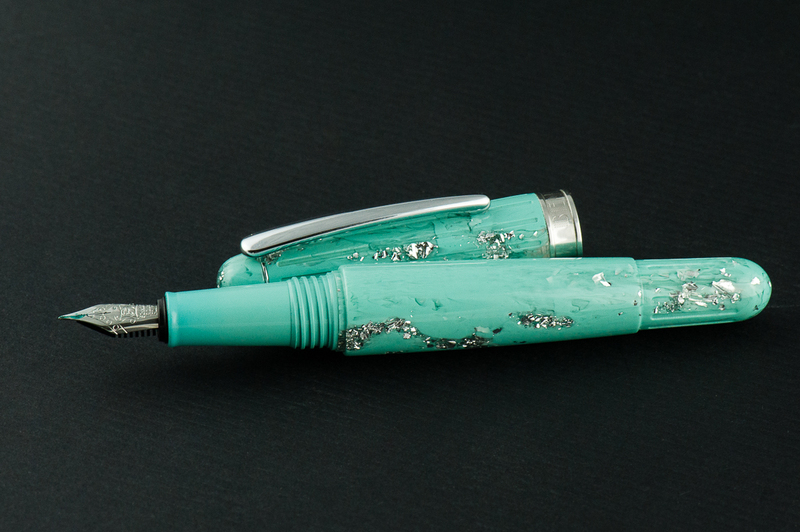 The #5 Jowo nib performed consistently and as expected. 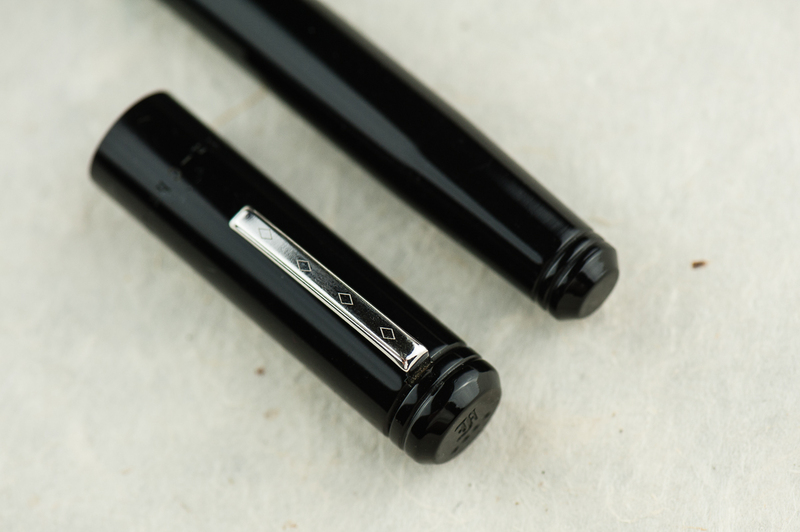 Franz: There is a taper to the section that makes the #5 nib size suitable however, a part of me wishes it came with a #6. That’s just me though. As for the writing experience, it was smooth as can be and wrote nicely. 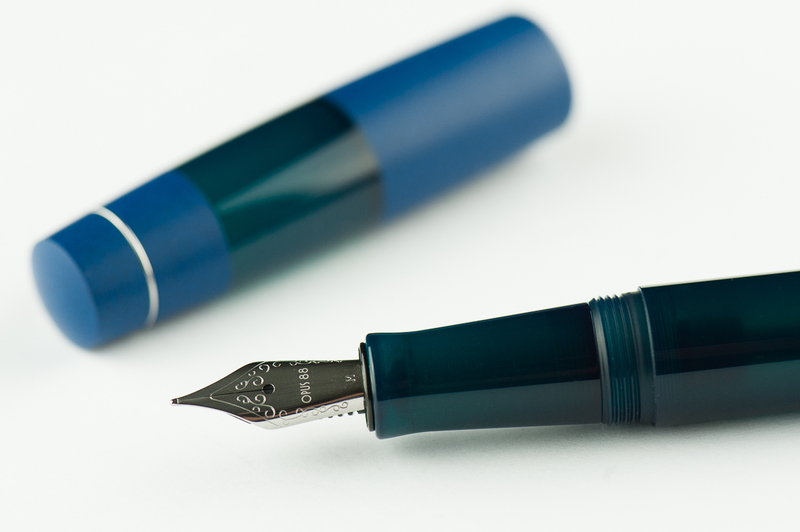 I noticed that the medium nib on the Koloro seems finer than my usual medium Jowo nibs. So I took a loupe and compared it to my other medium #5 Jowo nib. 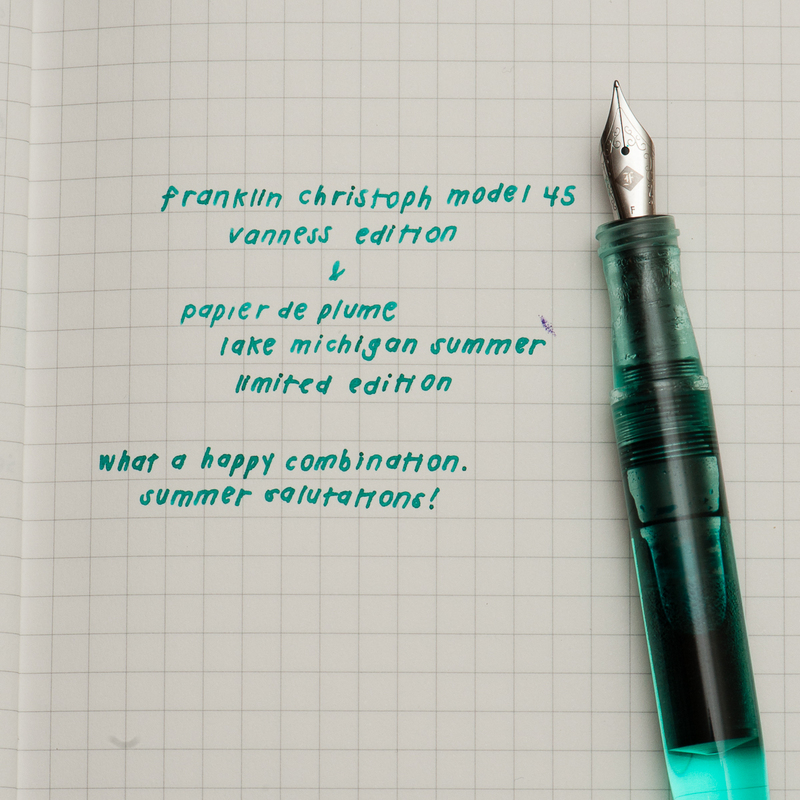 The tipping was slightly smaller/finer than on my Franklin-Christoph Model 45. 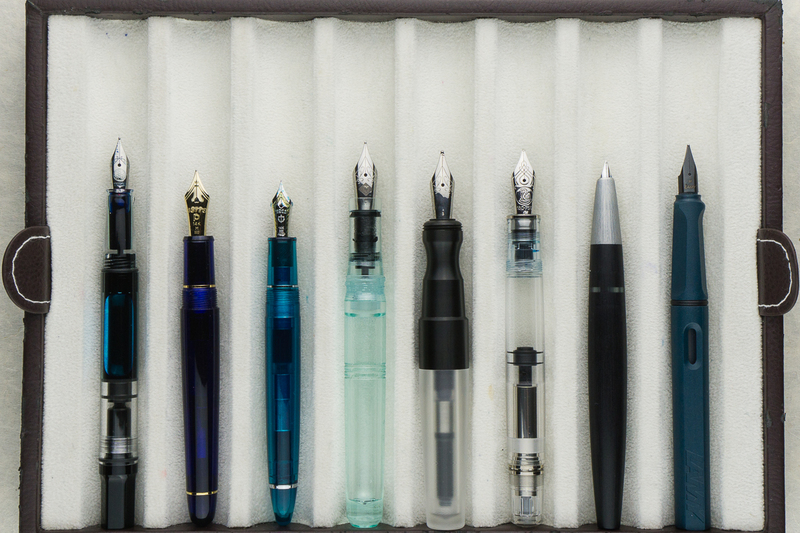 Of course, this is only from one Opus 88 nib unit but I can’t help but think that since these are Taiwanese pens, could it be that their nib line widths are more towards the Japanese size? Franz’s writing sample on a Hippo Noto Pocket A5 notebook with 68 gsm Tomoe River cream paper. 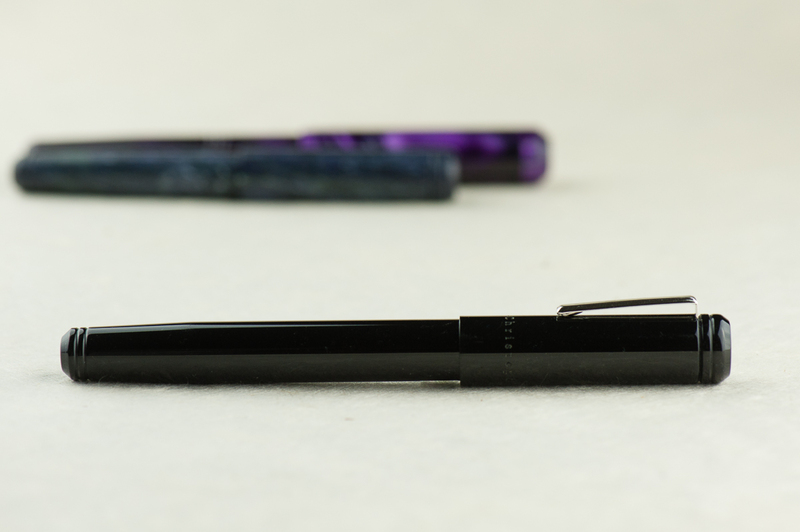 Katherine: The section is maybe a smidge slimmer than perfect, but overall it’s a comfortable pen that’s well balanced in my hand (unposted). 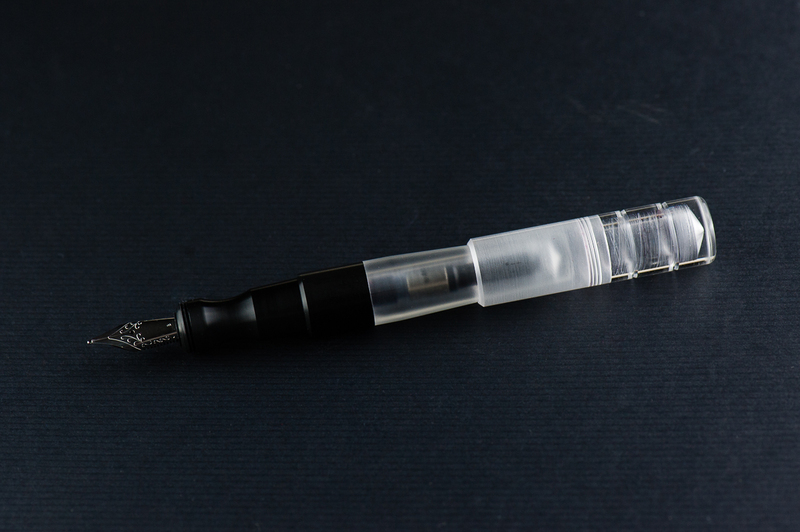 I found it comfortable for long writing sessions, but my one gripe is that once the feed runs dry (because I forgot to open the knob and wrote for a while) it takes a while for the ink to make its way down. 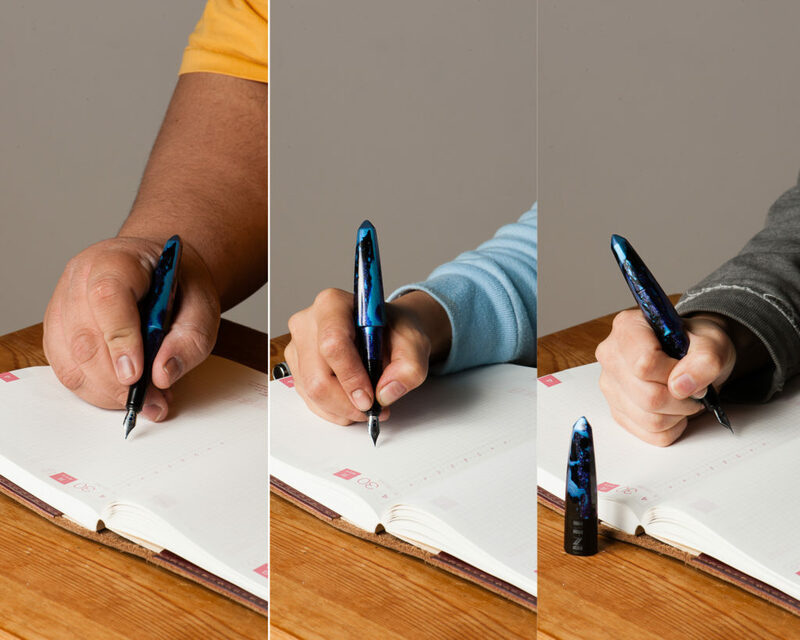 When loosened, it’s great… when I forget, it can be a little annoying, though the pen does keep writing, just more dry. Pam: I had no problem with the width of the pen. I found it to be pretty comfortable actually. The threads and the mild step was a bit sharp for me and had some bite in the tender area where thumb meets palm. It wasn’t painful, but it was very noticable. I had to loosen my grip and readjust multiple times during the prolonged writing session. Franz: I wrote in my journal with the Koloro for a good chunk of time and I did not experience any fatigue. I do prefer writing with the cap posted but it’s perfectly usable even when unposted due to the length of the section. 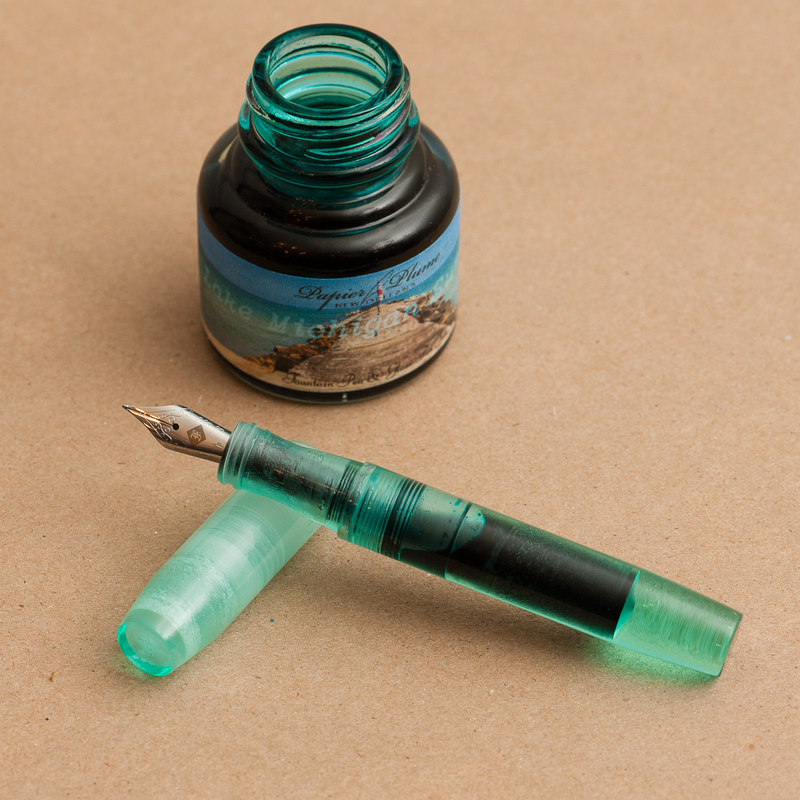 It was my first time to use a Japanese-style eyedropper and as long as the blind cap was unscrewed, the ink flows as it should. Katherine: Sorry, three cap turns is just too many. I take a lot of stop and go notes… and this just doesn’t work. Otherwise, the clip feels strong and is maybe a smidge tight, but seems secure and comfortable. Pam: I couldn’t use this pen at work since it took far too many turns to uncap to be a good EDC at work. It is definitely a 2 hand operation. If that’s not a hinderance for you, the clip did keep the pen secure in my pen case. 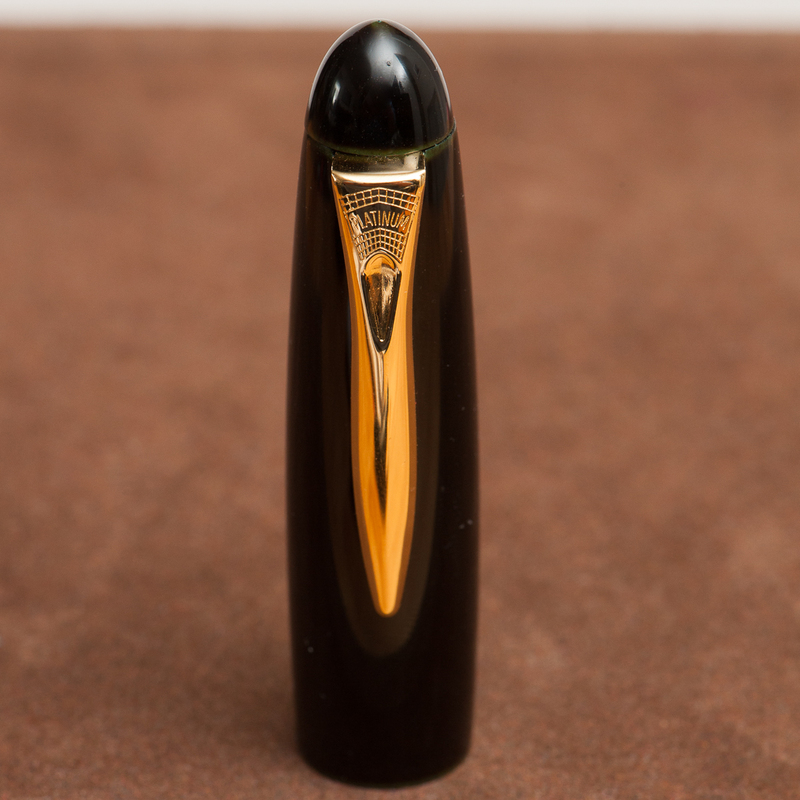 Franz: Like the ladies above, uncapping the Koloro took a while and with a work setting of having the need to constantly cap and uncap, definitely was an irritation. 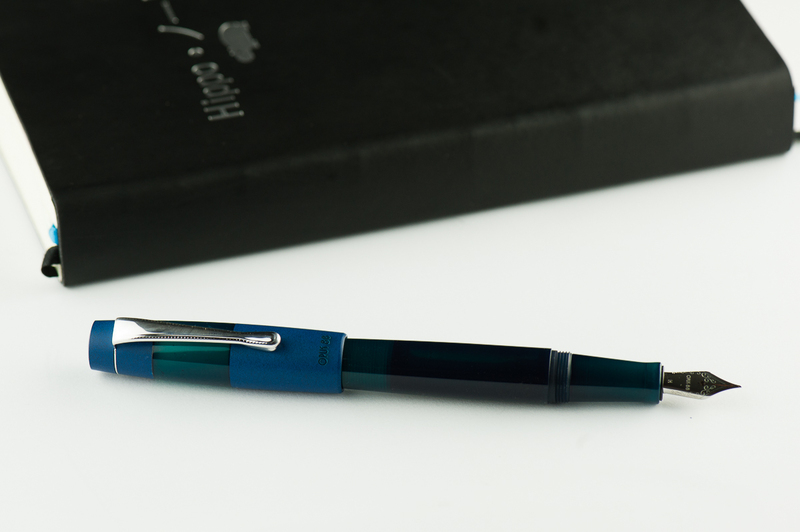 As long as one doesn’t have the need for quick deploy, the Koloro is a great pen to use on the daily. 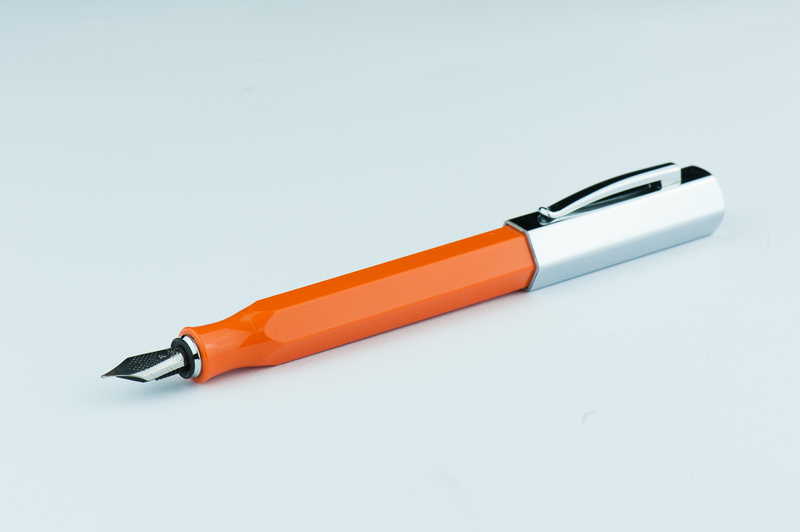 I actually liked using this pen while taking notes on a conference call. 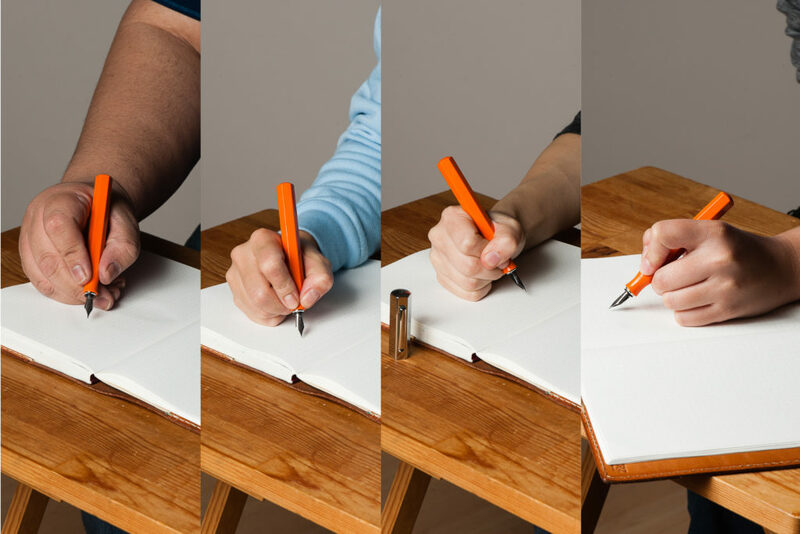 The build of the pen seems sturdy and can withstand being jostled around in a pocket or a bag. 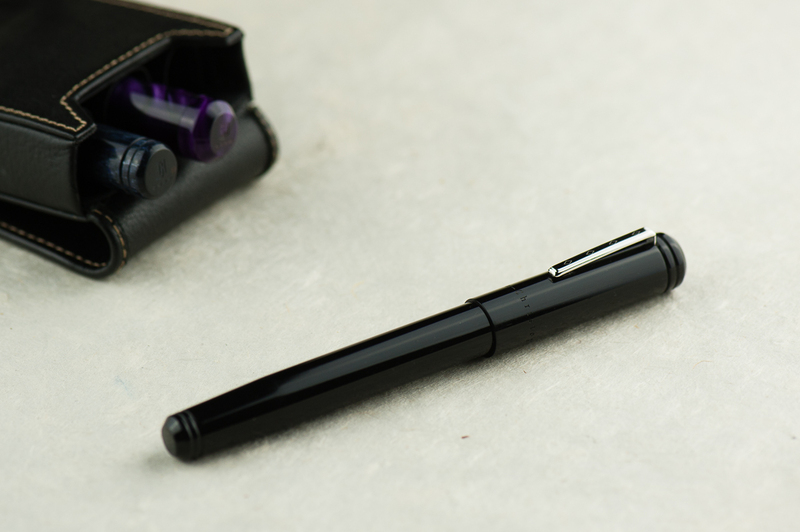 The eyedropper filling system allows the pen to have a little over 2 milliliters of ink for a lot of writing. 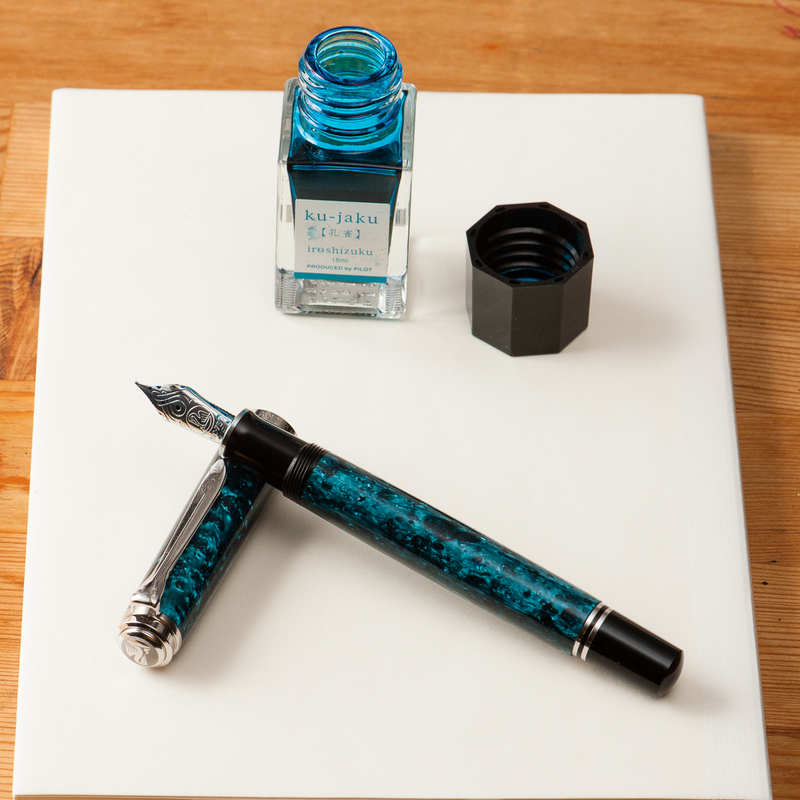 The photo below shows the Koloro’s ink chamber and eyedropper’s plunger rod slightly pulled back. 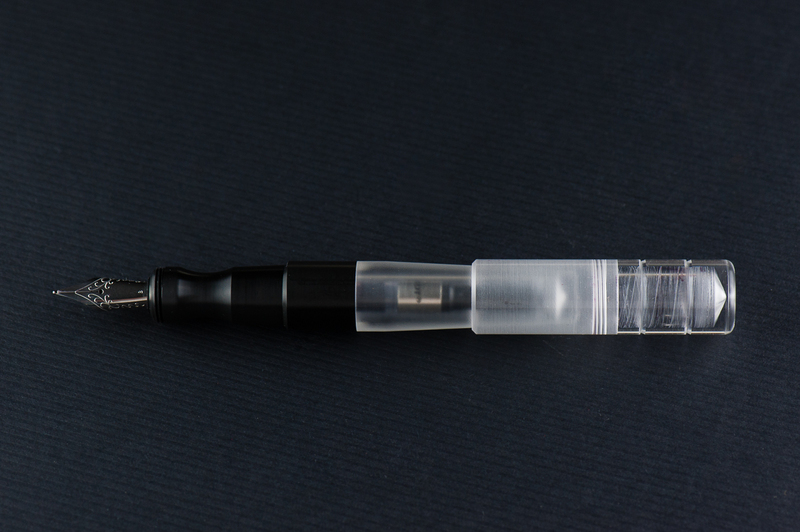 The section does have an O-ring which prevents ink from leaking out. 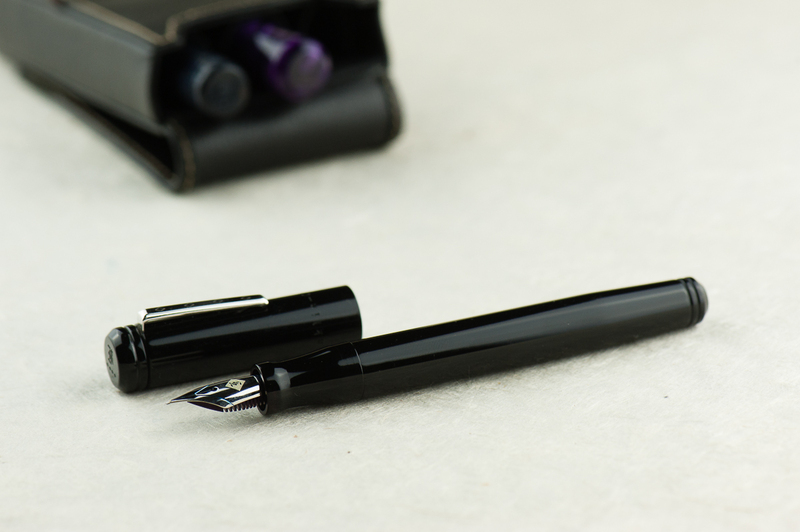 Katherine: I’m really excited that a modern maker has chosen to build a pen with the Japanese Eyedropper mechanism! 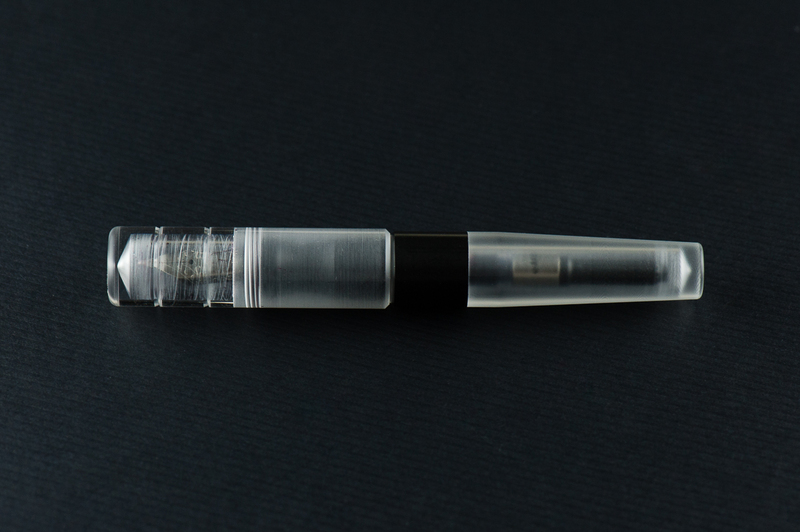 This pen doesn’t do it for me aesthetically, but it’s solidly made and writes well — I can’t wait to see what else Opus 88 comes up with! Pam: The price is fair for what you get in this pen. 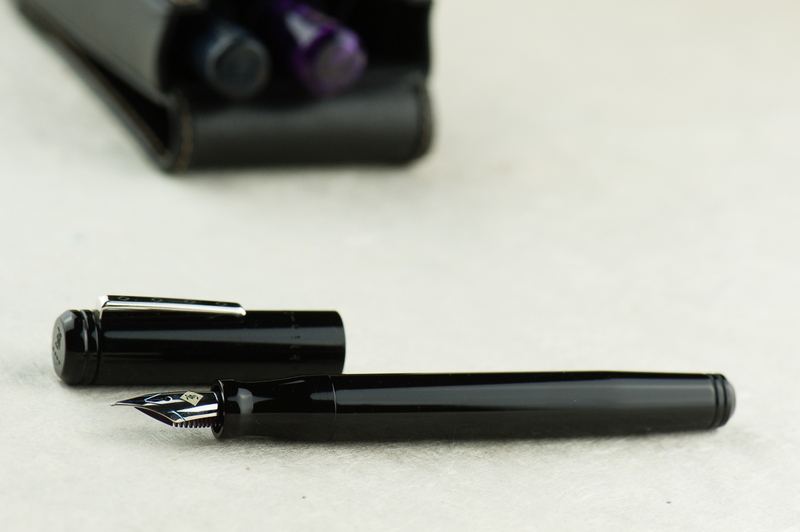 If you like the aesthetic, want a relatively novel eyedropper with shut off valve, and a reliable nib, you will be hard pressed to find a better alternative. 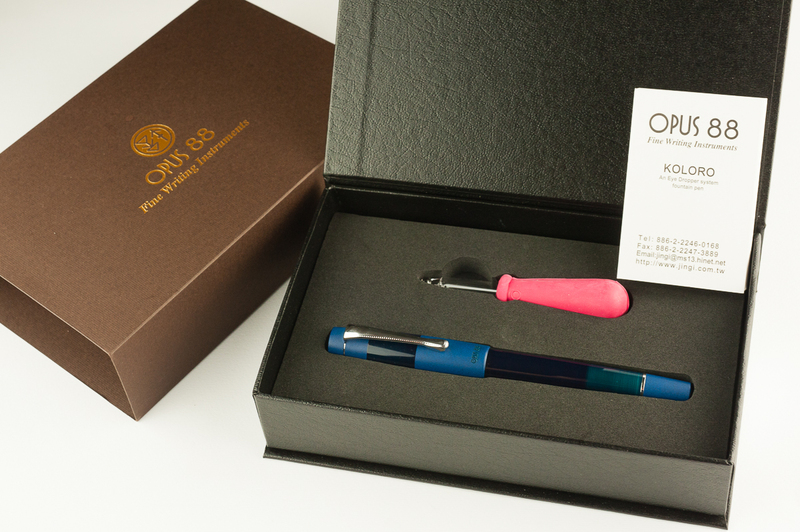 This pen is not for me mostly due to personal preferences, however, as an introduction to Opus 88, it’s a solid opening volley. Bring it on Opus 88! 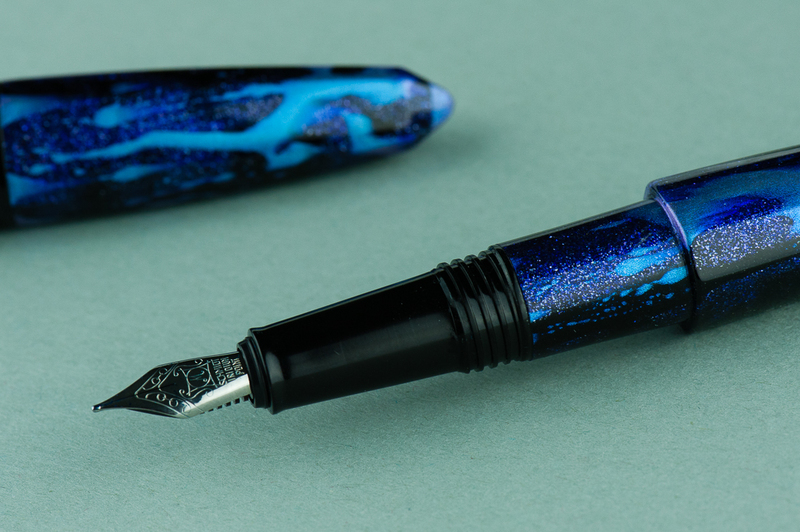 Franz: One thing I would say that’s a negative (for me) is because the Koloro’s barrel is acrylic, I don’t get the warm ebonite feel while writing. 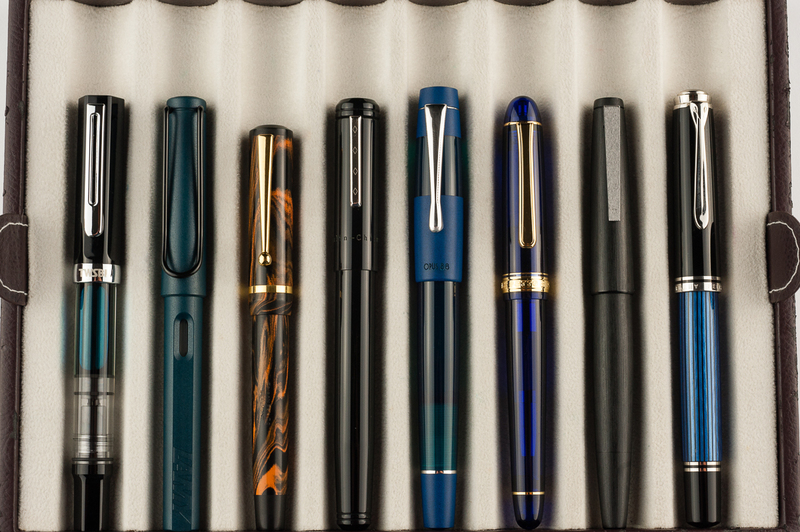 I only have a few ebonite pens but the warm feel is something that I’ve come to expect. That’s just my personal thing though. 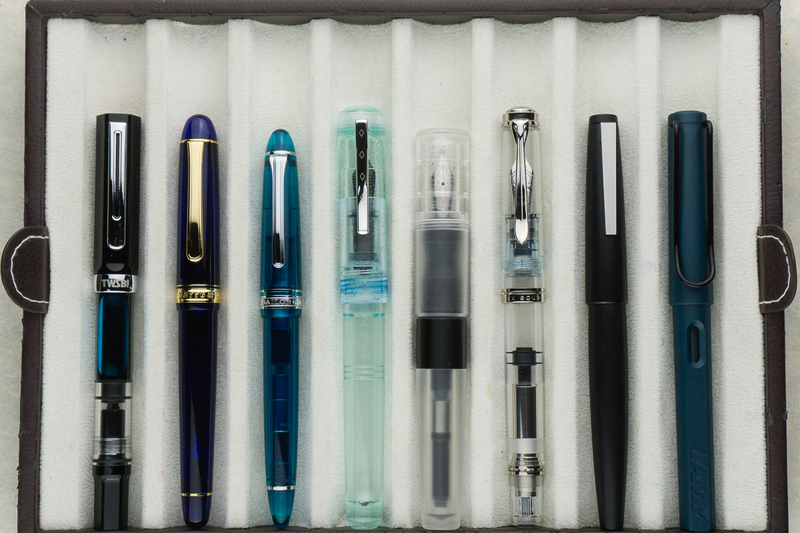 The Koloro is a fantastic pen to use as it has a lot going for it (fairly large size, Japanese eyedropper filling system, different color choices) and as Pam mentioned, it’s at a fair price. 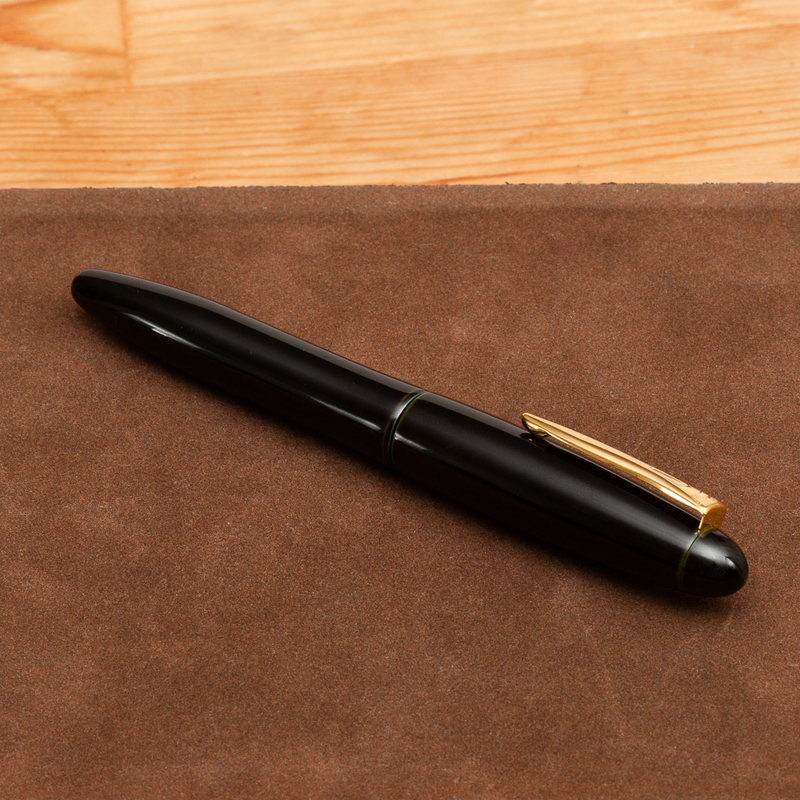 It is a pen I find myself using a lot for my journal time whenever I do get the time. 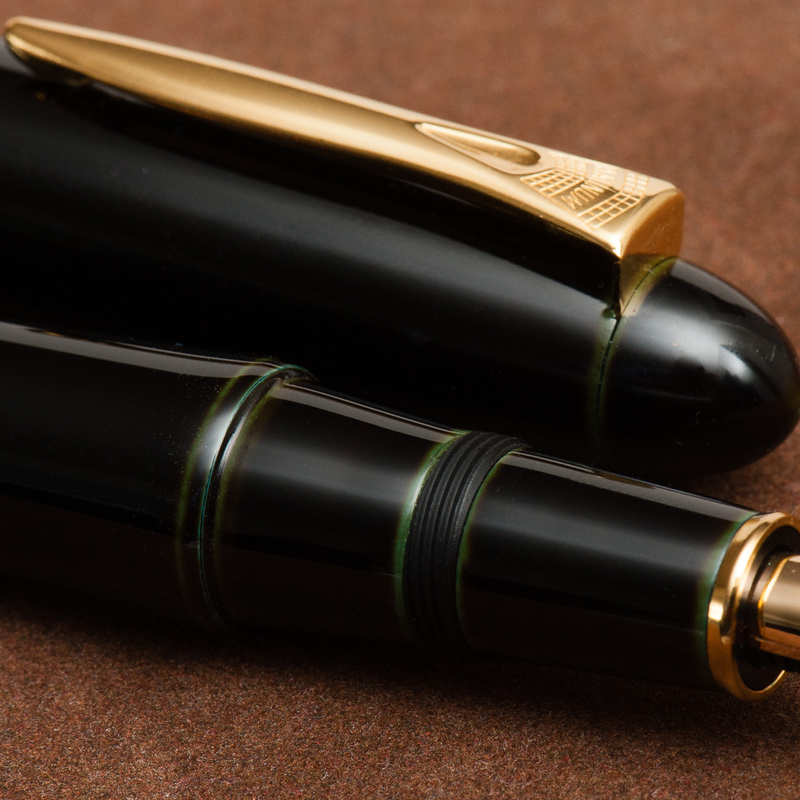 Once again, thank you to Goldspot Pens for providing this pen for review. 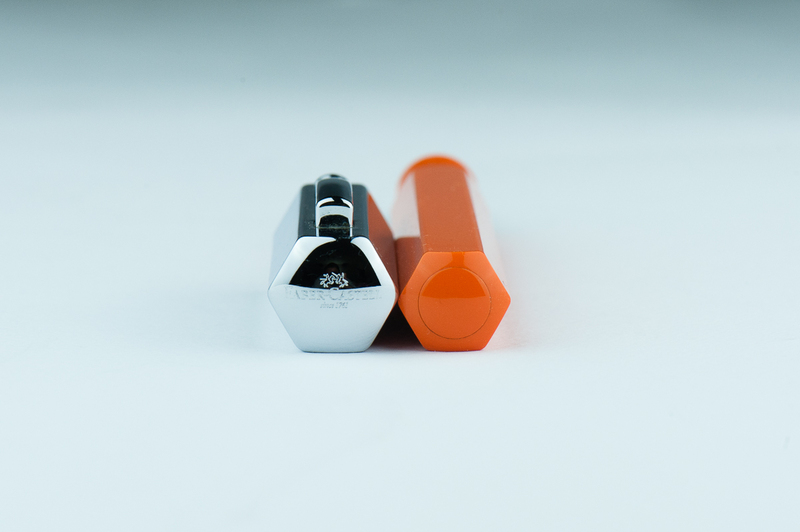 If you’re interested in the Koloro, check out the other options on their site, here. We received this pen free of charge for the purposes of this review. We were not compensated monetarily for our review. Everything you’ve read here is our own opinions.